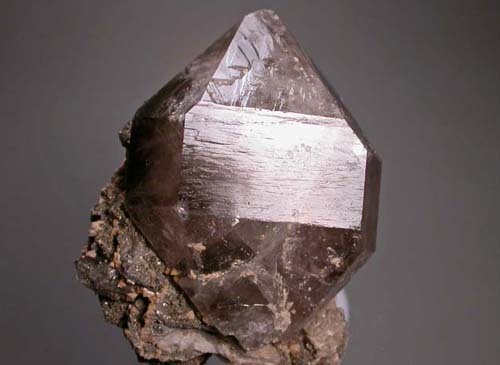 Svanbergite, Mt. Brusiloff Mine, Radium Hot Springs, B.C. Click Here to View 100 Most Recently Added Specimens! My inventory is different than most mineral dealers! "Road To the Red Cloud Mine"
I have added a new article entitled "Road to the Red Cloud Mine" to my website in the "Articles" Section. Travel with me from Tucson to the Red Cloud Mine and see what it is like there and on the way there! 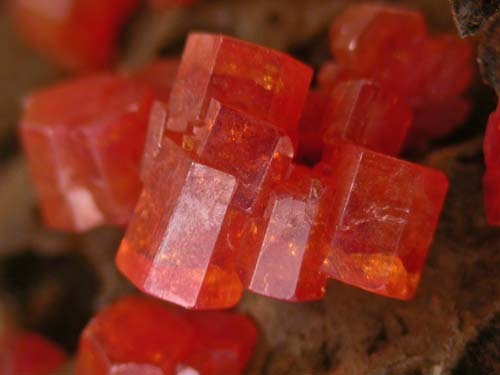 I have loaded some nice and affordable willemite and wulfenite specimens from the Red Cloud Mine onto this website. I had a very scenic collecting trip to a locality near Safford, AZ with friends a little while back. Beautiful scenery and we even found some fluorescent chalcedony and visited the Morenci Mine. In the "Recent Activities" section of this website. I was fortunate to pick up several nice specimens from the collection of the late Rock Currier, recently. 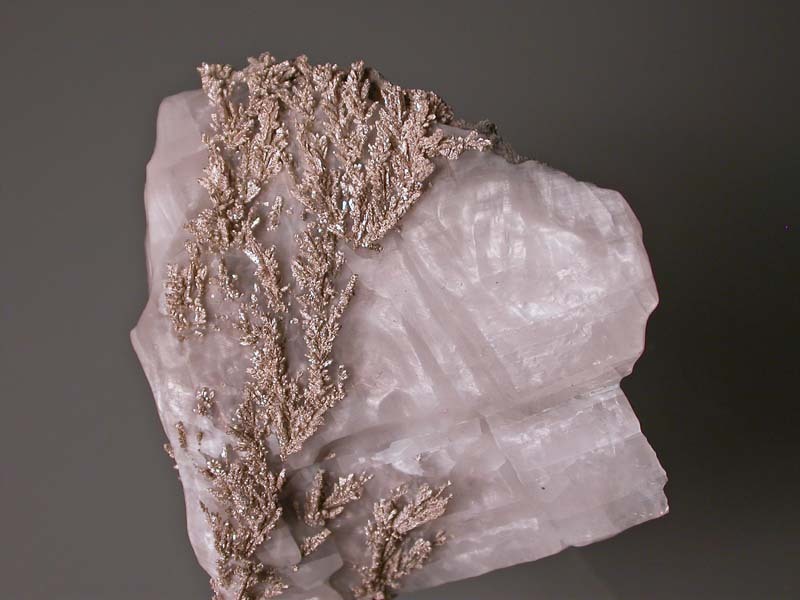 Look in the "100 Most Recently Added Mineral Specimens" feature on the Home Page of my website to see them. 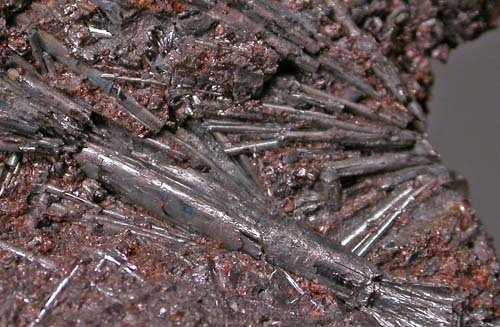 Native Arsenic from Pibram, Czech Republic. I've added some excellent native arsenic specimens from the classic Pibram area, to the website. Under "Native Elements". 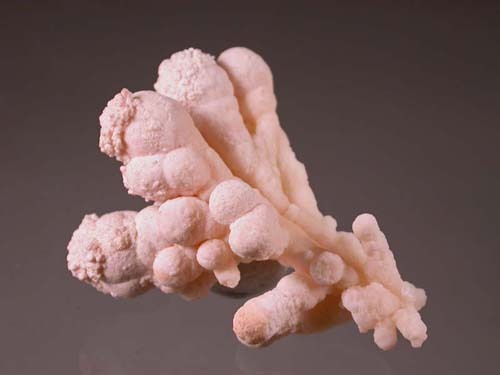 I've added a number of nice calcite crystal specimens from Tsumeb to my website. 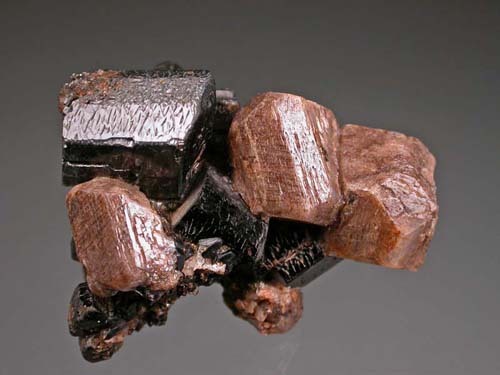 Check them out in the main Minerals list under "Tsumeb, Calcite"
I've added some excellent native iron specimens to my website. 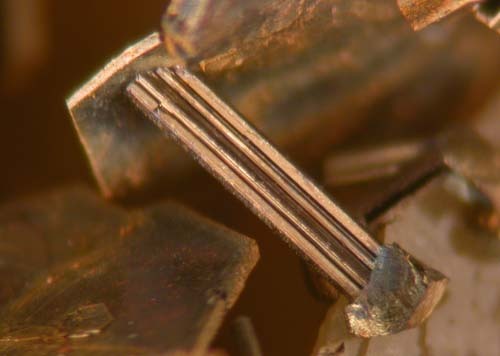 There are terrestrial iron not meteoric. 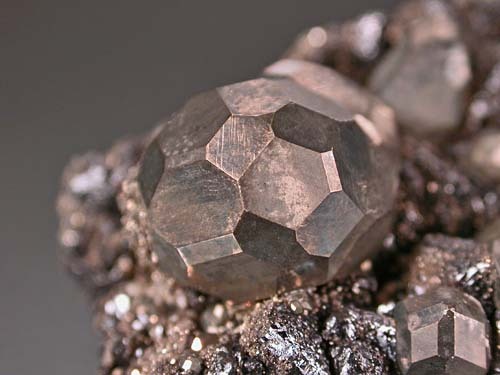 Check them out under "Iron" in the main Minerals listing. There are also some interesting Canadian specimens, as well! I've added many new specimens to the website particularly United States but, as well, excellent specimens from other parts of the world, England, Russia, France, etc. 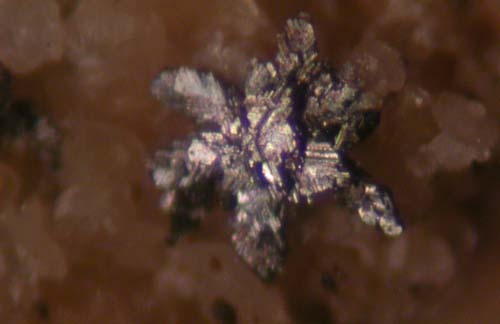 Have a look in the "100 Most Recently Added Specimens" listings on the Home Page of this website. Lots of new Canadian Mineral specimens on my website! Lots of new, interesting Cobalt Silver Camp specimens on my website. Have a look? I've added a number of very nice new sphalerite, celestine and fluorite specimens from Southern Ontario. Check them out? 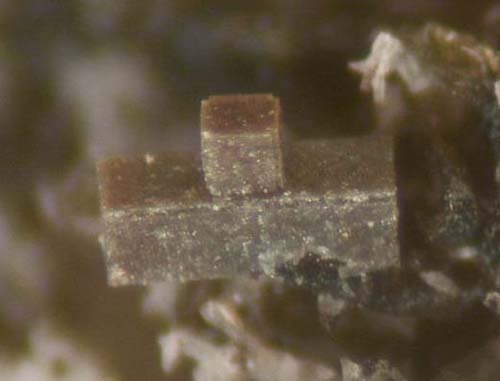 I've put a number of excellent steacyite micro specimens on my website. Check them out in the "100 Most Recent" feature or under "Mont Saint-Hilaire"? 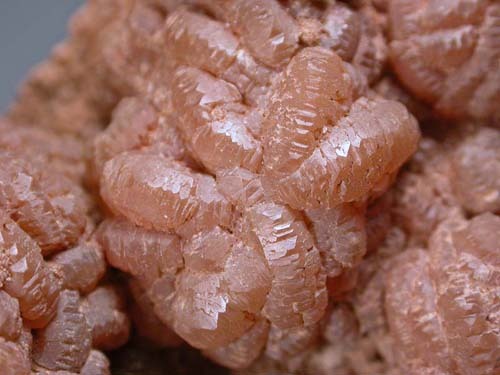 I've added many new specimens of serandite and analcime to the website. 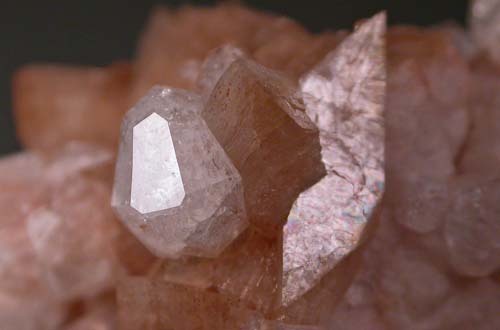 Look in the main Minerals Listing under "Mont Saint-Hilaire". 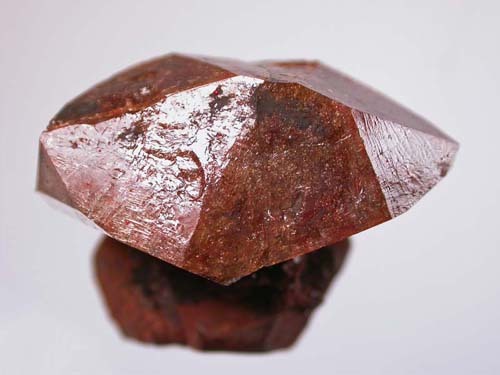 I've added a number of very nice callaghanite specimens to the website, in the main "Minerals" listings, under that heading. 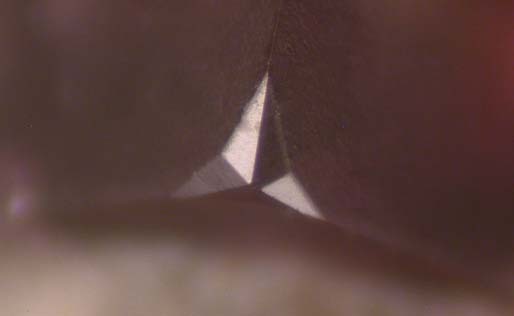 Sharp micro crystals! Beautiful blue colour! 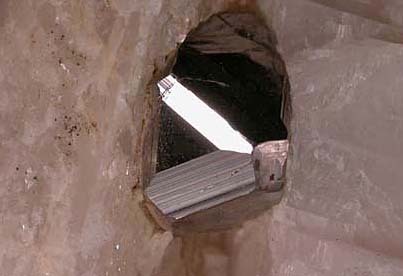 When mines were in operation at Bisbee, AZ, on occasion, caves would be encountered in the limestone host rock. Often the caves were full of speleothems! I've added a number of interesting ones to the website. 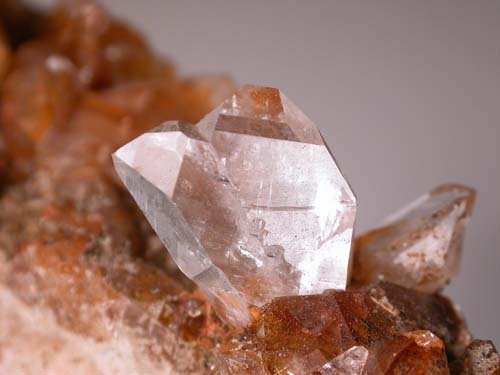 Look under "Calcite" in the main Minerals listings. 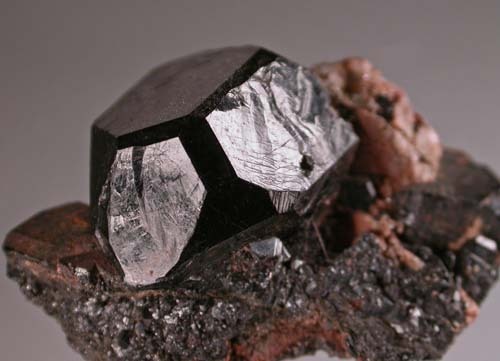 I've added a number of really nice and reasonably priced galena specimens from the Huanzala Mine, Peru to the website! Check them out!? 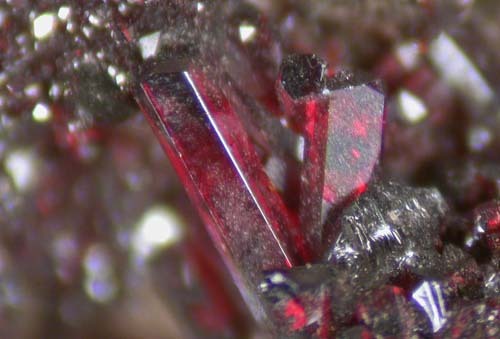 There are a bunch of new cuprite specimens from the famous Tsumeb Mine on the website. Check them out in the "100 Most Recently Added" feature on the home page of this website. 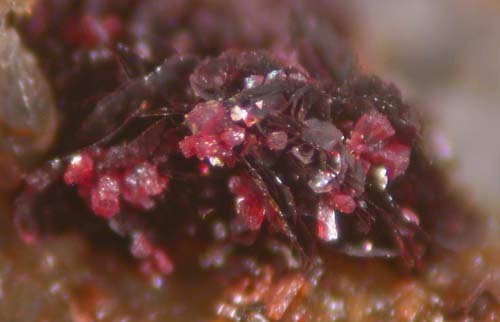 I've added some excellent specimens of gersdorffite, skutterudite and proustite to this website, some of the specimens world class! Check them out? 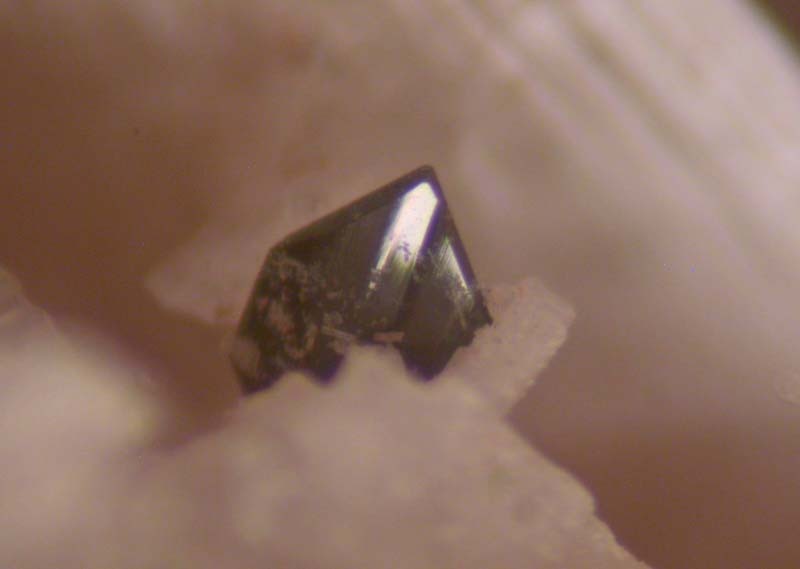 I've added many new weloganite dawsonite and dresserite specimens to my website. 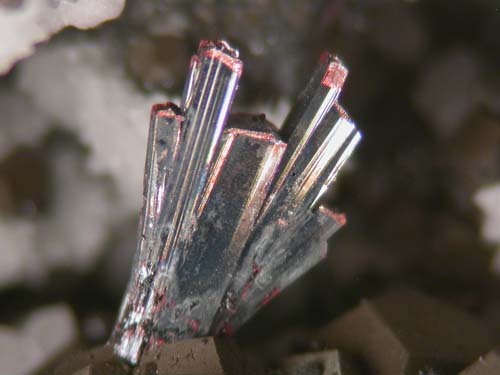 Check them out in the "!00 Most Recently Added Minerals" feature on the home Page of this site or under "Francon" in the main minerals listings. There are some fabulous older specimens, as well. Hello Everyone, Al e-mail issues have been resolved. No problems now. Thank you for patience! 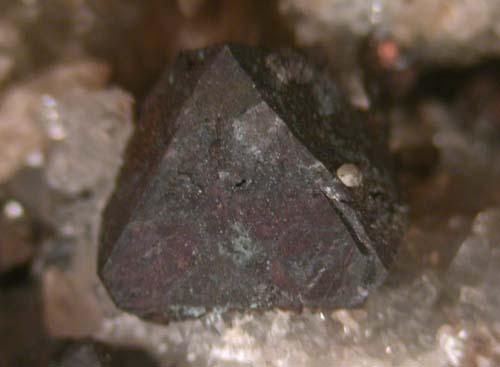 There are quite a few new sphalerite and Galena specimens on the website from the Tri-State area and the Elmwood Mine. 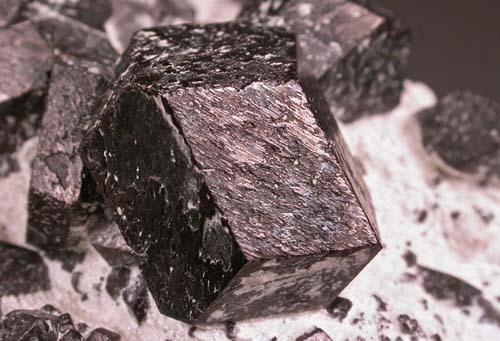 Check them out under "Sulphides" in the main Minerals Listings. 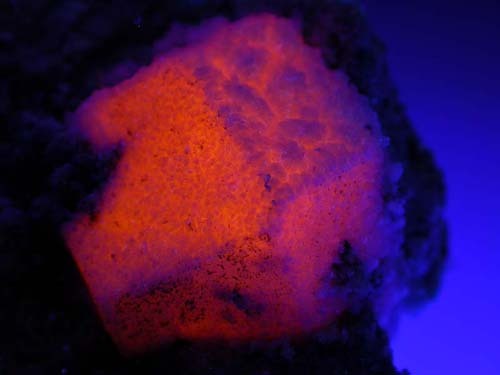 I've added a number of flashy, some rare, fluorescent minerals from the famous Franklin, New Jersey locality. 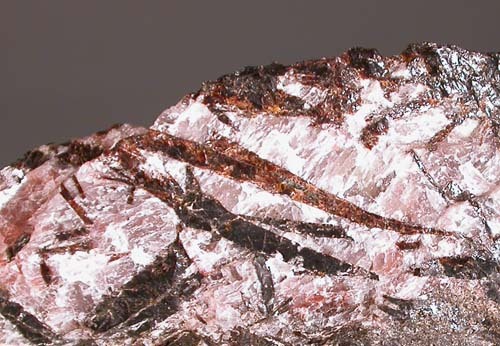 Look under "Franklin" in the Main Minerals Listings. Collection of Sulphides and Sulphosalts! 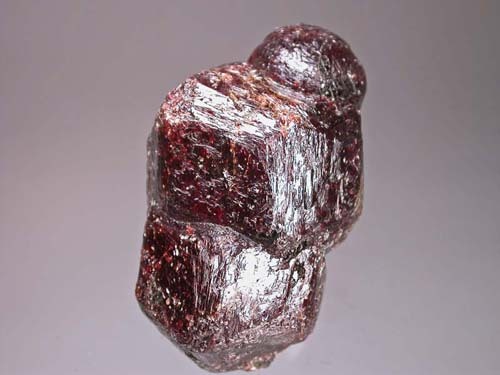 I am selling all of the international sulphides and sulphosalts from my personal collection. The numbers are not large but there are some excellent mineral specimens. 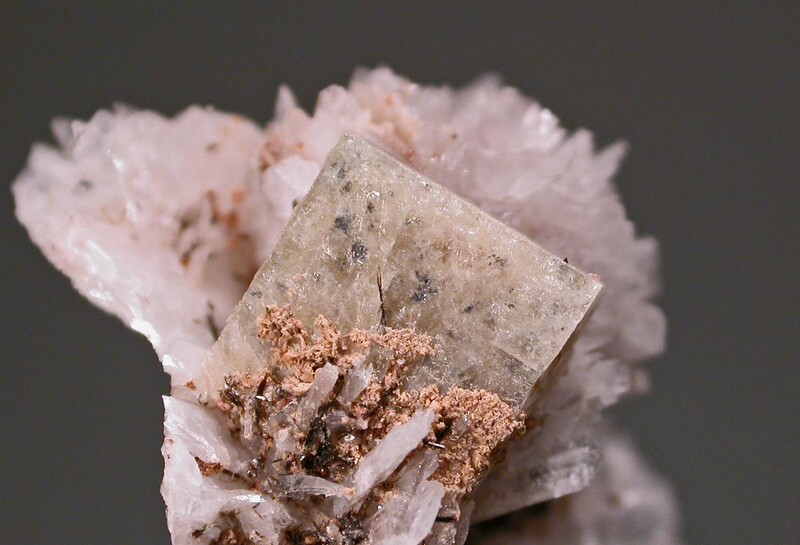 Check them out in the "100 Most Recently Added Mineral Specimens" feature on the home page of this website or look under the "new" flags in the main minerals listing. These are specimens that I have obtained over 45 years or so. If I have any old labels or information, I will pass them on to the purchasers. 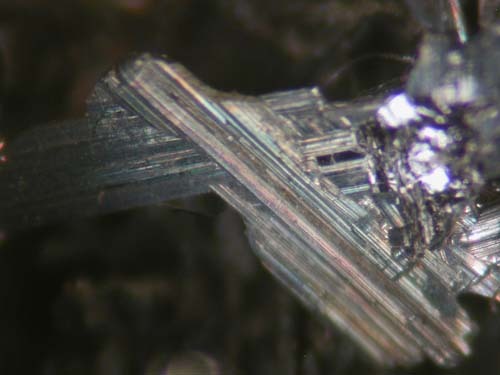 I've added some interesting specimens of various arsenide minerals, maucherite, ullmannite, and nickeline including nice crystals of nickeline, to this website. 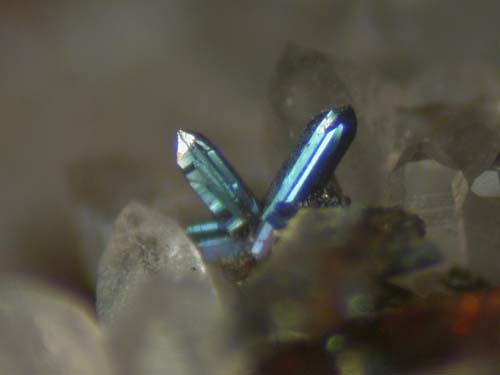 The specimens are in the "Cobalt" pages of the main minerals listing. 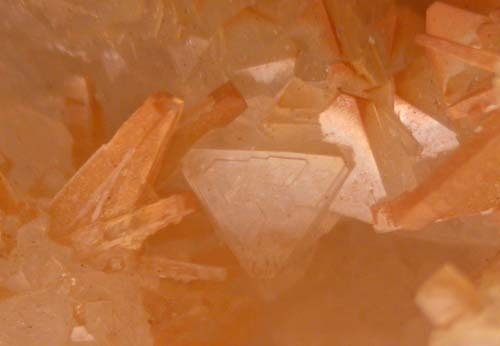 I've added several specimens of a someday-new mineral, UK-39 from Mont Saint-Hilaire. 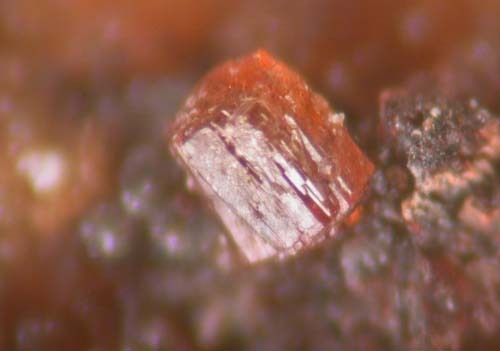 This mineral was thought to be tadhzikite-(Ce) but has been found to be a new member of the Hellandite Group. 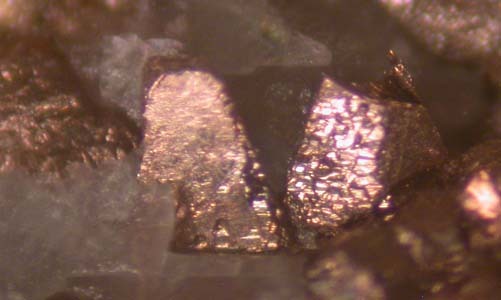 Check it out under "Mont Saint Hilaire-Various Minerals". 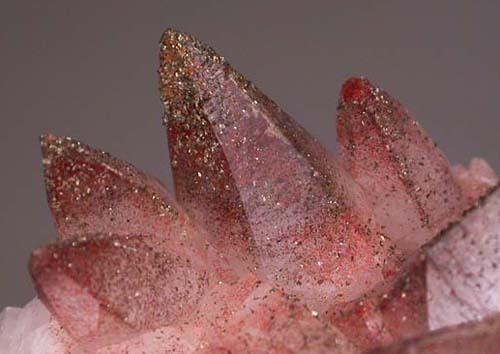 These and other new minerals can be seen in the "100 Most Recently Added Mineral Specimens" on the home page of this website. 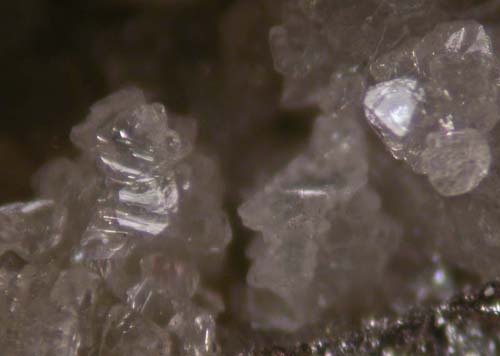 I went through my Van Silver Mine Sulphosalt specimens and pulled a few more really good ones out. That is it! 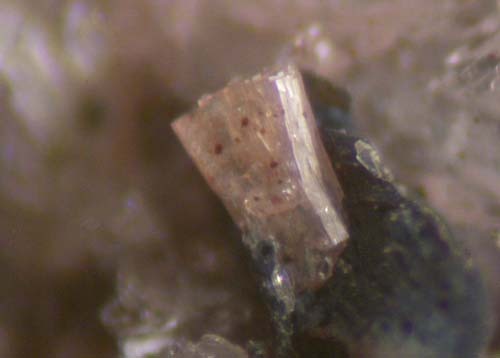 Future additions of minerals from this locality will be more modest. 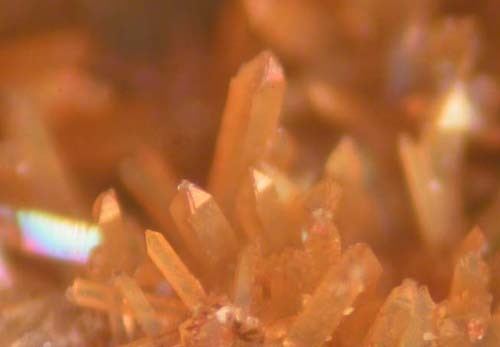 I've added some very nice new sphalerite, fluorite, calcite and gypsum specimens to this website. Check them out under "Southern Ontario Limestone Quarries" in the main "Minerals" listings? I've added a new article to the "Articles" section of this website. It is entitled "Internal Examination of Sperrylite-Bearing Sulphide Specimens using a CT Scanner". 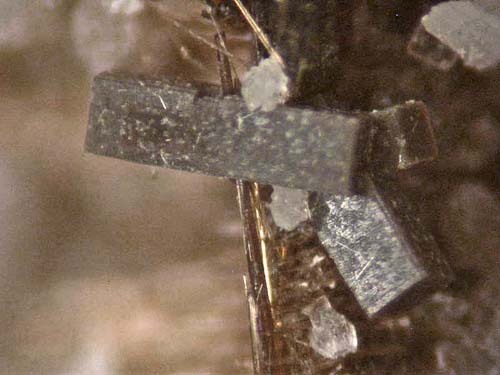 The article is co-written with well known collector Dr. D. V. Doell and chronicles our work to x-ray sulphide specimens to see if there were sperrylite crystals inside. Check it out! 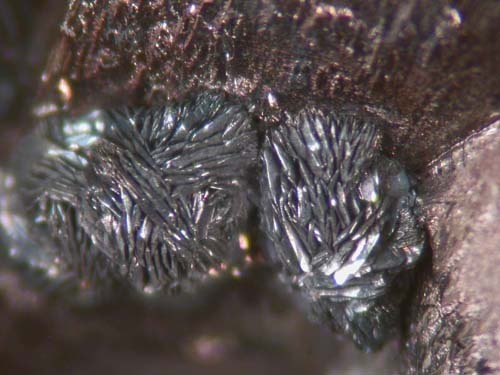 I've added a number of old specimens from the Cobalt Mining Camp to my website under "Cobalt, Old Collection" in the main Minerals listing of the website (or in the 100 Most Recently Added" feature). Most have pre-1923 handwritten tags with them, many from unusual locations. Van Silver Mine! 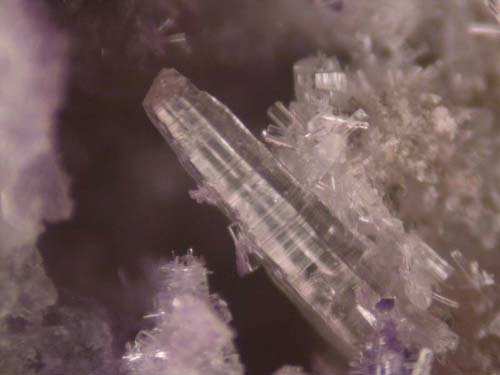 Check out the excellent sulphosalt crystal specimens from the collection of the late Ty Balacko under Van Silver Mine" in the main Minerals listings or in the "100 Most Recently Added" feature on the home page. 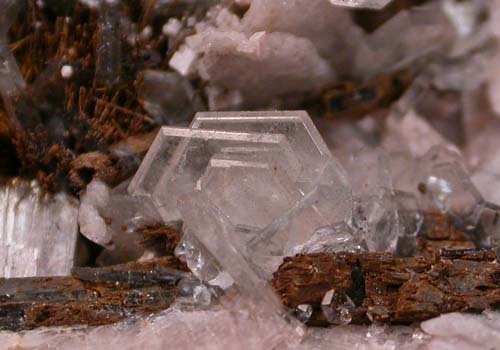 Ty was the top collector of these specimens and assembled a collection of excellent crystals. 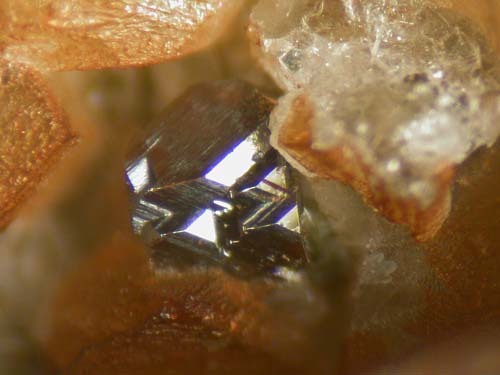 I've added some very rich, well crystallized, silver specimens from the famous Batopilas silver mining area of Mexico to this website. We don't see specimens like these very often! 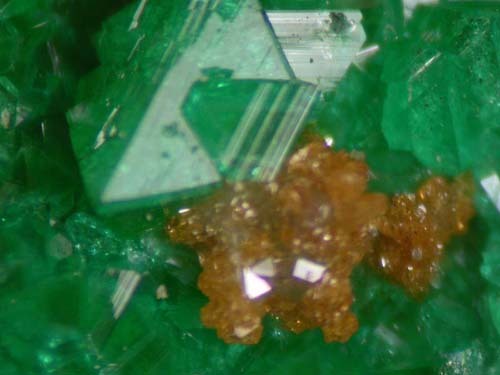 Small clusters of bright green, sharp, pyromorphite crystals from this long closed mine. 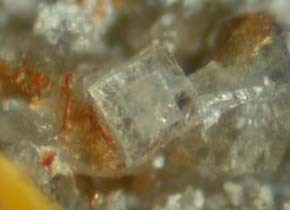 I've added some very nice, top notch gmelinite specimens, from Nova Scotia, to my website. Hard to get better! 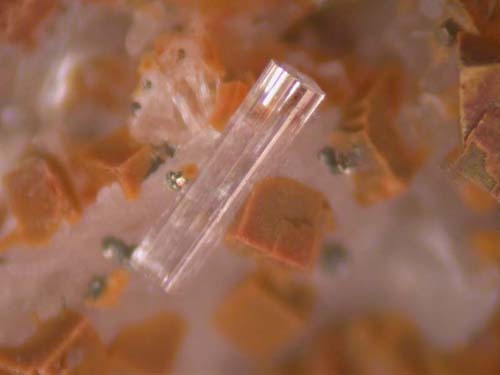 These are some of the most interesting and beautiful calcite crystals around! Here is a rare one! 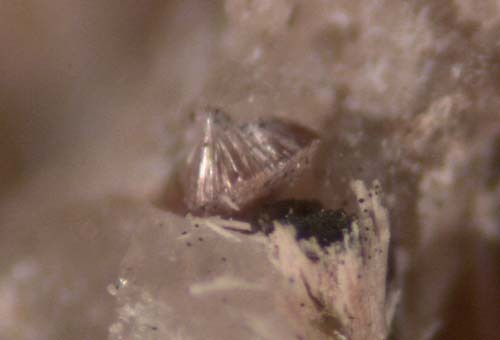 All of these specimens have sharp, crystals of the rare tin-calcium borate Nordenskioldine, associated with lollingite from the remote Yukon. Unusual pseudomorphs from a classic location! 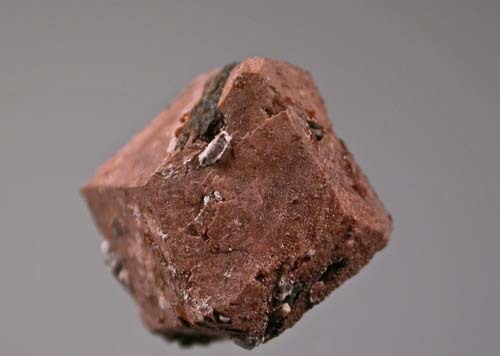 I've added a number of unusual sulphides and sulphosalts to this website. Check them out in the "50 Most Recent Specimens" feature on my Home page? 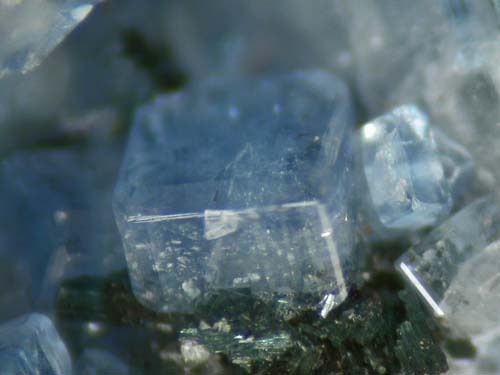 I've added some really nice international minerals to the website including Spanish fluorites, an Afghan Aquamarine, a couple of interesting Chinese fluorite specimens, a Chinese cassiterite and some nice sulphides/arsenides. Check them out in the "50 Most Recently Added Specimens" feature on this home page? 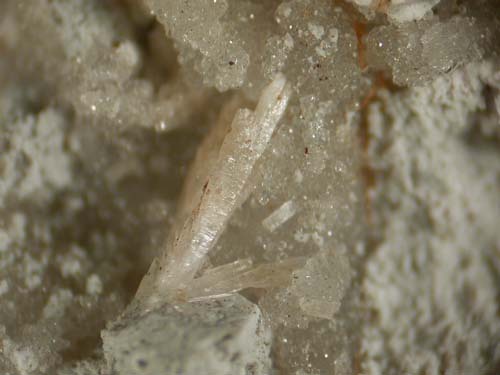 There are some unusual celestine specimens from one of the limestone quarries near Amherstburg, Ontario, now on the website under South Ontario Limestone Quarries in the main Minerals Listings. 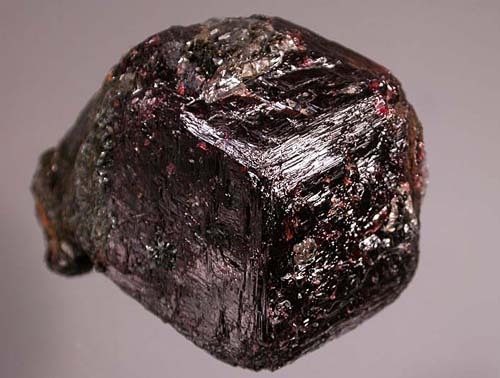 I am fortunate to have obtained some very nice, rich specimens of this rare mineral from an unusual locality in the Yukon. 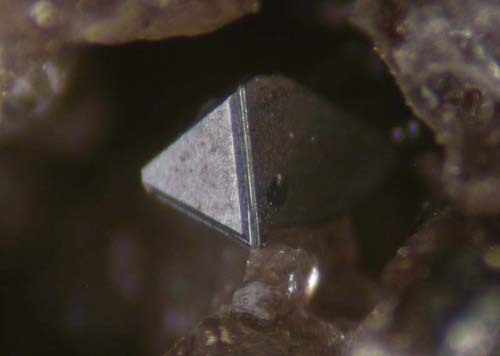 The cubic polymorph of Greenockite. 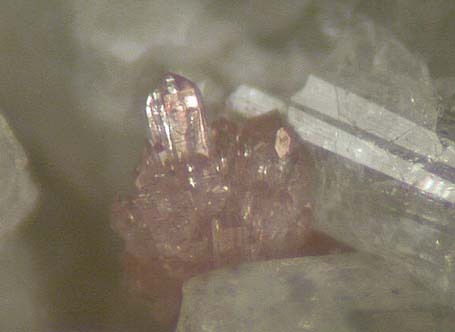 Look under Hawleyite in the main Minerals Listings. 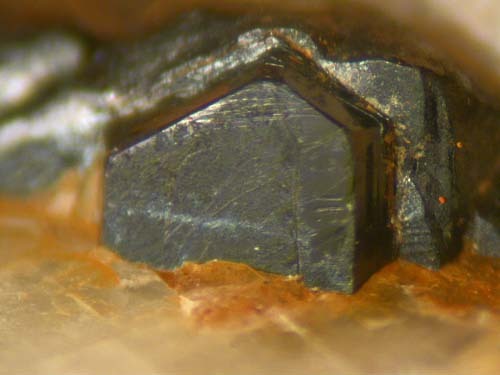 I've added some excellent proustite specimens from the Bouismas Mine to the website. 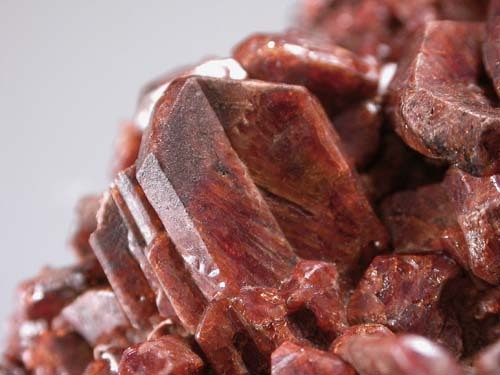 Check them out under Morocco in the main minerals listings. 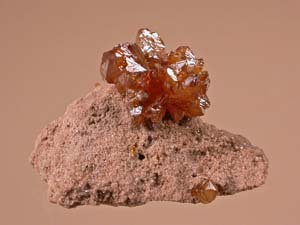 There are some new Stromeyerite specimens on my website. Unlike most that I have seen for sale, these ones actually ARE Stromeyerite. They have been analysed. 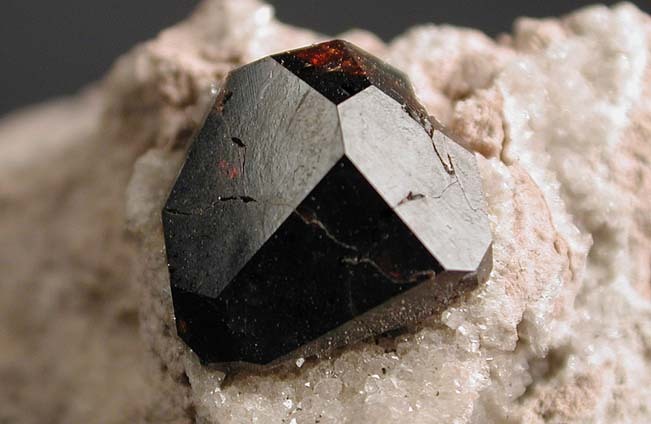 Ave added some of the best gersdorffite specimens that I've ever seen to my website. Check them out! 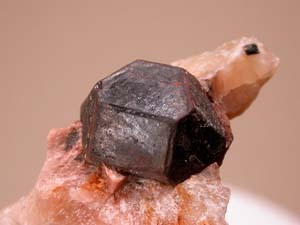 I've loaded a number of unique and interesting minerals from, mostly, Ontario and Quebec to my website. 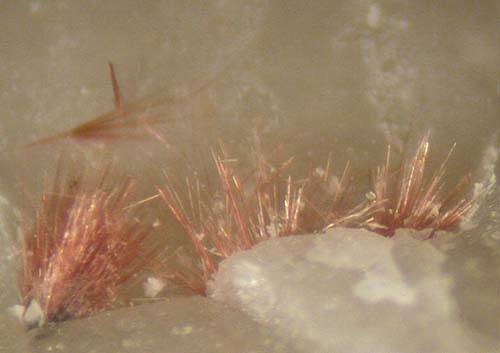 Check them out in the "50 Most Recently Added Specimens" feature on the home page or under the "NEW" Flags in the main Minerals listings. I added a number of mineral specimens from Franklin to my website a couple of weeks ago and they were quickly snapped up. I found another flat and have uploaded these to this website. 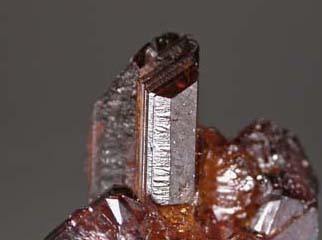 Check them out under "Franklin" in the main Minerals section of this website. There are a number of really nice, new gold specimens on the website. Check out the "NEW" flags under "Gold" in the main minerals listings. 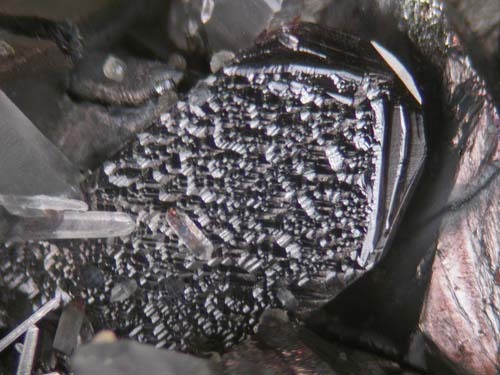 I've added some nice Bolivian bournonite and stannite specimens to the website. You can see them under "Bolivian Minerals" in the main Minerals Listings. 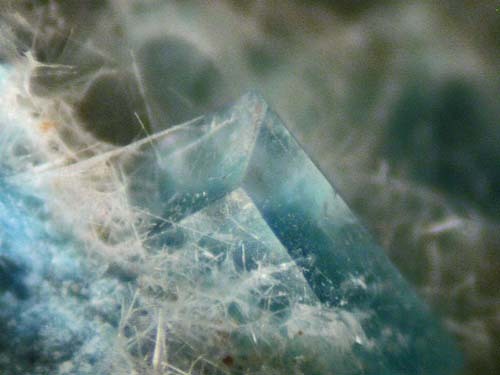 Check out the world class brewsterite crystals on specimens under "Brewsterite, Yellow Lake". 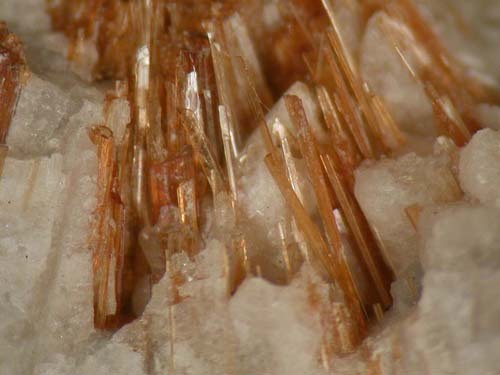 Check out the pages under "Zeolites, Bay of Fundy, Nova Scotia" and "Copper, Cape D'Or" to see many new, excellent specimens from the Bay of Fundy region, including Copper, analcime, heulandite, chabazite, stilbite, etc. 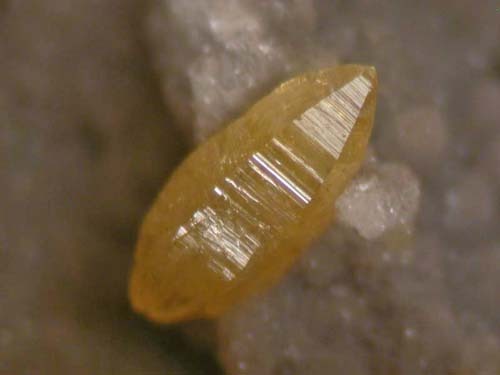 A number of new almeidaite, microlite, xenotime and greifensteinite crystal specimens on the website under "Brazilian Minerals" in the main Minerals listings of this website. 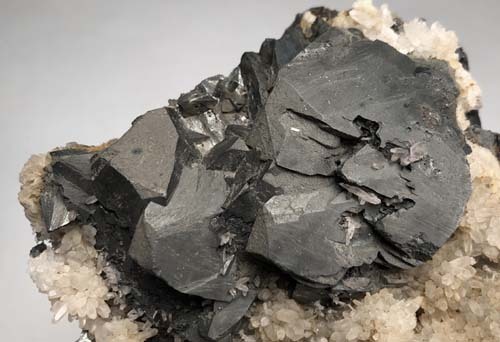 There are many excellent new minerals particularly minerals from the Quiruvilca and Casapalca Mines, including hutchinsonite, enargite, tetrahedrite and many others. 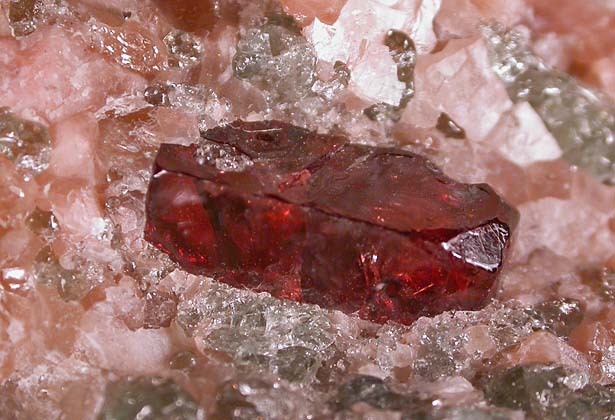 Look in the "Peru" pages in the main Minerals listings. 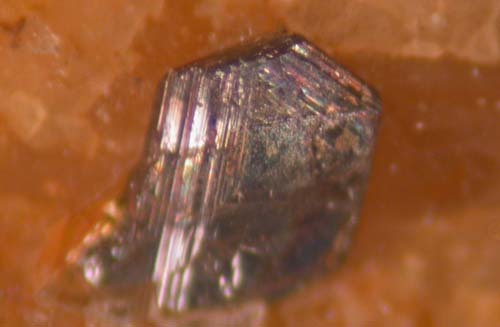 I've added many new, excellent specimens from the Tsumeb Mine to this website. 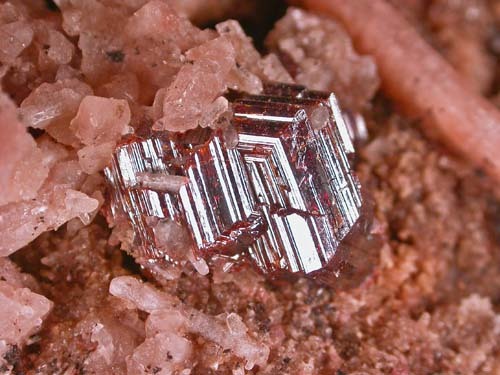 Check them out in the Tsumeb pages in the main Minerals listings. I've added some new gold specimens to the site. 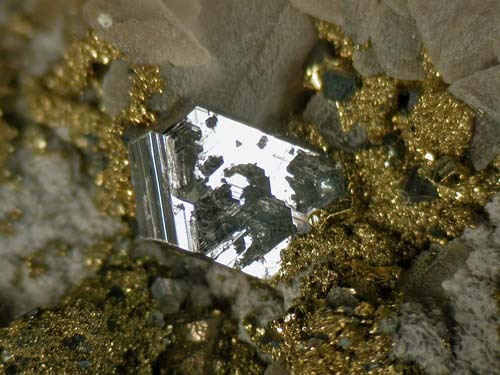 Check out the entries under the "Gold" pages in the "Minerals" section of this website. I've added two new entries in my "Recent Activities" section of my website. One is about my recent collecting trip to Nova Scotia. The other is about another collecting opportunity at the Flamboro Quarry. Check them out! 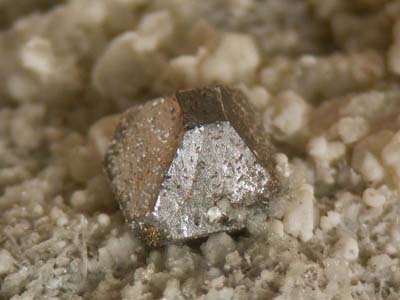 I've added many interesting new specimens from the Cobalt-Gowganda silver mining area to my website. Look under "Cobalt" in the main "Minerals" listing. I've added a new section to my website called "Books". There are two titles currently featured in this new category. One is "Miner Indiscretions" a humorous fiction book about curious goings-on at an old gold mine in South Africa. The other is "Mineraux du Mont Saint-Hilaire", a reference book featuring the history, geology and minerals of Mont Saint-Hilaire by the famous MSH collector Gilles Haineault. I recommend both books! 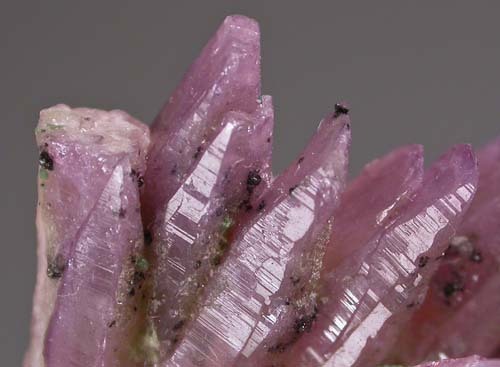 I've added a number of new minerals to my website, mostly a variety of great specimens from USA, Mexico and Canada. Some nice secondary minerals! Check them out! The threatened mail strike in Canada has been averted, for now. For the immediate future, there will not be a strike. Please feel free to order from me and be confident that your parcel will arrive as normal. 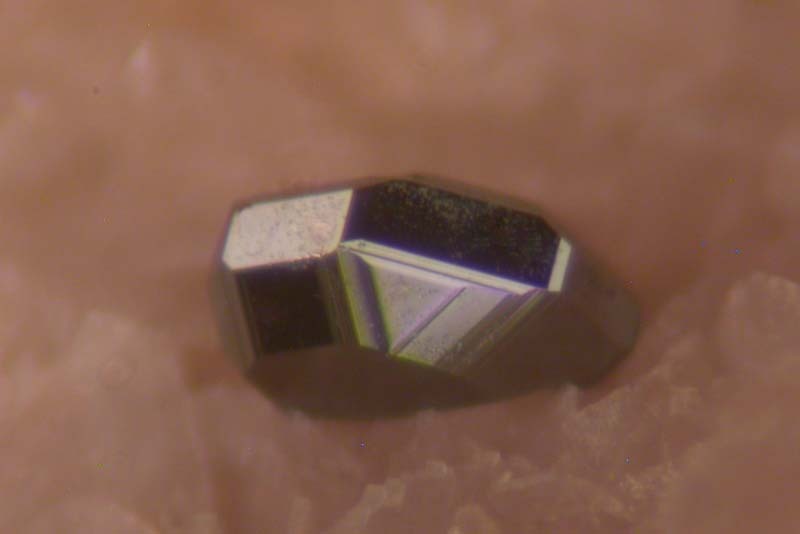 I recently acquired the collection of a geologist that specialized in arsenopyrite mineralization. 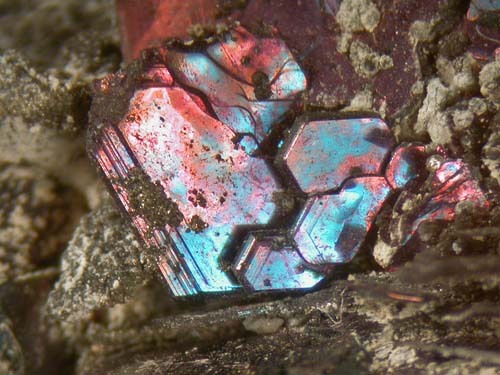 As such, I've been able to add some excellent specimens of this mineral from various locations around the world. 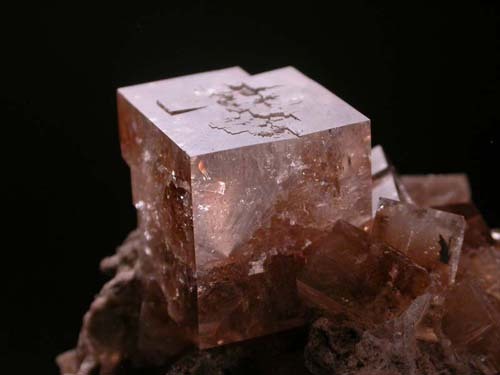 Look mostly under "Sulphides -Page Two" in the main Minerals listings of this website. 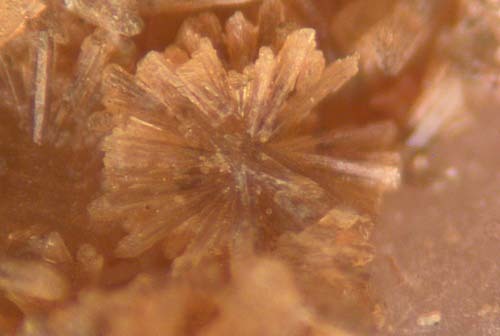 I've added some excellent new Mont Saint-Hilaire specimens to this website, including some very rare ones. Look for the "New" flags under Mont Saint-Hilaire, in the main minerals listing. 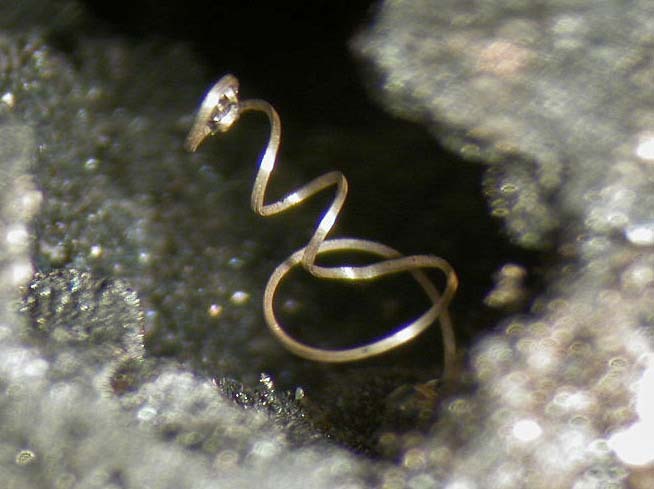 I've added many new, excellent specimens from the Cobalt Silver Mining area to this website. Look under "Cobalt" in the main "Minerals" listings. 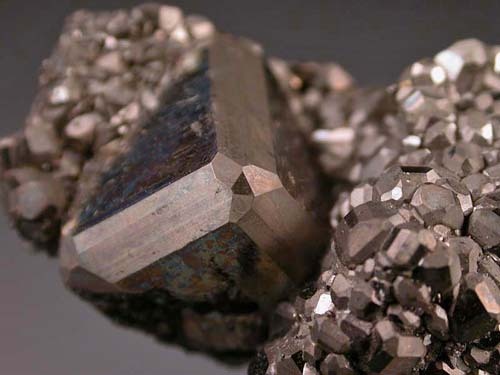 Check out the new article, "Cobalt, An overview of History, Geology and Mineralogy" on this website in the "Articles" Section. 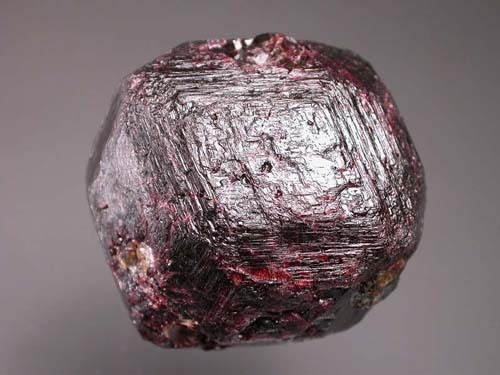 It may be the most comprehensive specimen mineralogy article ever written about Cobalt. 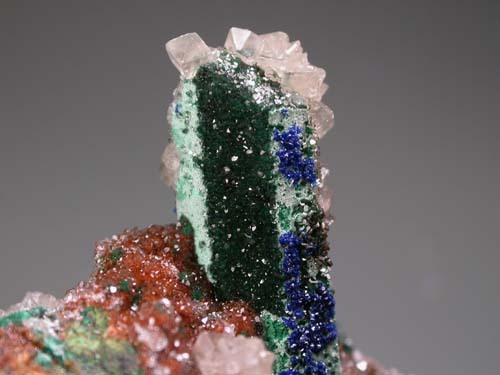 I've added some exceptional new specimens of Xanthoconite, proustite and pearcite from the Imiter Mine to the website. 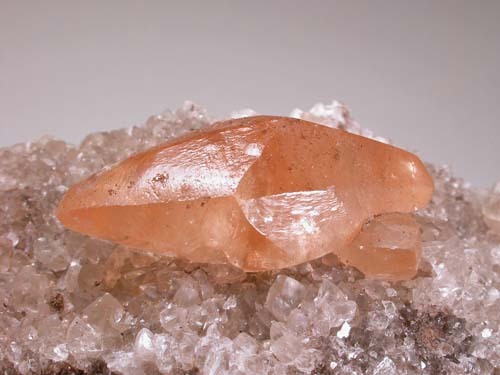 The smaller specimens can be viewed in the "50 Most Recently Added Specimens" list on this home page, while the bigger ones are in the Morocco-Imiter page in the main minerals list. 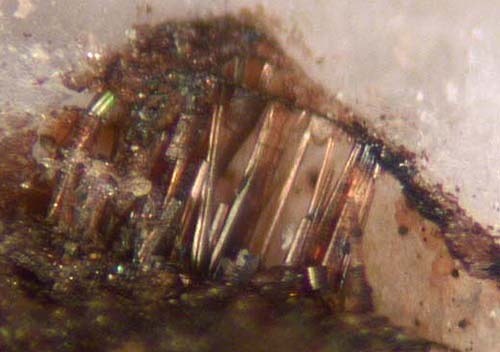 A retired mining executive from Toronto recently retired and I am fortunate to have the opportunity to offer you many of the Tsumeb specimens from his collection. Most were acquired in Africa in the '70s and 80's. 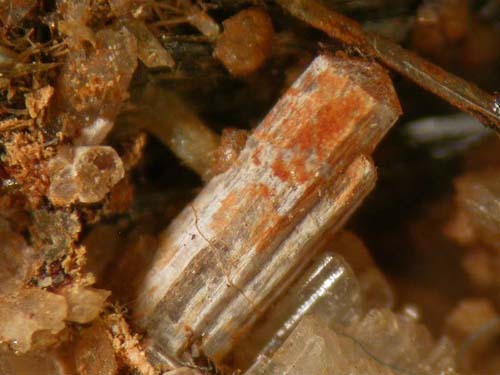 Check them out in the Tsumeb pages in the main Minerals listings. 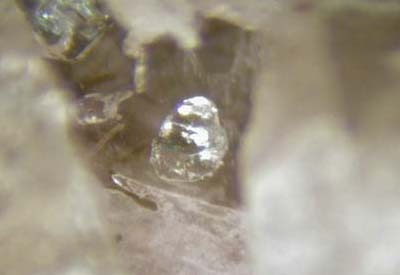 New Silver, Silver Islet, Altaite and others! 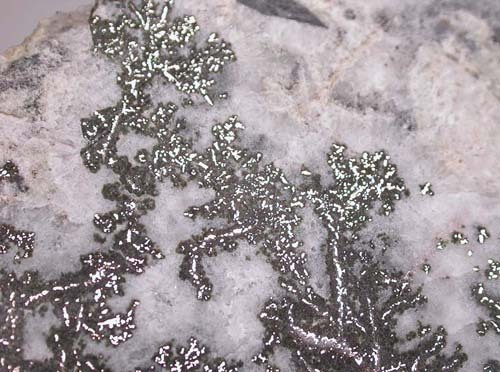 I've added some nice dendritic silver specimens from the historic Silver Islet Mine to my website. 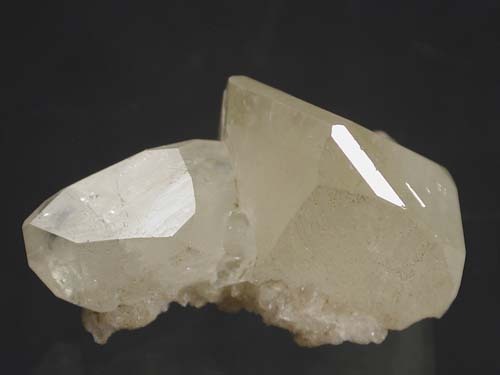 As well some exceedingly rich altaite specimens from the classic Mattagami Lake Mine. 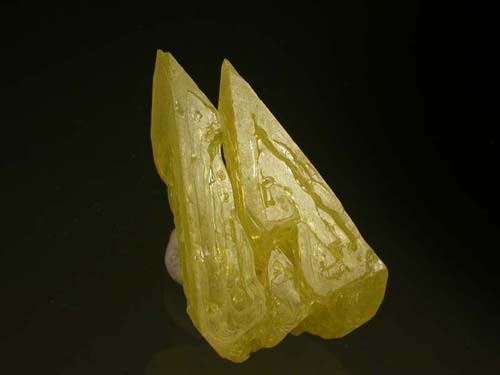 I've added some rare uranium minerals to my website. 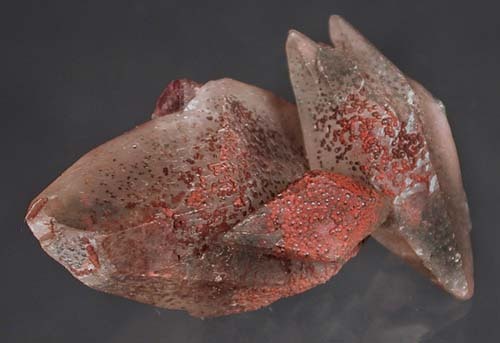 Check them out on the Home Page for a while in the "50 Most Recently Added Specimens" button or in the main "Minerals" listings in this website. Some REALLY nice ones! 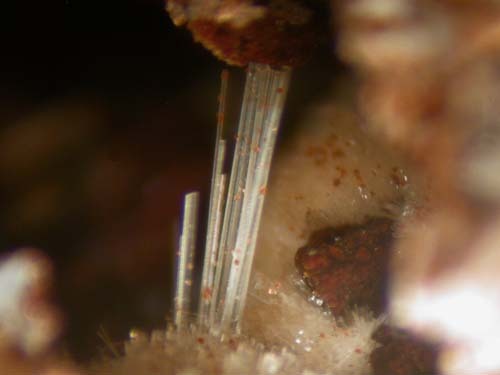 New Article About Collecting Minerals on the Bay of Fundy by Ray McDougall! I've added a new article to this website, sort of. 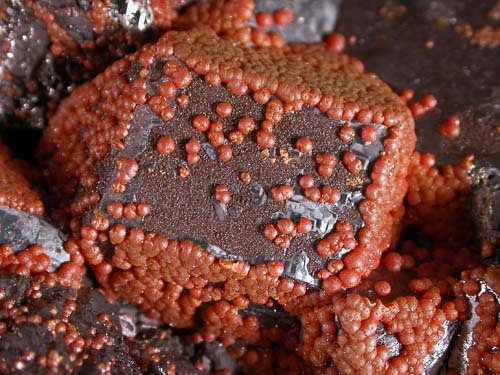 If you check out the "Articles" section of this website, you'll find a link to an article about "Collecting Minerals on the Bay of Fundy" by Raymond McDougall. Check it out! 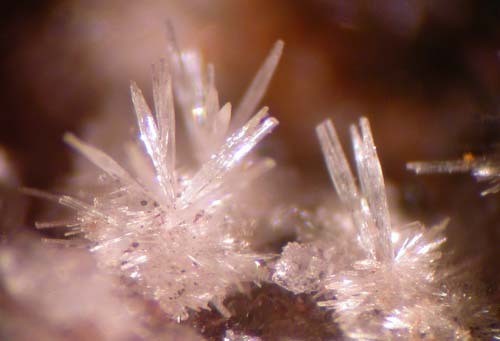 I've added many excellent specimens of crystallized and nodular howlite, from Nova Scotia, to this website. Check them out under "Howlite" in the main "Minerals" section of the website? 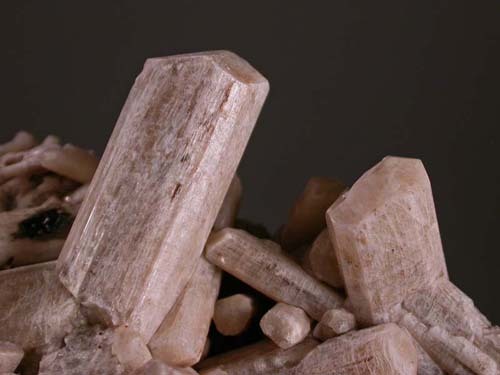 As well, there are a number of new zeolite minerals added to the "Zeolites" pages in the main Minerals listings of the website. Look for the "NEW" flags. 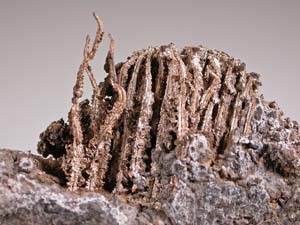 There are a number of new Jeffrey Mine specimens on the website. 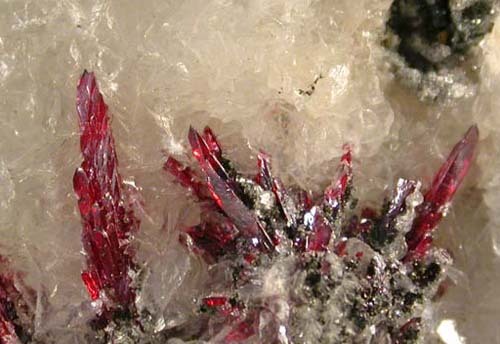 Look for the "NEW" signs under "Jeffrey Mine" in the main Minerals section of this website. 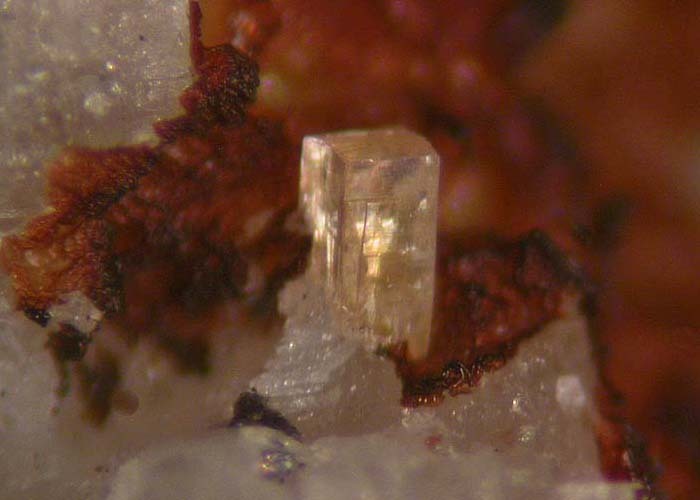 Species include vesuvianite, pectolite, prehnite, scolecite and calcite. 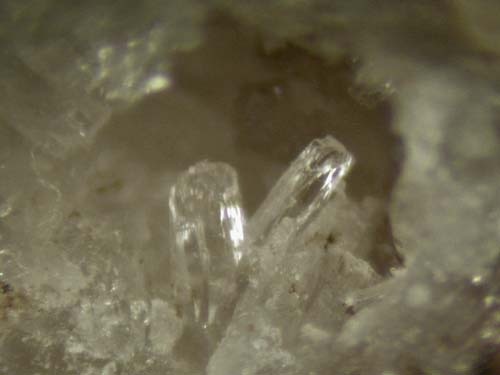 I've added several interesting amethystine, sceptered quartz crystals from Sanca Creek, Kootenay Lake, BC to my website. 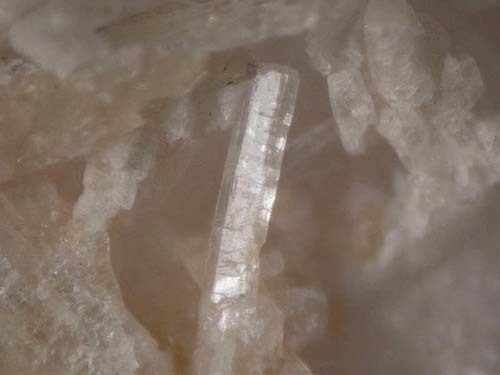 Look under "Quartz, Various Canadian Locations" in the main "Minerals" listings. 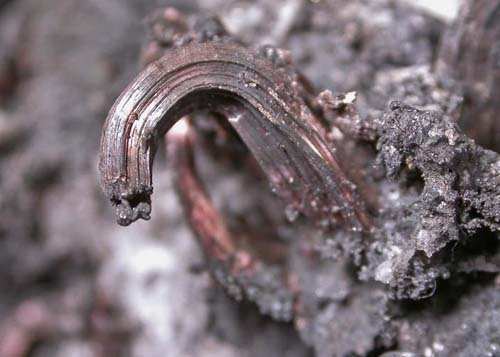 I've added some excellent sliced terrestrial iron specimens from Russia to my website. Look under "Iron". 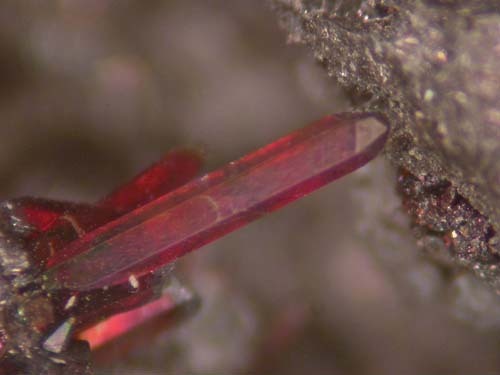 As well, there are some really nicely crystallized pyroaurite specimens from Langban in the "Treasures, Odds and Sods" category. 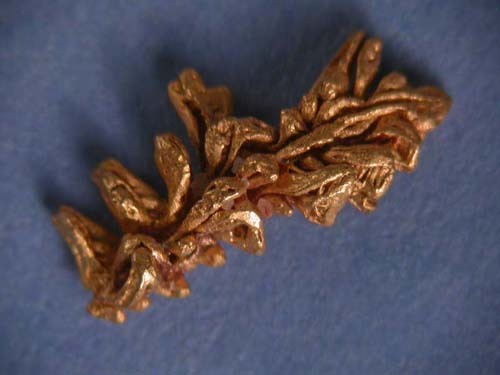 I've added some very well crystallized , affordable, small gold specimens from both the San Antonio Mine in Venezuela and Pine Creek, near Atlin, British Columbia. Really sharp! 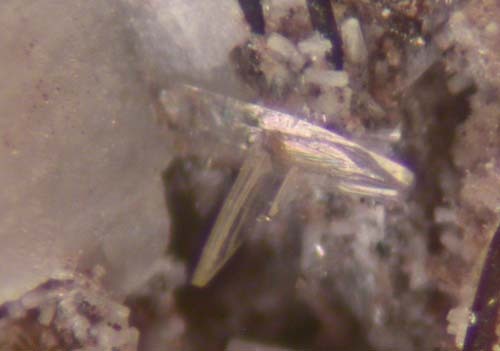 There are some excellent xenotime-(Y) crystals on the site, as well as interesting anatase and rutile crystals. Look under "Brazil" in the main Minerals listing. I've added some geological items to the website this time! 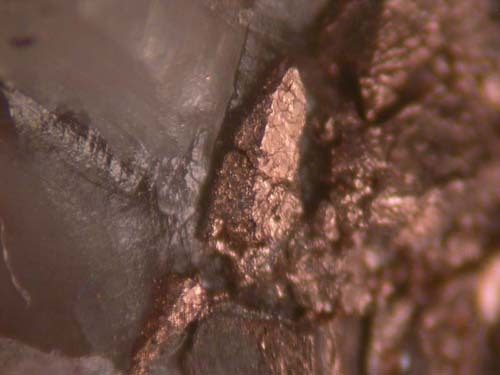 There are some new, amazing shattercones and impact breccias from the Sudbury meteor impact site. 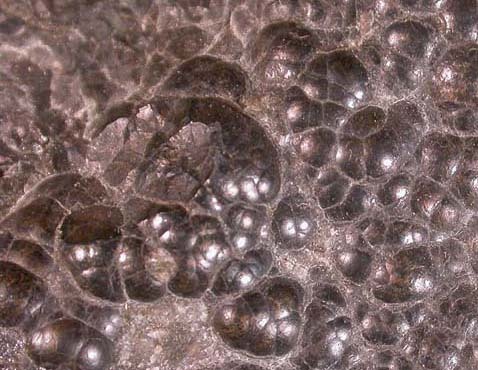 The impact occurred 1.85 billion years ago and is the second largest meteor impact site on the planet! Look under "Rocks and Ores" for these. 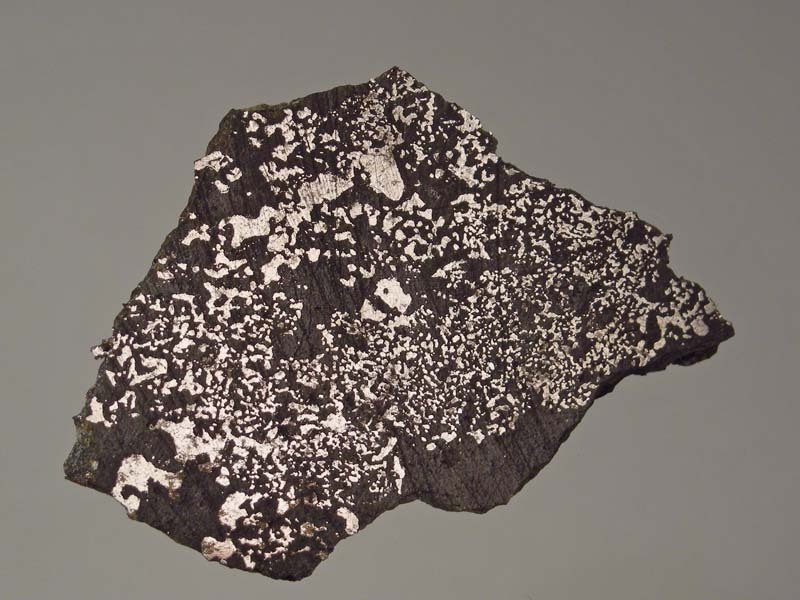 As well, I've added a number of samples of kimberlite, from two different sources to the site. 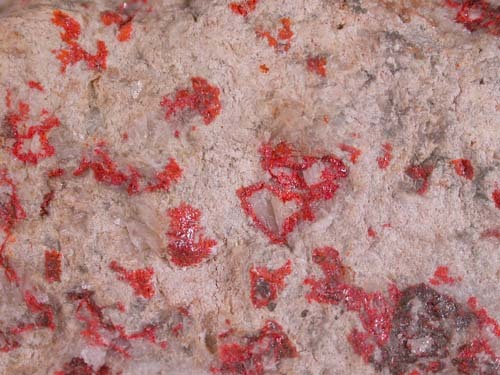 Check out the indicator minerals and rock inclusions. Very interesting! These are also under "Rocks and Ores". 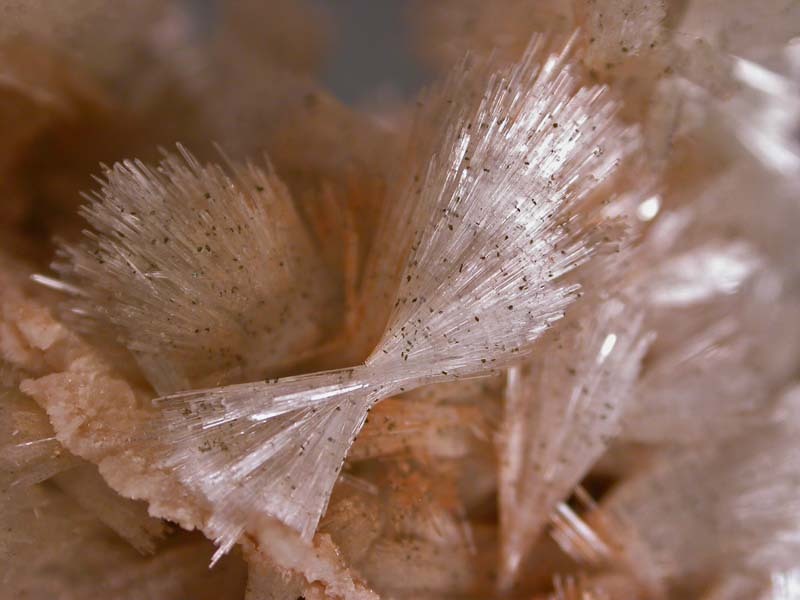 I've added some excellent specimens of svanbergite crystals on dolomite and magnesite from the Mount Brusiloff Mine, British Columbia. 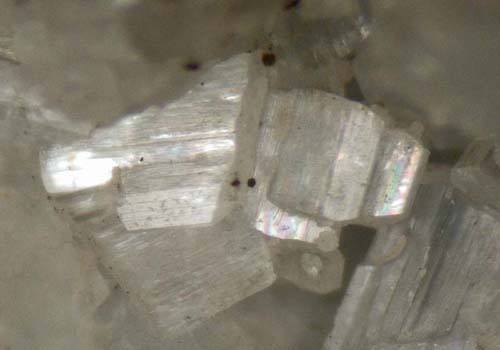 Some super high grade silver specimens and slices have been added to my website, plus some nice specimens of associated minerals -nickeline, skutterudite, lollingite, etc. 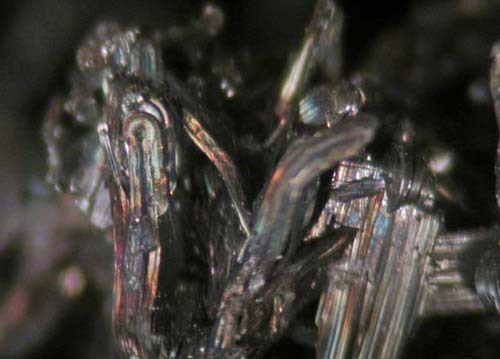 Look under "Cobalt" in the main "Minerals" listings. 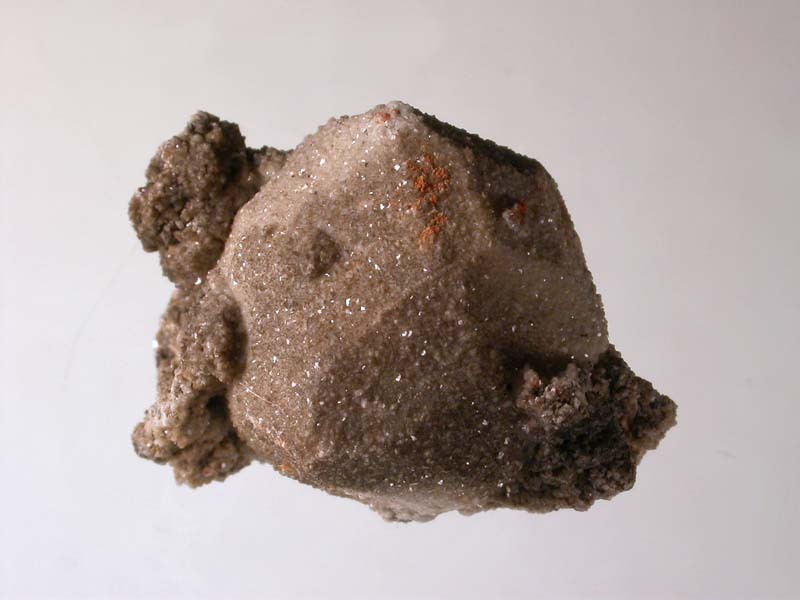 There are some new phosphate mineral specimens from Rapid Creek on my website. 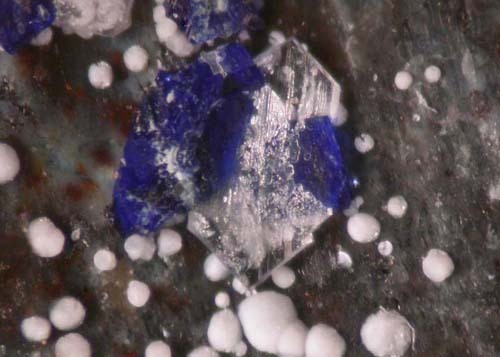 Lazulite, whiteite, kulanite, etc. 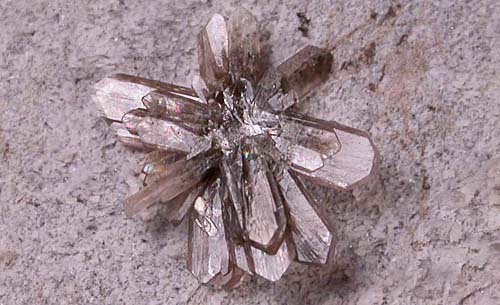 Look under "Yukon Phosphates in the main "Minerals" listings. 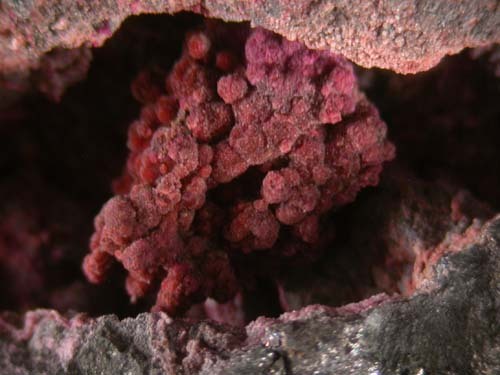 There are a number of excellent specimens of vlasovite in bright pink eudialyte on my website. 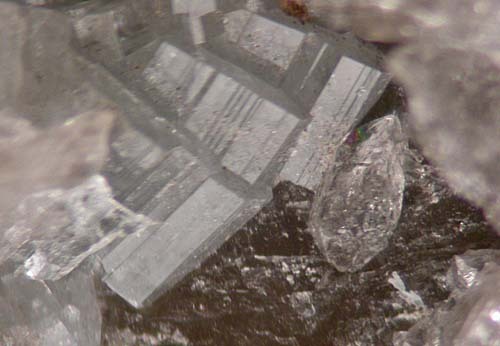 Some of the vlasovite crystals have an alteration rind of white gittinsite. 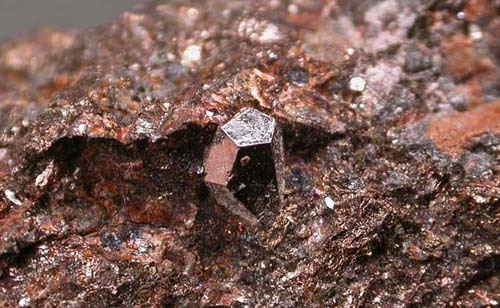 Look under "Vlasovite". 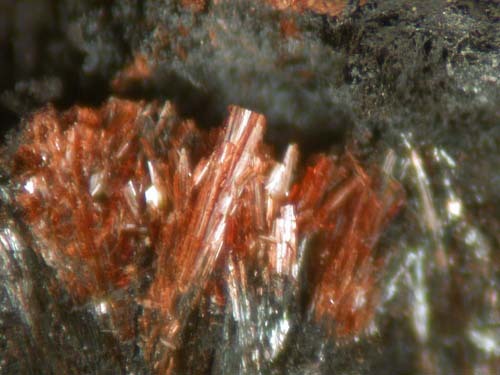 Lots of interesting new Nova Scotian minerals have been added to the site, all from the Bay of Fundy Region, including thomsonite, mesolite, apophyllite, calcite, magnetite and native copper. Check them out! 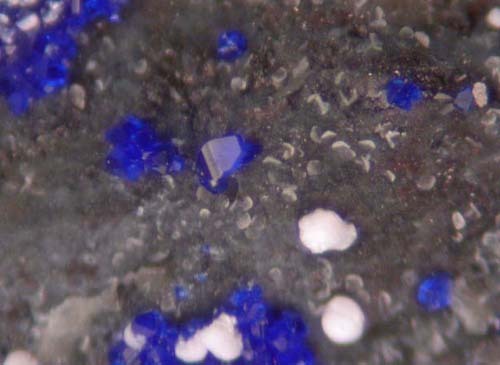 I've added some very nice, azurite specimens from the famous locality at Tsumeb, Namibia. 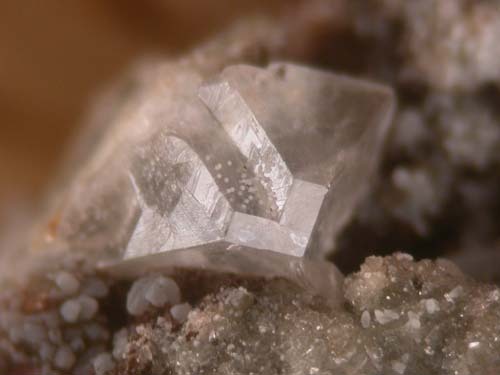 Look under Tsumeb, in the main "Minerals" listing. 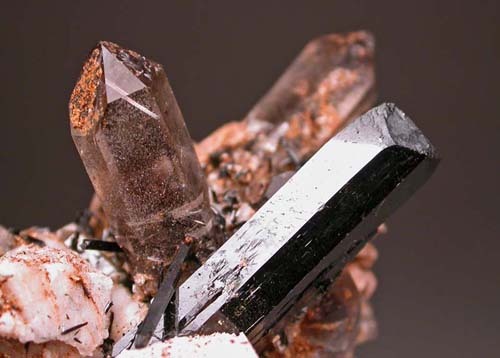 I've added many new specimens from Peruvian localities to the website including Enargite, stibnite and hutchinsonite from the Quiruvilca Mine and alabandite from the Ucchuchacua Mine. 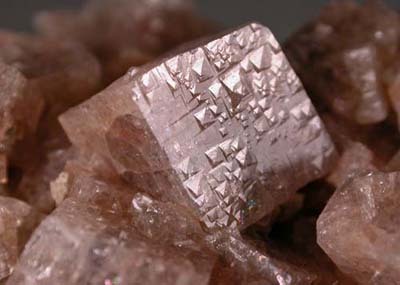 Check them out under "Peru" in the main Minerals listings. 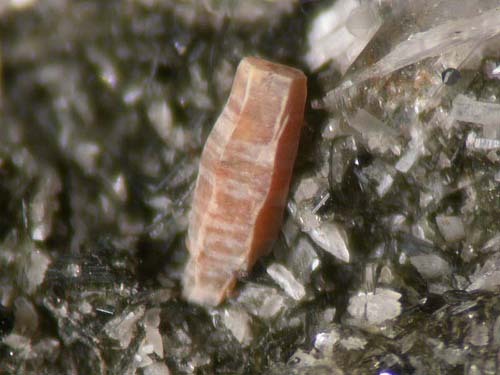 I've put some excellent specimens from the Sudbury area on this website including cleavable millerite, rich pentlandite and excellent examples of the Sudbury Impact Breccia. These are all listed in the "Rocks and Ores" section of this website. 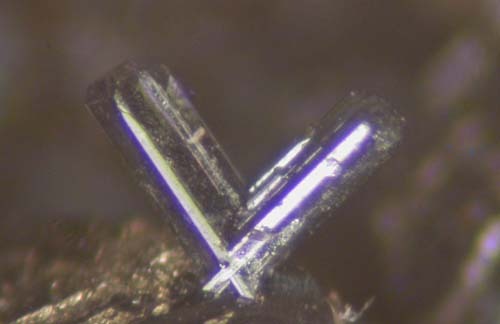 As well, there are very good crystals of cubanite from the Strathcona Mine, Levack, listed under "Cubanite" in the main "Minerals" listings of this website. 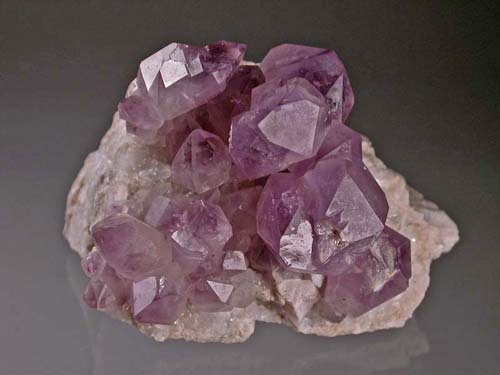 I've put many new, beautiful, displayable amethyst specimens from the Diamond Willow Mine on this website. Go to Quartz, var. 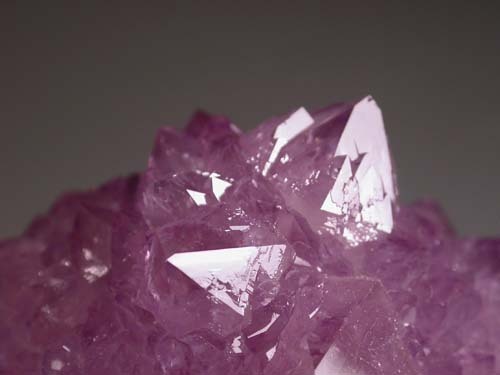 Amethyst, in the main Minerals listing to view them. 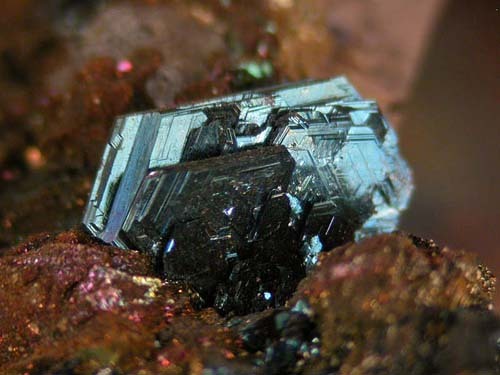 They are the best of many specimens mined by the Nicklin Family at the mine, years ago. 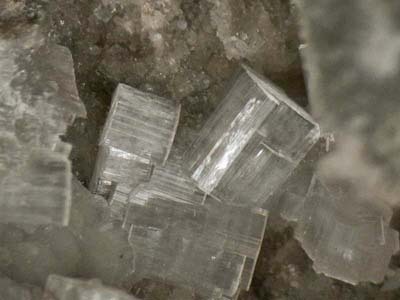 I've added a number of new minerals from the Tanco Mine including titanowodginite (type locality), rossmanite, cesium-rich beryl, quartz and fluorescent simpsonite. 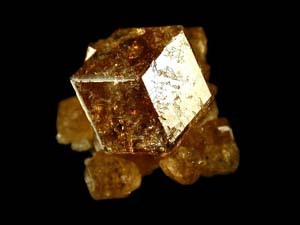 I've added many new sphalerite, fluorite, calcite and other specimens from the Flamboro and Lafarge Quarries to the Website. Look under "South Ontario Limestone Quarries" in the main Minerals listing. I've added many miscellaneous specimens here and there throughout the website. Check the "NEW" flags for the nest minerals! I've added a number of new specimens to the website, all listed under "Greenland" in the main minerals listings. 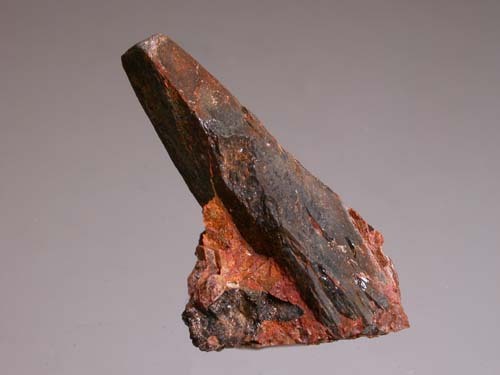 There are some unusual rare minerals from some of the unique alkalai intrusive deposits there, including a number of very old specimens from the Philadelphia Academy of Sciences Collection, including old labels. I have returned from hospital and am continuing recuperation from home. I am feeling better but I have a lot of healing to do! I will have no trouble filling orders now. 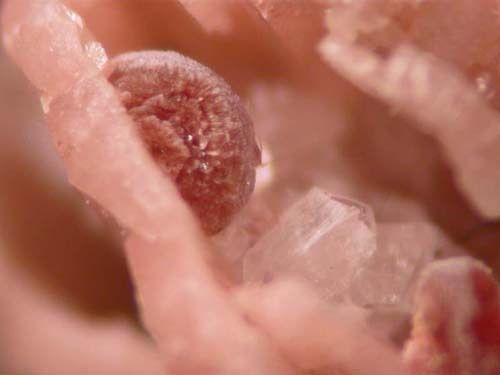 As soon as I am up to it, I will re-commence adding interesting mineral specimens to my website. Thanks for your patience and well wishes over the past months! I've added lots of unusual specimens to the website. Many of the localities are so obscure, for SURE you will not have heard of them. Look for the "NEW" flags! 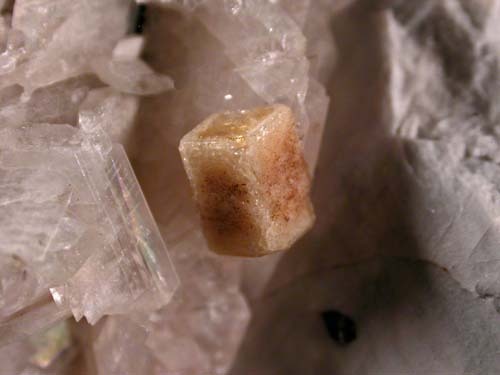 There are some excellent specimens of these two unusual minerals on a new page "Stokesite" in the main "Minerals" listings. 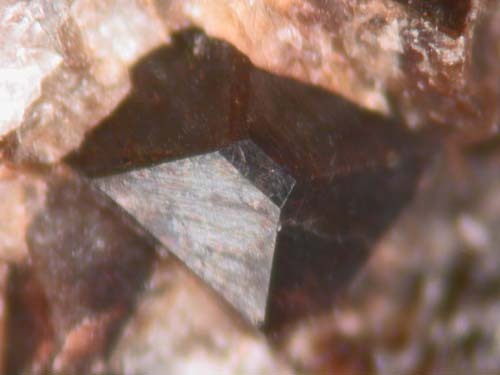 There is a new page of monazite crystals from the Amtatofosikely Pegmatite in Madagascar on this website. 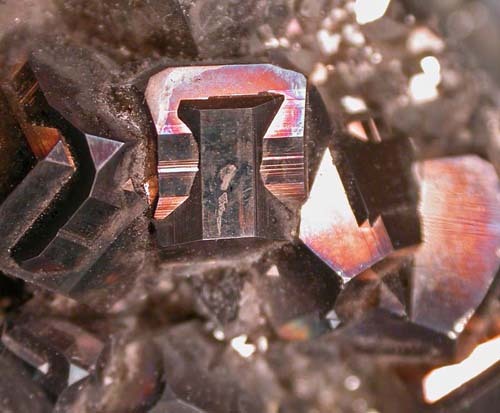 Check them out under "Monazite". 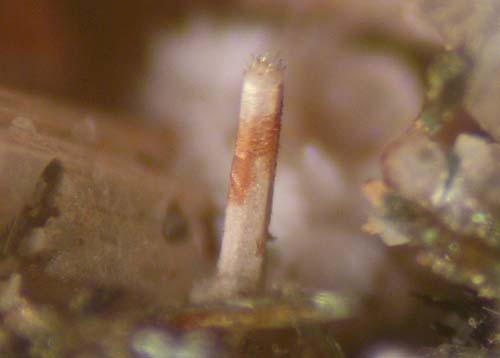 I've added very nice specimens of polybasite, mostly rich micro-specimens from the Husky Mine to this website. 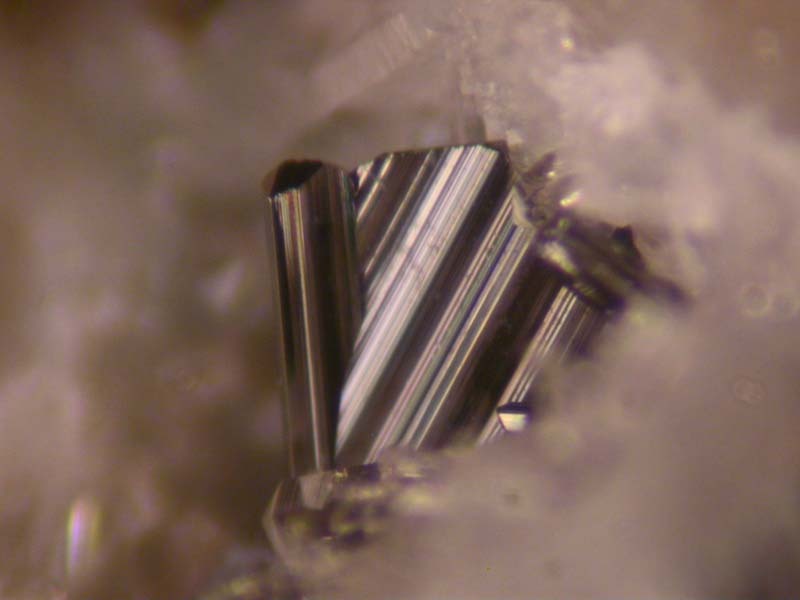 Check them out under "Polybasite". I've added many new specimens from Mont Saint-Hilaire to this website. 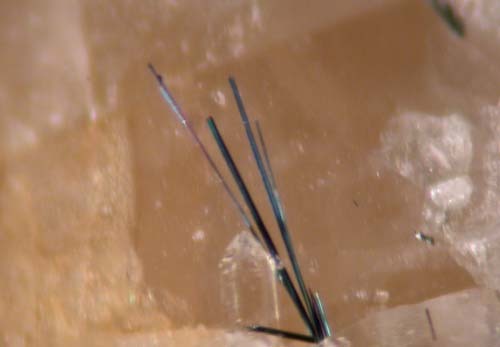 Look under "Mont Saint-Hilaire" in the main "Minerals" listings for the "NEW" flags. 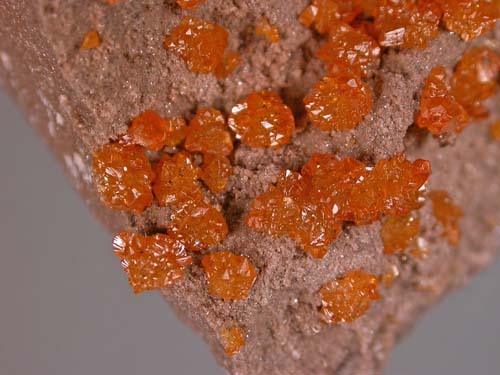 I am fortunate to offer you a one-of-a-kind superb Russian Crocoite specimen from Berezovskoye, the type locality for both crocoite and vauquelinite. 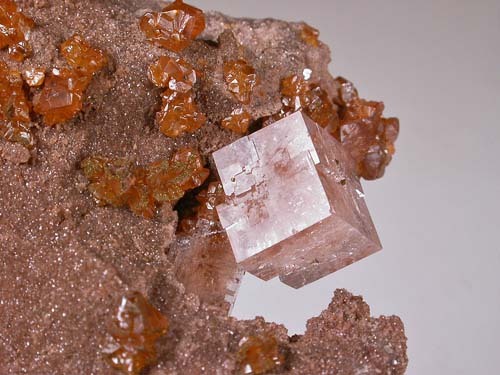 This specimen shows well crystallized crocoite and vauquelinite. 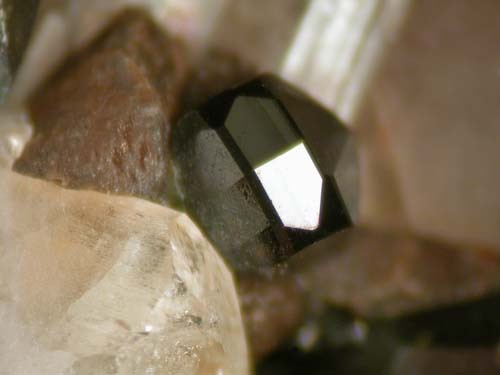 Have a look in the "Connoisseurs Choice" page at the beginning of the main Minerals listings! 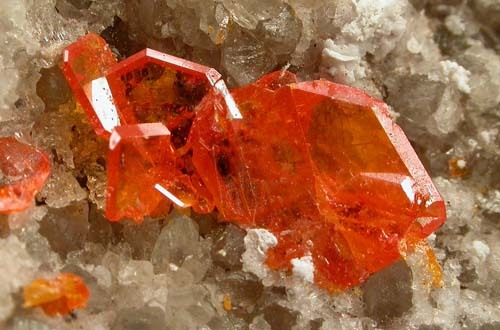 I've added some gorgeous Wulfenite-Mimetite specimens to the website. 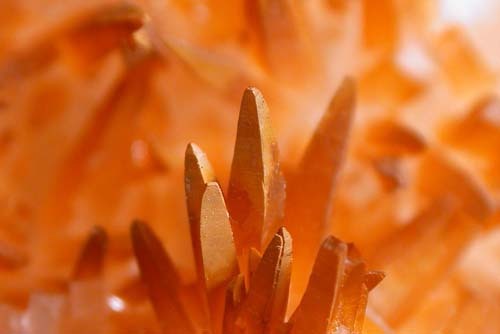 Look under "Wulfenite" in the main Minerals listings. 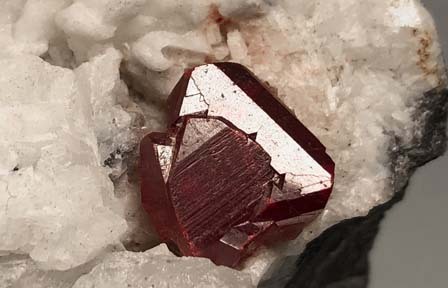 I've added a number of new specimens from Mont Saint-Hilaire to this website including peatite, monteregianite, sodalite, horvathite-(Y), hilairite, gaidonnayite, neighborite, petersenite-(Ce) and many others. Look for the "NEW" flags under Mont Saint-Hilaire! 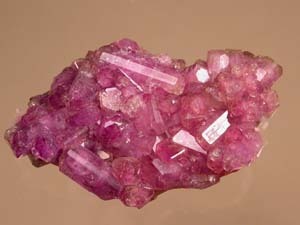 Recently, I purchased part of an international rare minerals collection and I've added the specimens to this website. 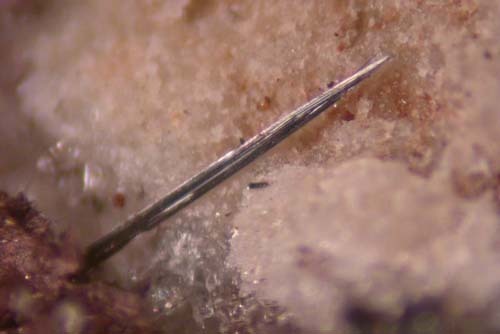 Check them out under "Microminerals" under the "NEW" flags. 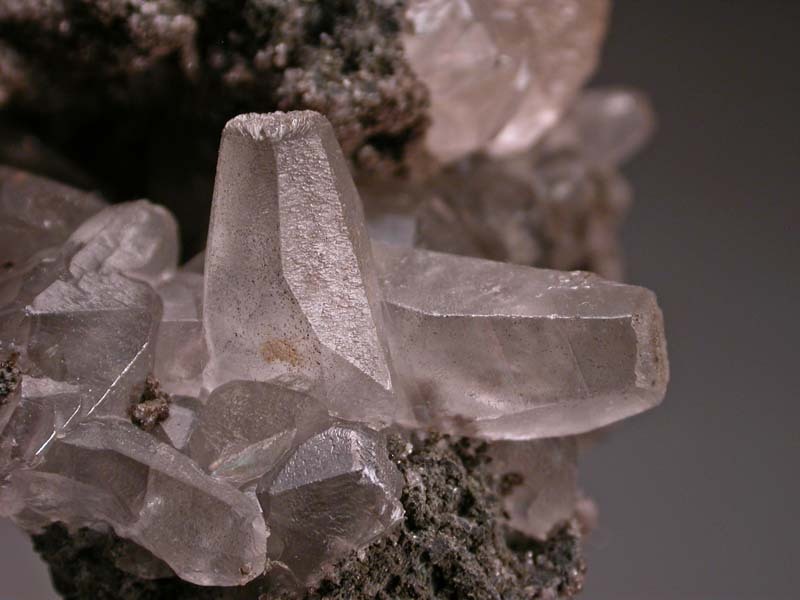 I've added some specimens with excellent crystals of arrojadite, kulanite, fluorapatite, etc to the website. Look under "Yukon, in the main "Minerals" section. 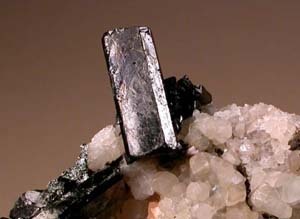 There are several pages of new specimens of pyrite, sphalerite, calcite, dolomite, etc., from the Nanisivik Mine on the site. Look under "Nanisivik Mine"! 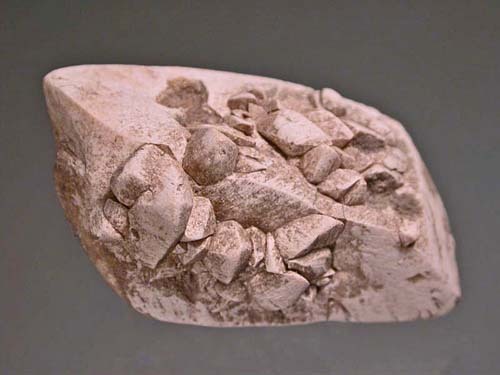 There are several pages of excellent specimens from limestone quarries in southern Ontario on the website. 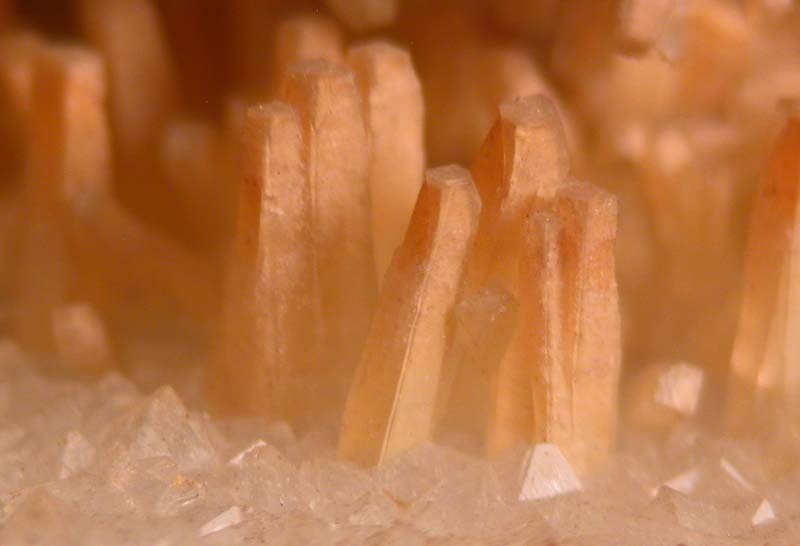 Look under "Southern Ontario Limestone Quarries", in the main "Minerals" to see them! Pseudomorph Collectors! 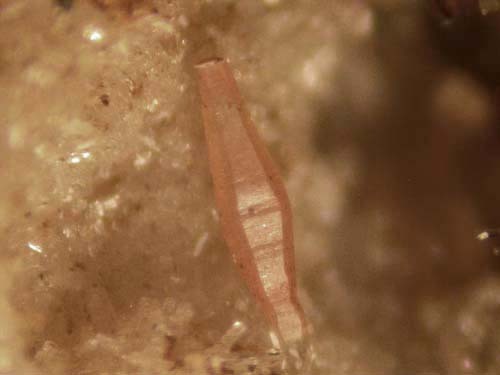 I've added a page of excellent pseudomorphs of calcite after ikaite from Codroy, Newfoundland and Labrador. 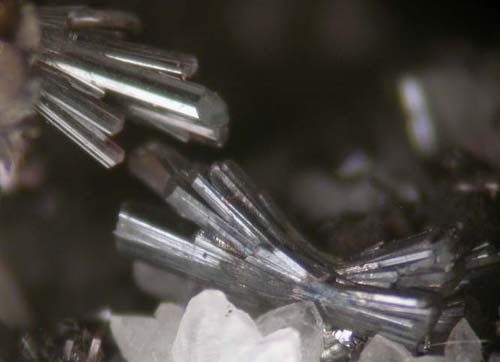 I've added a page of very nice, well crystallized molybdenite crystals, in quartz matrix, from the Moly Hill Mine in Northern Quebec, to my website. Have a look! I've added lots of new specimens to this website in the past week! 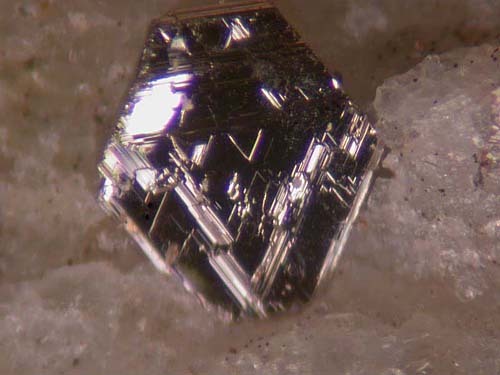 -Under Grenville, excellent Parker Mine spinel and forsterite crystals. 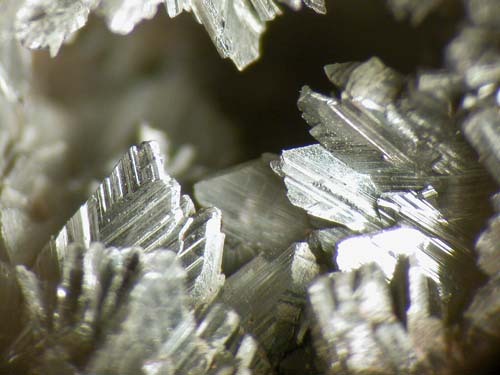 -Excellent nepheline crystals. 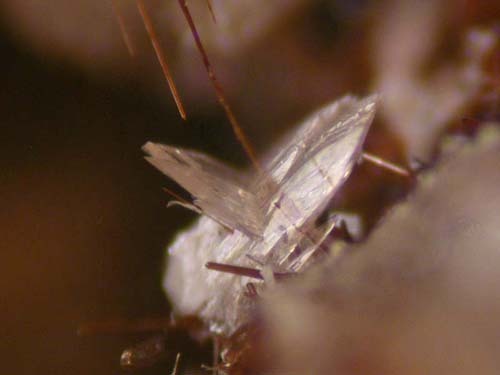 -Super uvite pseudomorphs after serendibite. 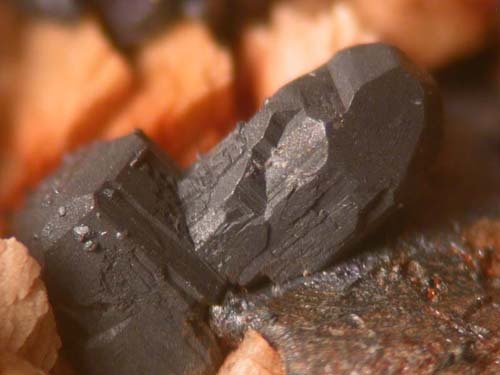 -Unusual, sharp clinohumite crystals. -Various categories - look for "NEW" flags under many categories for the latest additions from an old collection. 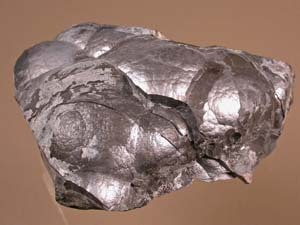 -Super silver Specimens from Silver Bear Mine, Great Bear Lake. -Rich gold specimens from Val D'Or. I've added a number of excellent and interesting silver specimens, with associated minerals, from the classic Cobalt mining camp. Look for the "NEW" flags under Cobalt, in the main "Minerals" listing. 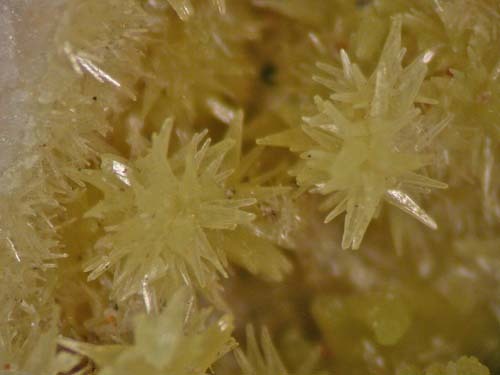 I've added some very nice, reasonably priced smithsonite specimens to the website plus some larger specimens of smithsonite, wulfenite, mottramite, aragonite, etc. 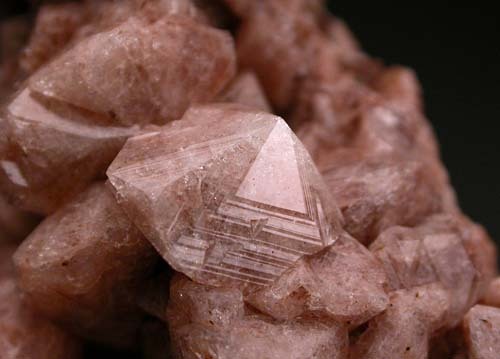 Check under "Tsumeb" in the main minerals listing. I've Got the Blues! -Lazulite and Azurite! 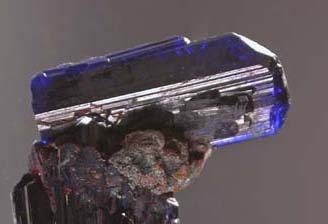 I've entered a "Blue Period" with many excellent specimens of lazulite from Rapid Creek and azurite from Tsumeb, added to this website. 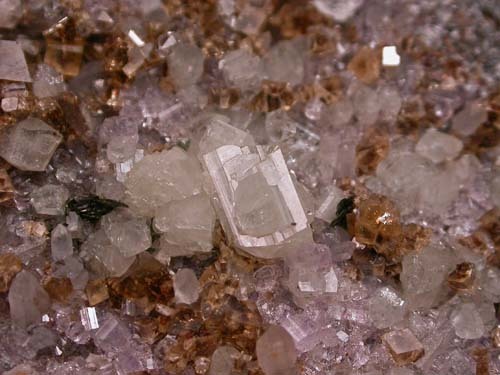 I've added quite and assortment of minerals to my website over the past while. 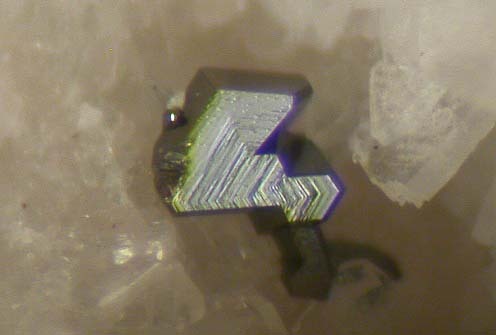 Some unusual minerals and localities. Check out the new flags! 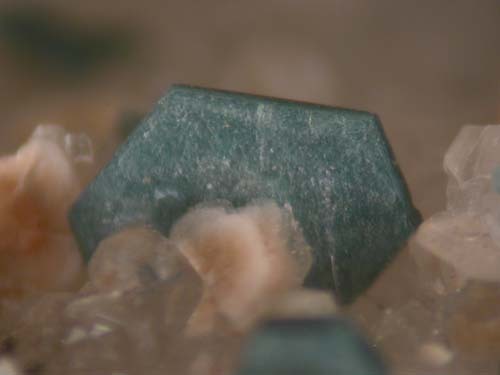 I have added a number of relatively unusual minerals from Tsumeb to my website. 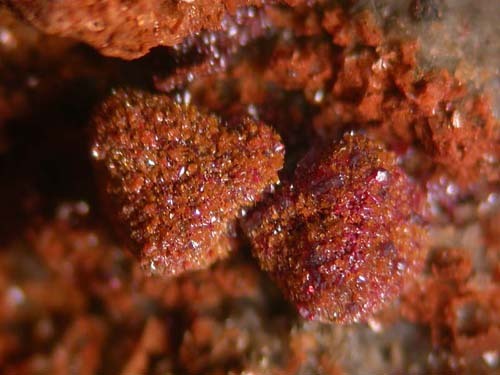 Check them out under "Tsumeb, Assorted Minerals" in the main minerals listing. Cobalt Area Silver -Old Collection! I've added a number of specimens of high grade and unusual silver specimens. Some are from the collection of a former mine manager at Cobalt. 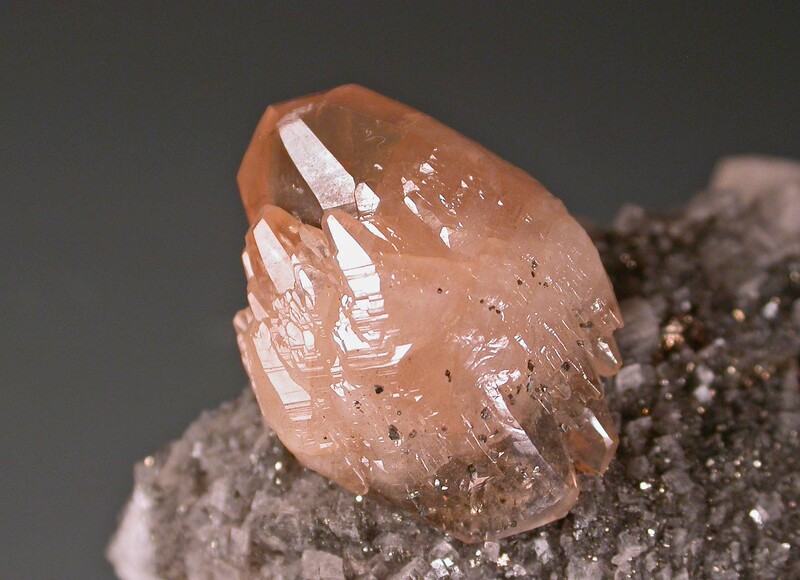 I've added an assortment of really nice calcite specimens. 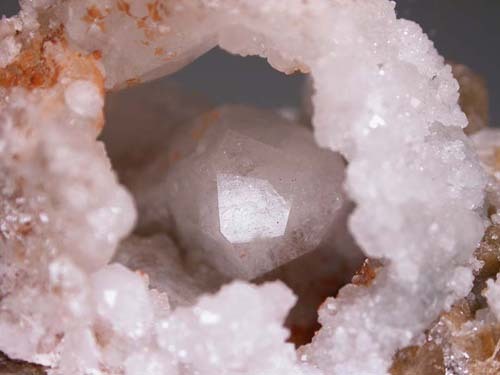 Look under "Calcite, Various Localities" in the main mineral listings. 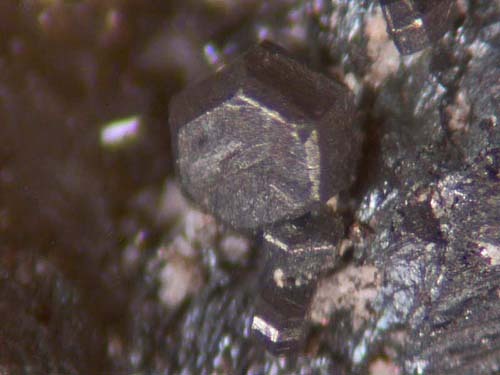 I've added a number of different MSH specimens to the site including really nice gobbinsite, gmelinite, grossular var. 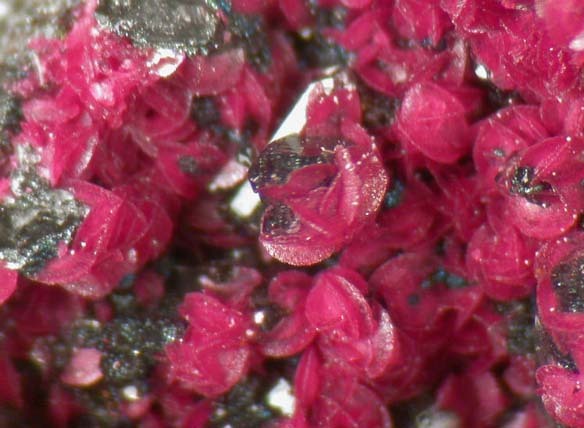 hibschite, berthierine, corundum, carletonite, plus a few other unusual minerals. Look for the "NEW" Flags in the Mont Saint Hilaire Pages. 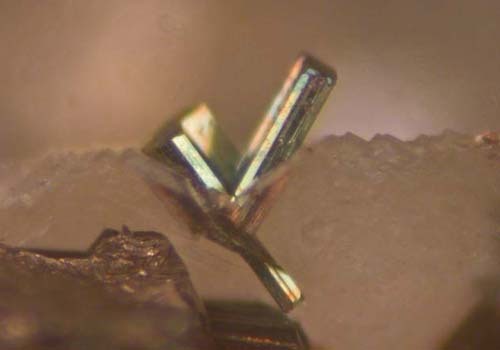 We are used to seeing secondary Minerals and carbonates from Tsumeb but not metallic minerals! 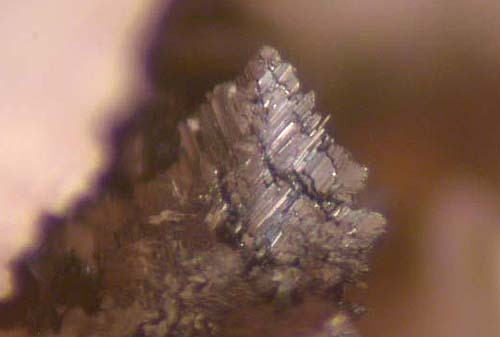 I've put a number of chalcocite, copper, tennantite, etc., specimens on my website from Tsumeb. Check them out, under "Tsumeb". I've added the best crystallized howlite specimens I've ever had to my website. from an old cache of a Nova Scotia collector. Look under Howlite. 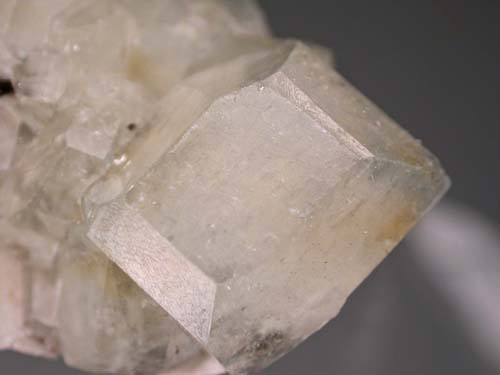 Some great new Mexican Minerals on my website including very well crystallized danburite and datolite plus some really nice fluorapatite crystals from Cerro del Mercado. 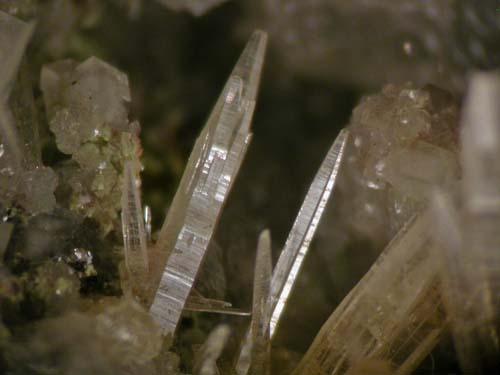 Look under the headings starting with those mineral names in the main listings. 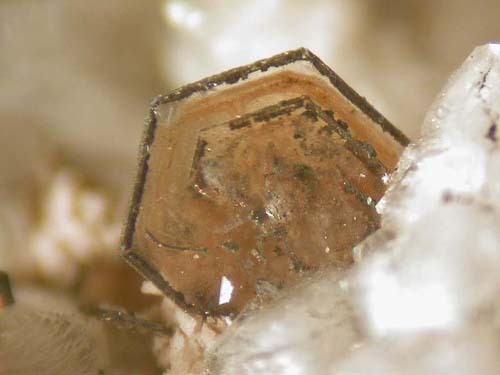 There are now some excellent karibibite in lollingite specimens listed on this website. 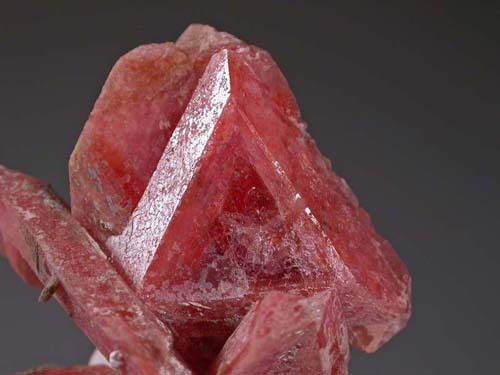 Look under "Morocco, Karibibite" in the main minerals listing. 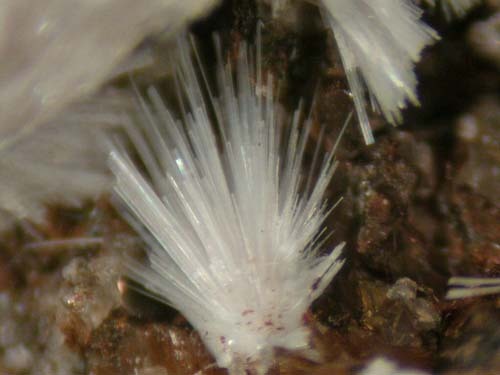 I've added some nice siegenite specimens to the website. They're not often available, these days! 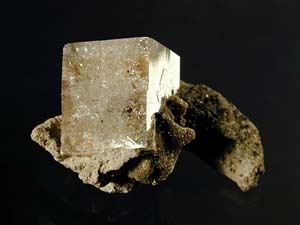 Look under "Siegenite". I've added a number of older, European Classics to my website. Look under "Treasures, Odds and Sods", as well as "British Minerals". 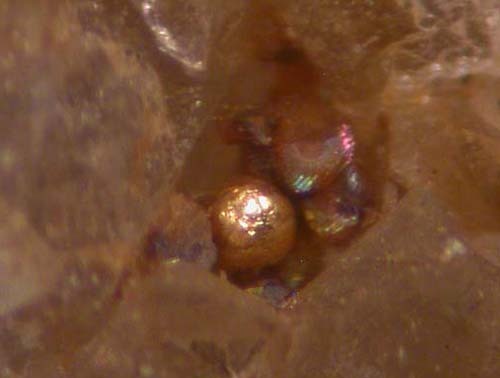 I've added some excellent new gold specimens from various localities PLUS a new group of electrum specimens from the Engineer Mine -old stuff! Look under "Gold" and "Engineer Mine". In addition some cool cassiterite pebbles from BC placer workings. 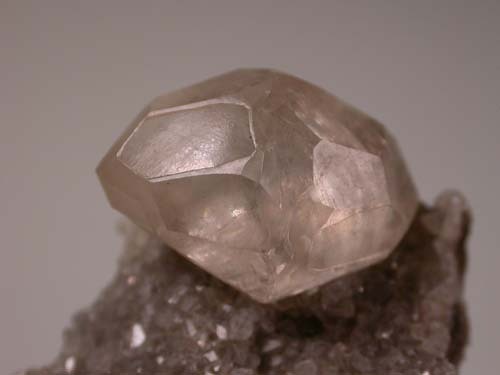 There are some excellent specimens of spencerite from the type locality, the HB Mine, now on the website. 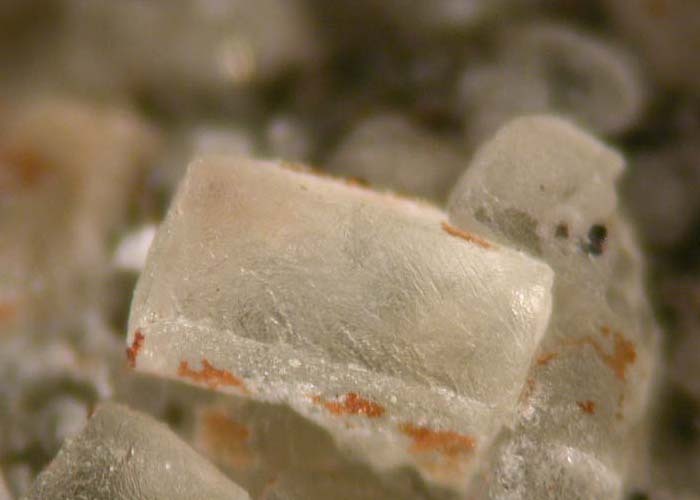 As well, very sharp alabandite crystals from Tanzania! 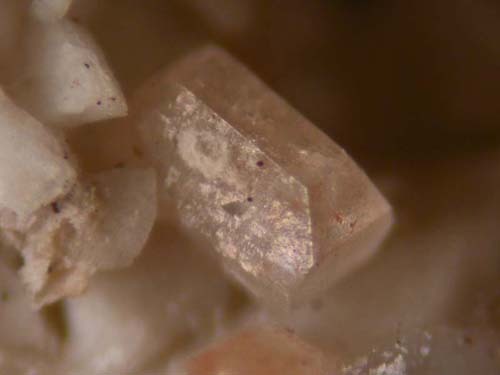 I've added a number of excellent Mont Saint-Hilaire Specimens to the website including micheelsenite, ferrocolumbite, willemite, steacyite, etc. Others too. Check them out! I've put a bunch of assorted sulphide minerals on the website. Look under "Sulphides". 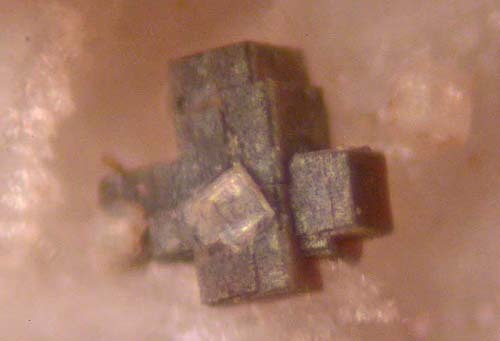 A well, some very nice miargyrite, pyrargyrite and crystallized silver specimens from the San Genaro Mine, Peru. Look under "Peru"! I've recorded a Compact Disc Recording of Mineral Collecting and Mining Songs called "Nuggets and High Grade". Lots of, mostly, humorous and "upbeat" songs about our favourite interests! Only $15.00! Check out the new "Music" Section of my website to learn more!? 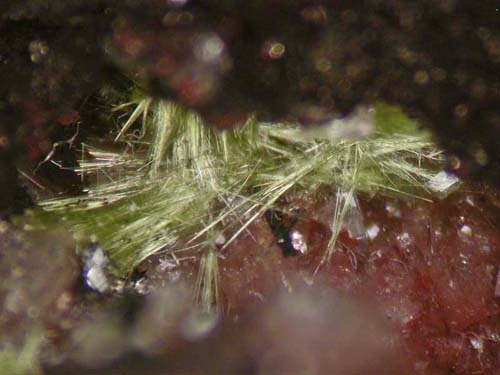 I've added some unique fluorescent minerals from the amazing Mont Saint-Hilaire locality to this website. 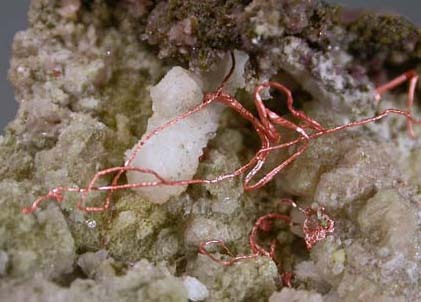 Gaidonnayite, hackmanite, Fluorite, leucophanite, willemite. Images are shown in both white light and U/V. 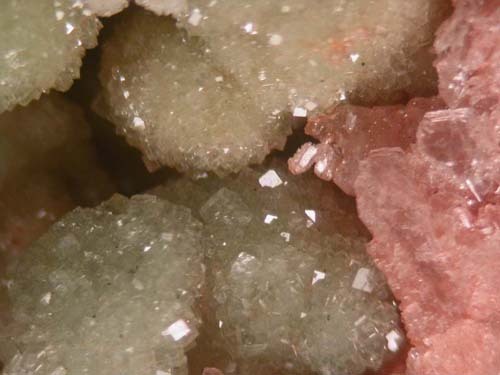 Look in the main "Minerals" listing under Mont Saint-Hilaire and the "Fluorescent" tags. 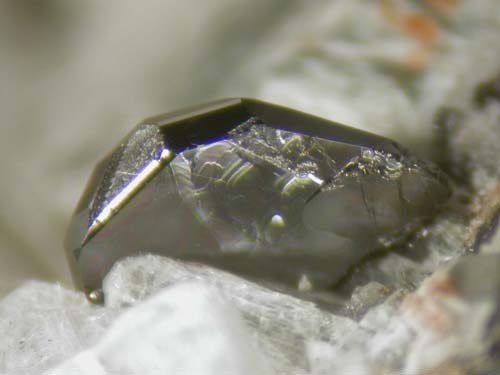 I've added many excellent specimens of weloganite from the type locality, the long-closed Francon Quarry, to my website. 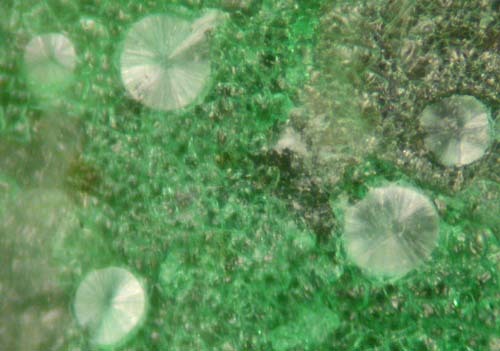 As well, I've also added many accessory minerals from the miarolitic cavities in the quarry such as cryolite, dresserite, dawsonite celestine and strontianite. 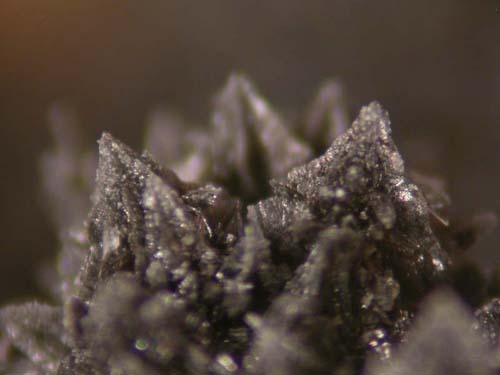 I've added some VERY good new Tsumeb specimens to the website. Really nice cerussites, especially. 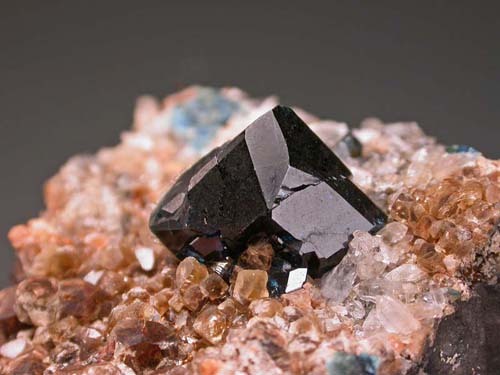 Check out "Tsumeb" in the main minerals listing. For those of you that have purchased hogbomite, from Dewitt's Corners, from me, in the recent past. 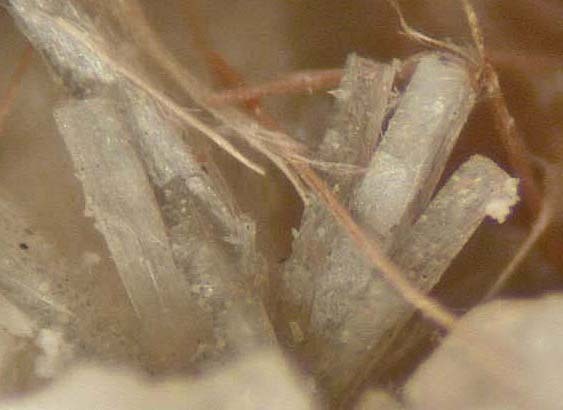 Analyses by the Canadian Museum of Nature show that the crystals are usually part magnesiohogbomite and part ferrohogbomite. The analyses show that they are more often magnesiohogbomite dominant. Hope that is of interest!? 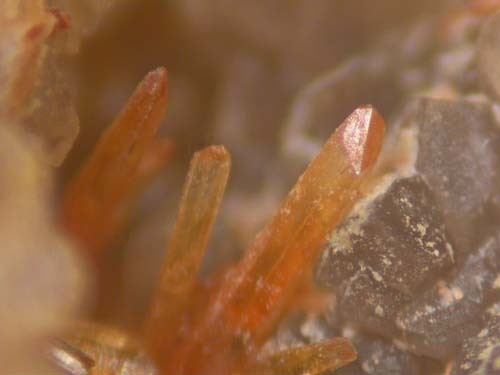 I've added some very nice analcime and gmelinite specimens from the Bay of Fundy Region to this website. 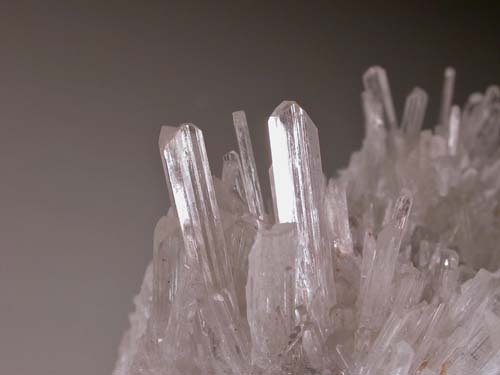 Look under "Zeolites" in the main Minerals listing. 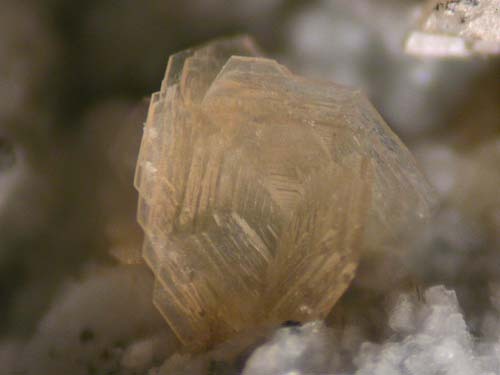 Some of the gmelinites are the fascinating and beautiful gmelinite pseudomorphs after chabazite. 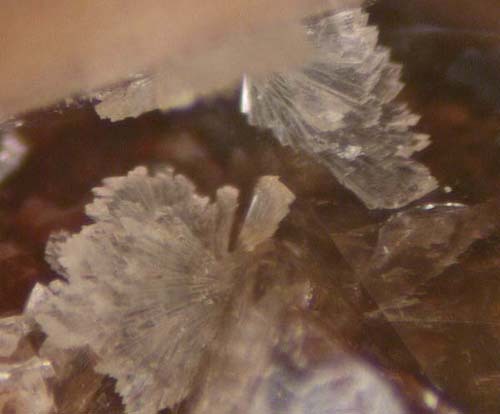 Wonderful zeolites! 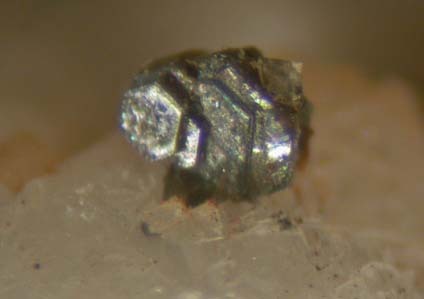 Cobalt Area Silver and Minerals! 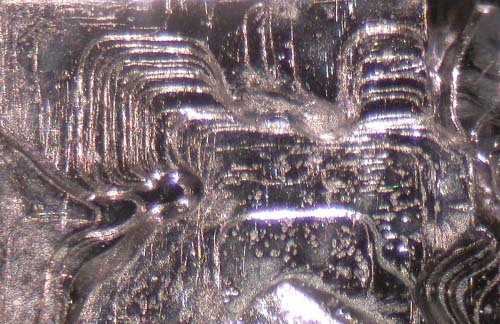 There are many new rich and/or interesting Cobalt area silver specimens added to this website. Check them out!? 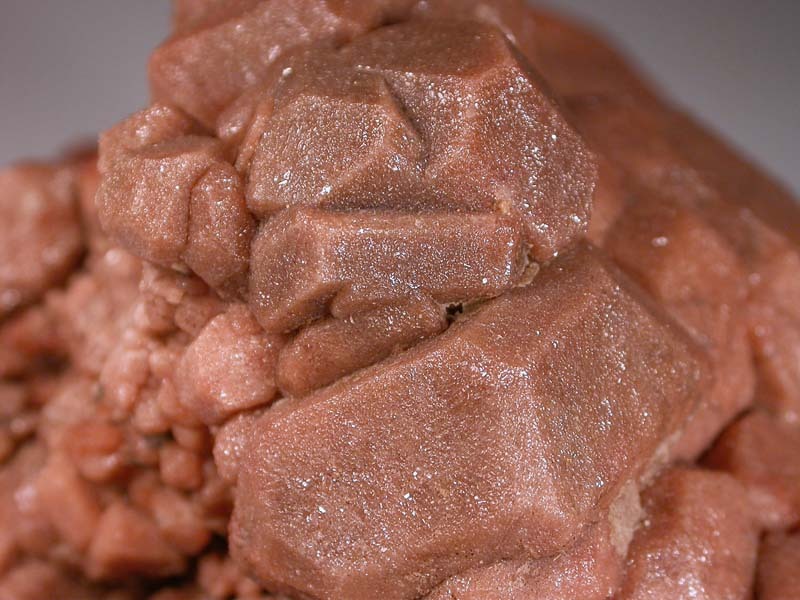 I've put a bunch of rich specimens of this unusual telluride mineral on the site. Look under "Altaite". 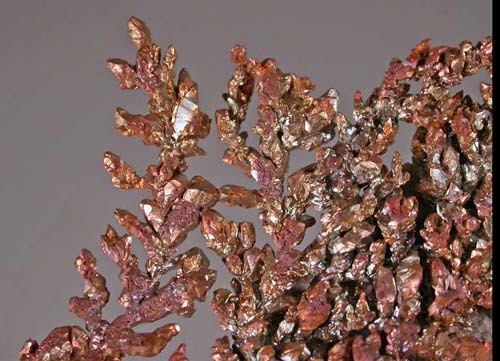 I've added lots of new crystallized copper specimens to the website. 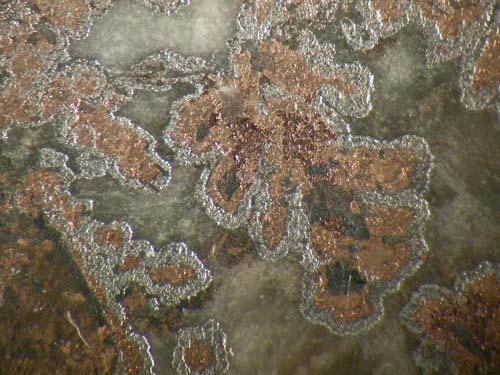 Look under "Copper" in the main Minerals listing and check out the "NEW" flags. 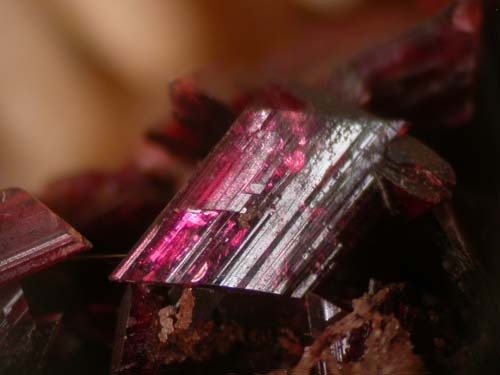 I've added a wide variety of mineral specimens from various localities in the Grenville, including wollastonite, spinel, hogbomite, titanite and many other interesting minerals. 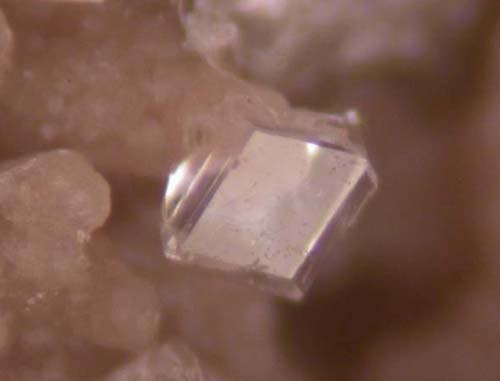 There is now a page of interesting, well crystallized cobaltite crystal specimens from the famous Brazil Lake occurrence on my website. 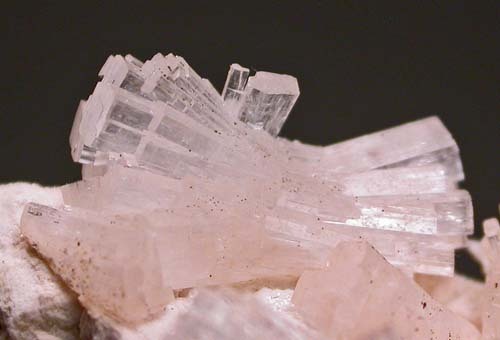 I am fortunate to have been able to acquire some very nice specimens from the Tsumeb Mine, mostly Smithsonite and calcite but a few other species, as well. 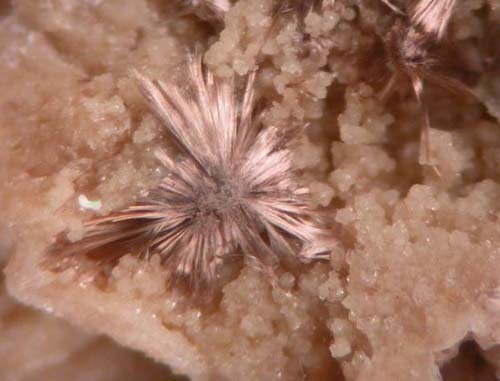 Look under "Tsumeb" in the main Minerals listing. 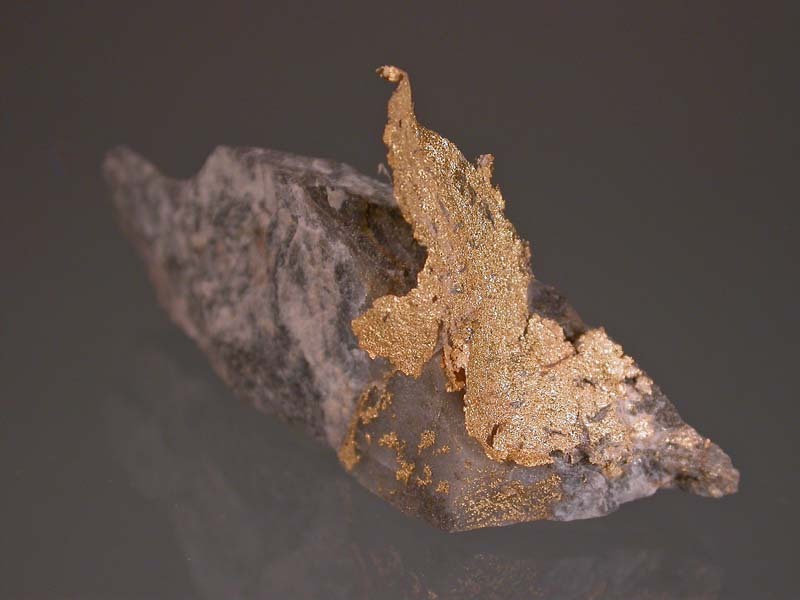 I've put some nice gold specimens from the historic Hollinger Mine on my website. 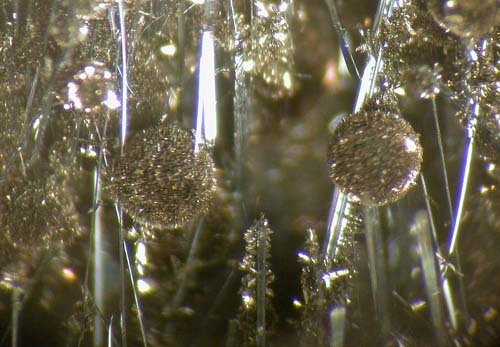 Nice gold-in-quartz specimens, mostly. 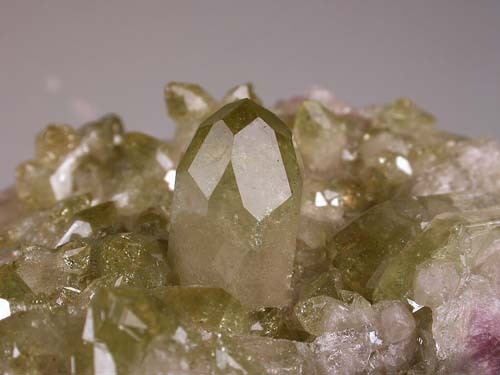 I've added some very nice Jeffery Mine grossular, prehnite, vesuvianite and pectolite to the website. Look under "Jeffrey Mine". 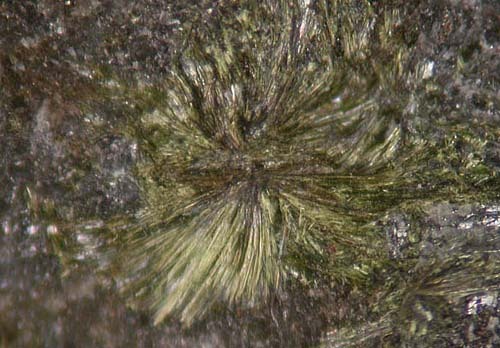 As well there are some awesome suolunite specimens from the Black Lake Mine at Thetford Mines, near Asbestos. Look under "Suolunite". 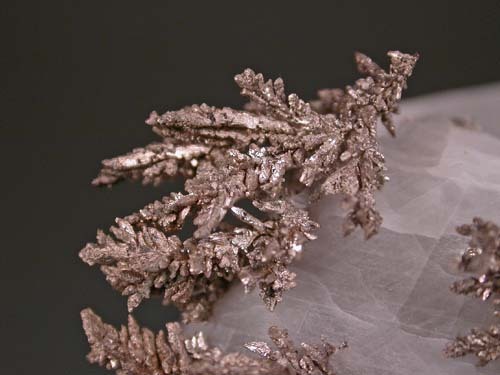 I've added some interesting new crystallized copper specimens to the website. Some copper-silver specimens, too! 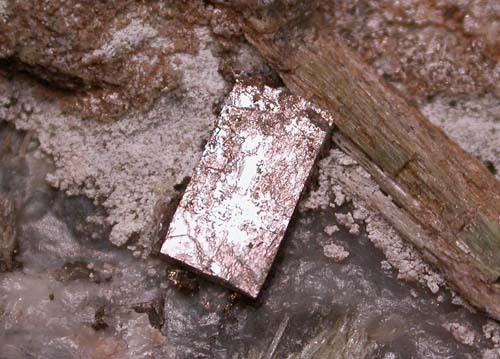 Check under "Copper" in the main Minerals listing. 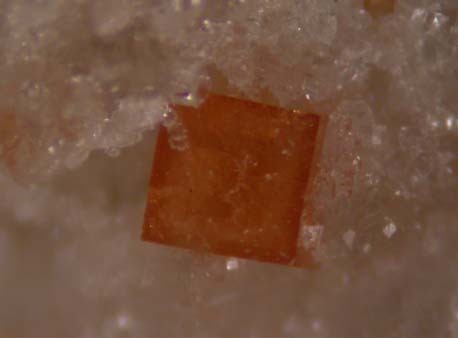 There are very nice new gormanite crystal specimens on the website. 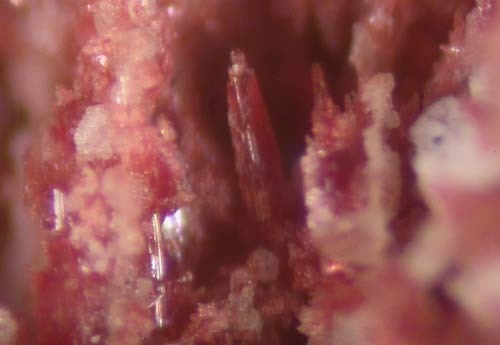 As well, some interesting brazilianite crystals associated with corroded lazulite. Look under "Yukon" in the main "Minerals" listing. 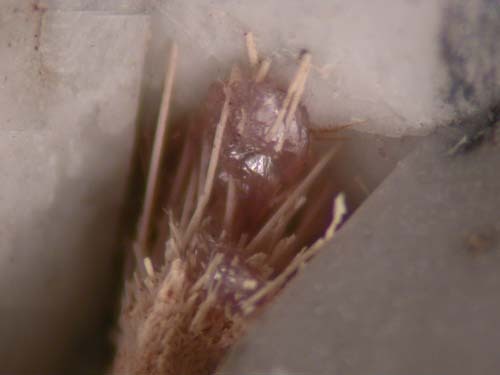 Recently, I visited Peru and collected or purchased interesting minerals from a number of classic localities there. 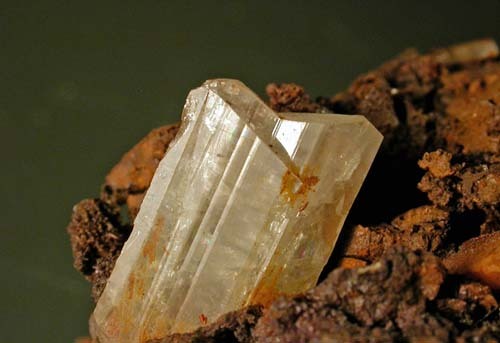 See that article called "Quiruvilca Mine Visit" in the "Articles" section of the website. 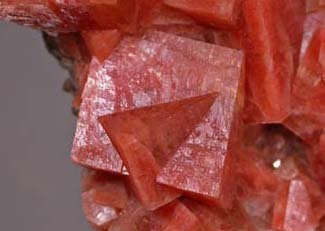 Please check out the "Peru" listings in the main "Minerals" section of this website to see some of them. 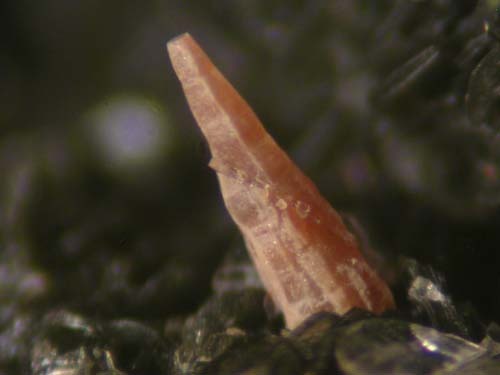 I've put many new Mont Saint-Hilaire specimens on this website. 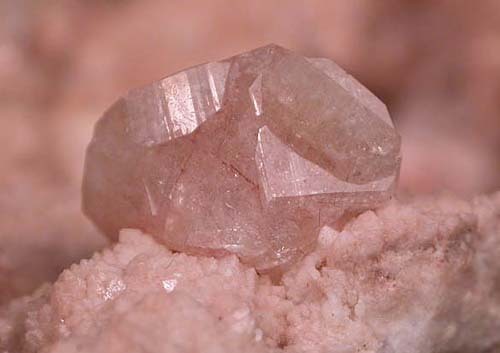 Look in the main "Minerals" listing under "Mont Saint-Hilaire". 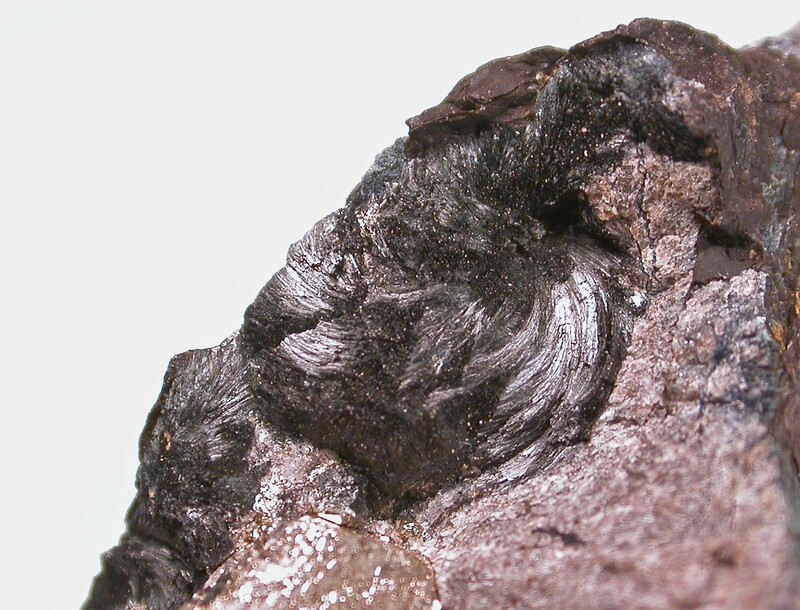 There is a new page showing beautiful sphalerite specimens from the Elmwood Mine in the Main Mineral listing. 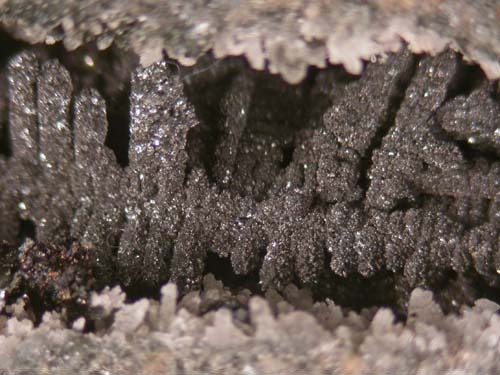 I've added new Musselwhite Gold specimens, some rare wittichenite crystals (sorry, these are sold out! 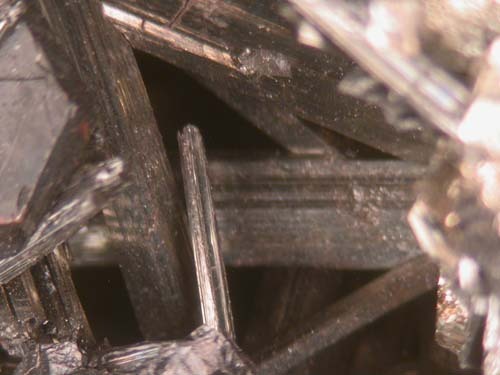 ), awesome cylindrite crystals and excellent Fergusonite-(Y) specimens. Check them out! 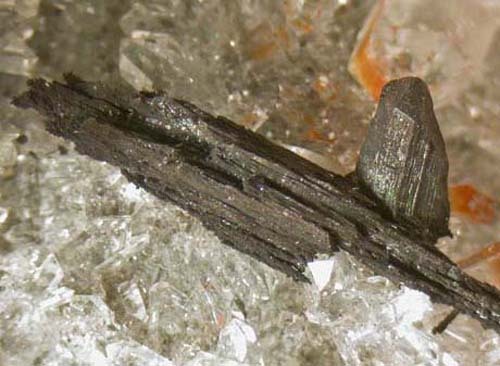 I've added some awesom Uraninite and Tritomite-(Y) specimens to this website. 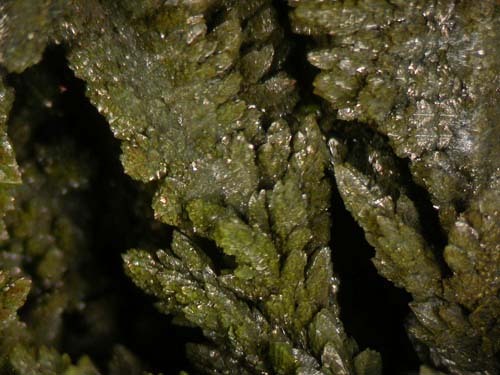 Check them out under Uranium Minerals and Uraninite in the main Minerals listing. 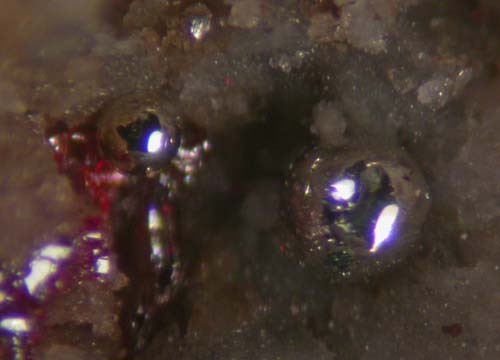 I've put some eally nice new densritic silver specimens from the Bouismas Mine onto my website. 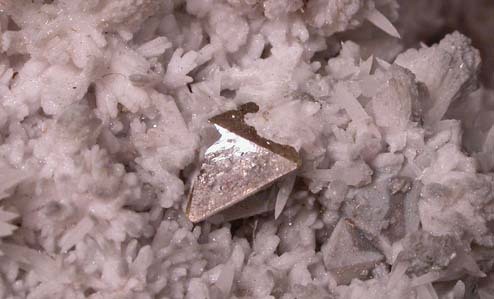 Look under "Silver" in the main minerals listing. 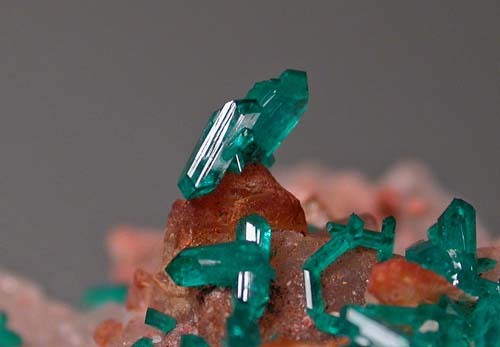 There are a whole new group of Tsumeb minerals on this website, mostly consisting of smithsonite and calcite specimens. Have a look. 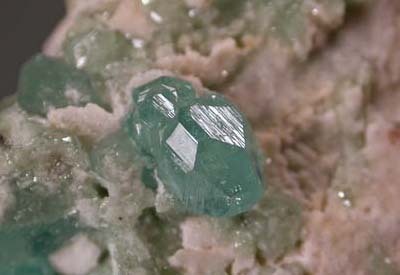 I've added some specimens of scainiite, robinsonite, gudmundite and berzelianite to this website. 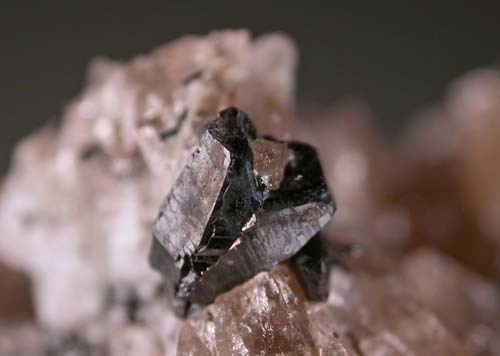 Look under "Sulphides" in the main Minerals listing. 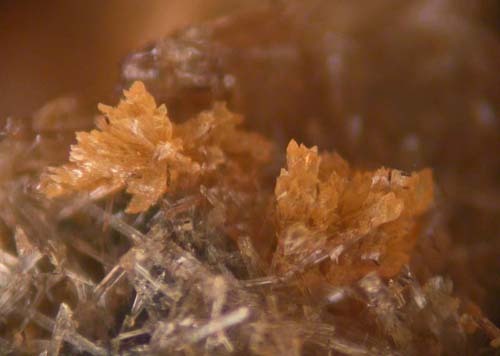 Lots of good looking and some unusual zeolites have been added to the website. 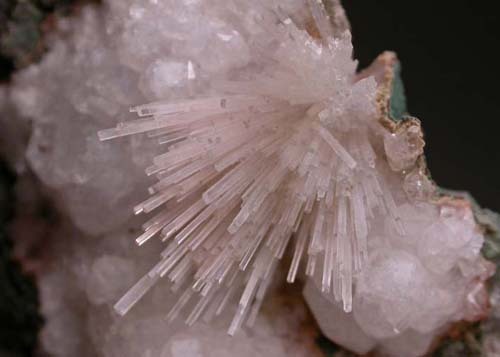 Look under "Zeolites" in the main Minerals listing! 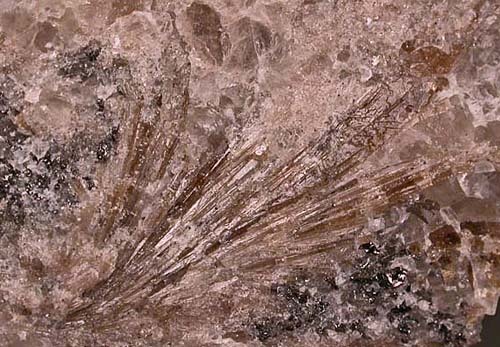 There are quite a few new specimens added to the site from the Lafarge and Flamboro quarries in southern Ontario. Have a look under "Southern Ontario" in the main mineral listing. There is also an article about this region in the "articles" section of this website. 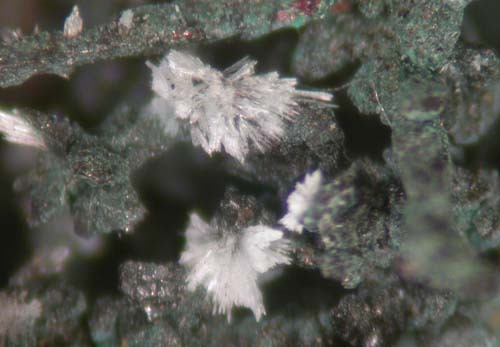 I've added some excellent safflorite specimens from Cobalt plus some nice kulanite specimens from the Yukon to the website. 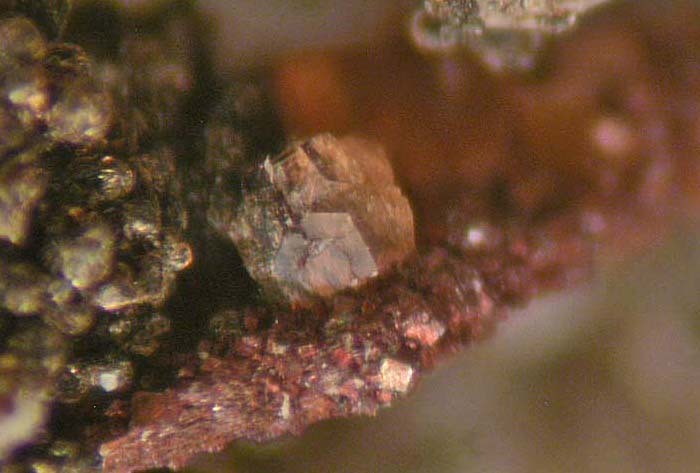 Look under Yukon Phosphates, Kulanite and Cobalt, Various Species. 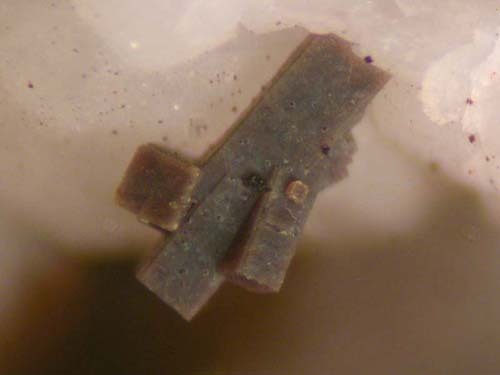 There is now a very nice group of Joseite -B specimens on my website. If you are interested in this unusual telluride, please have a look? 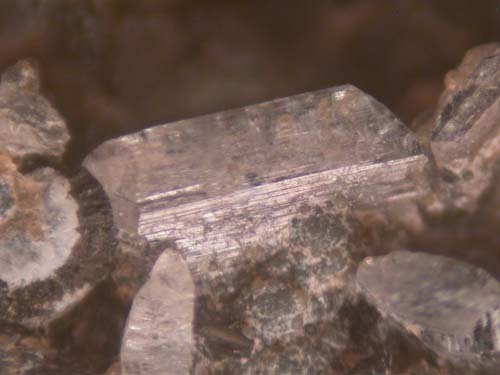 I've just returned from Morocco and brought back some very nice crystallized Silvers, wire silvers and very sharp acanthite ps after argentite specimens. Some are "killers". 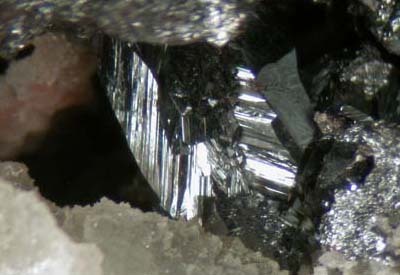 Look under Imiter Mine and Silver, Bouismas Mine. I've obtained a second group of these unusual nuggets from Sonora Gulch in the Yukon, including one big one. Have a look! The "On-Line Order Form" was not working for a few days. If you tried to place and order this way and it did not function, please just let me know or try again? I think the website problems have been fixed! I hope so! If you have any problems, at all, please tell me about them? 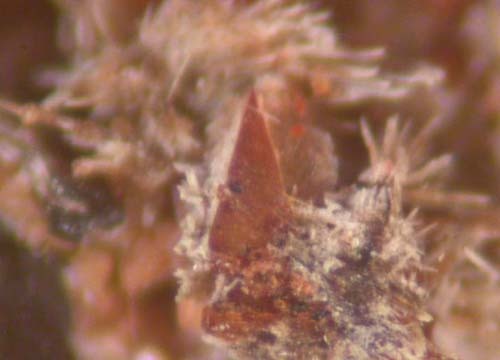 I've added some unique specimens fron the old Engineer Mine, Atlin, British Columbia to this website. 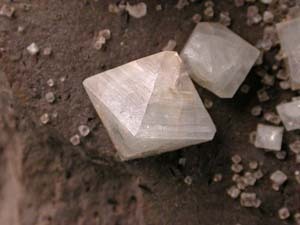 Specimens include electrum, arsenic, stibarsen and calcite. Look in the special "Engineer Mine" section of the site! As well, there is a complete article on the Engineer Mine specimen recovery project in the "Articles" Section of this web site. 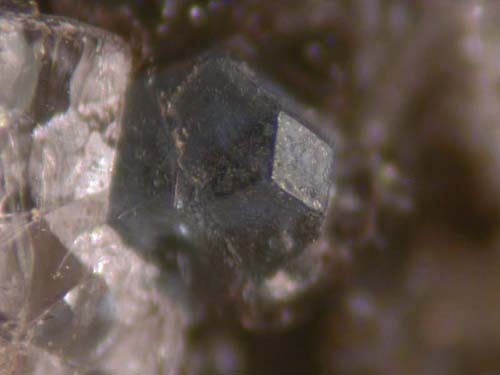 I've put a number of interesting Grenville Geological Province minerals on my website including a number of slightly radioactive minerals like Betafite from Silver Crater mine, uranophane from the Madawaska Mine, uraninite and Kemp Prospect thorite, plus a couple of nice Silver Crater zircons. 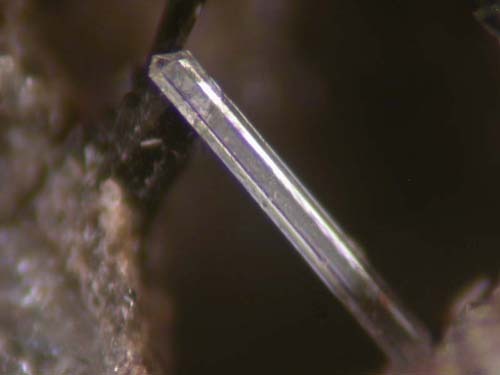 You'll also find some Dravite specimens from the Tait Farm and Rutile crystals from McGregor Lake, Quebec. Look under "Grenville? 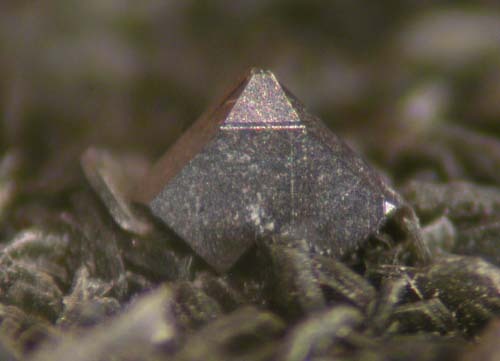 and "Zircons" for new flags. 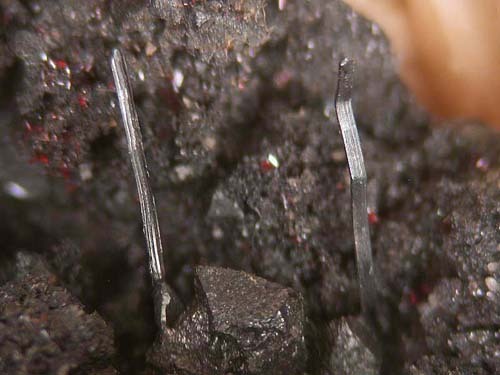 Look under "Secondary Minerals" for a couple of really nice cuprosklodowskite specimens from Musonoi mine. Look for "NEW" flags, in general! Are you interested in quality Tsumeb specimens? 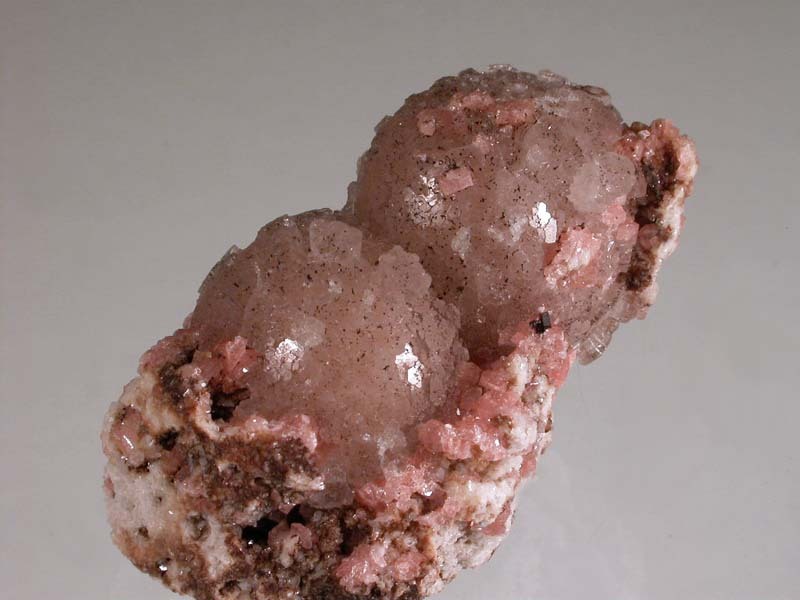 I've added some dandy smithsonite specimens on the "Tsumeb" page. 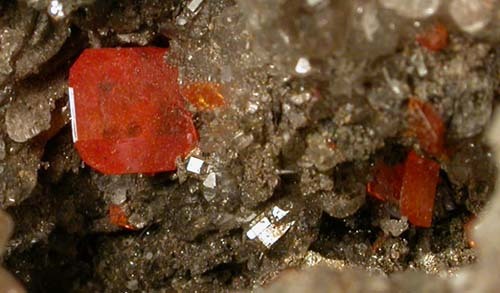 As well there are some other very nice secondary minerals, such as descloizite and mimetite under "Secondary Minerals". 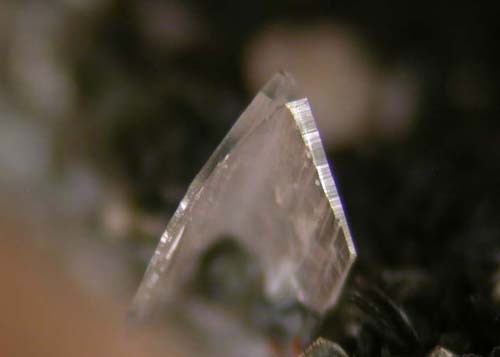 I've put some very high quality quartz specimens showing the Japan-Law twinning on this website under "Quartz". 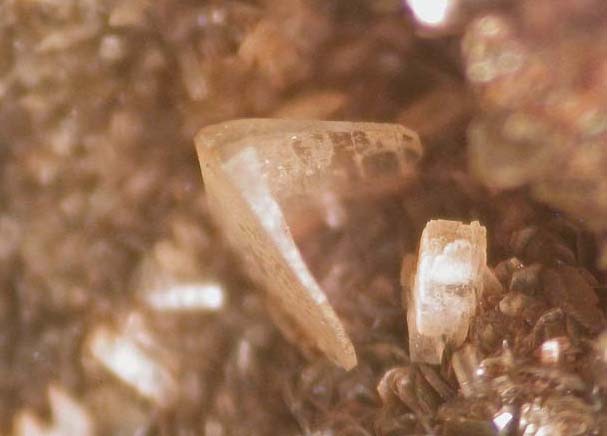 There are a LOT of new Yukon phosphates from Rapid Creek and Big Fish River on the website, including satterlyite, wicksite, lazulite, wolfeite, gormanite, brazilianite and maricite. 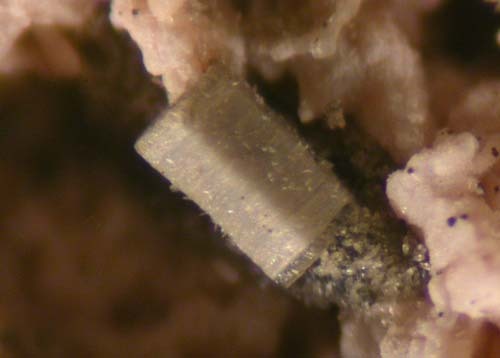 I've put some interesting gold-tetradymite nuggets on the website, as well as some unique native antimony. 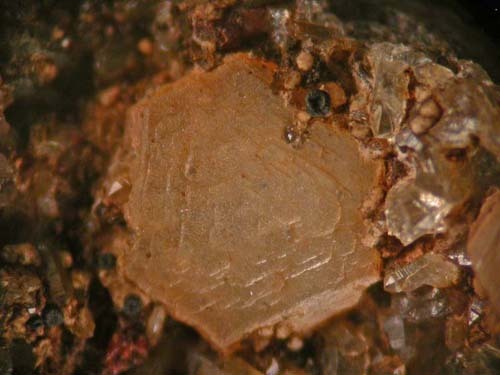 There are two new photo-essays about recent collecting activities in Nova Scotia -one about collecting zeolites on the Bay of Fundy and the other about collecting native antimony at West Gore. Look in the "Recent Activities" section of this website. 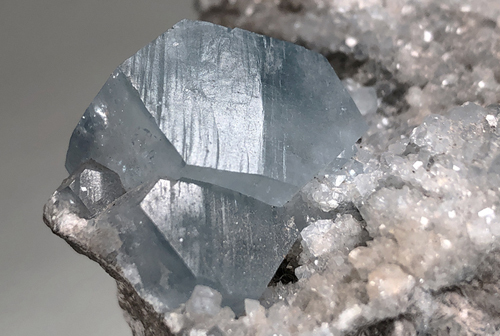 I've added some great new specimens from the Cobalt-Gowganda silver mining area to my website, particularly non-silver specimens like bismuth, safflorite, lollingite, etc. As well, some additional great old gold specimens from the Kerr Addison mine. 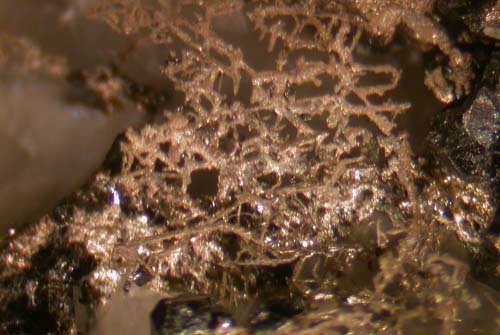 I've added amazing GOLD specimens from the Kerr Addison Mine, misc. 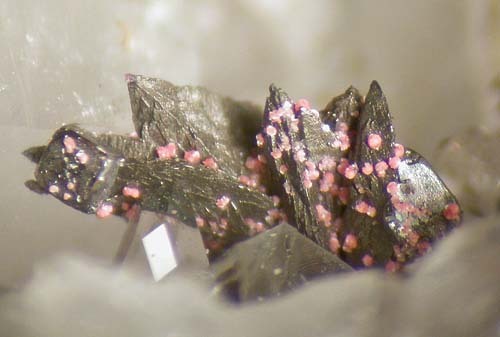 sulphides, and nice calcite specimens from Norwegian and Inverhuron, Ontario localities. 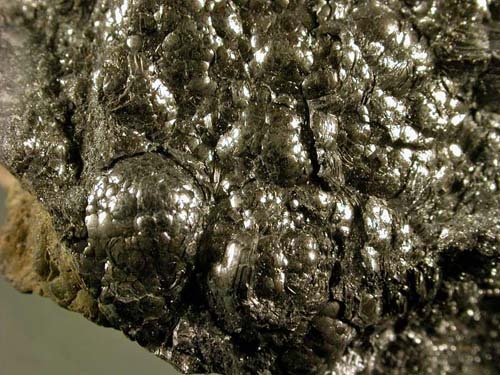 I've put two new entries in the "Recent Activities" section of my website: -A visit to the Museum of Natural History in Milano, Italy -Tucson, 2012, some highlights As well, in the "Articles" section, there is a short article on observations on the mesmerizingly interesting and fascinating topic the darkening of native arsenic. Check it out and fall asleep! 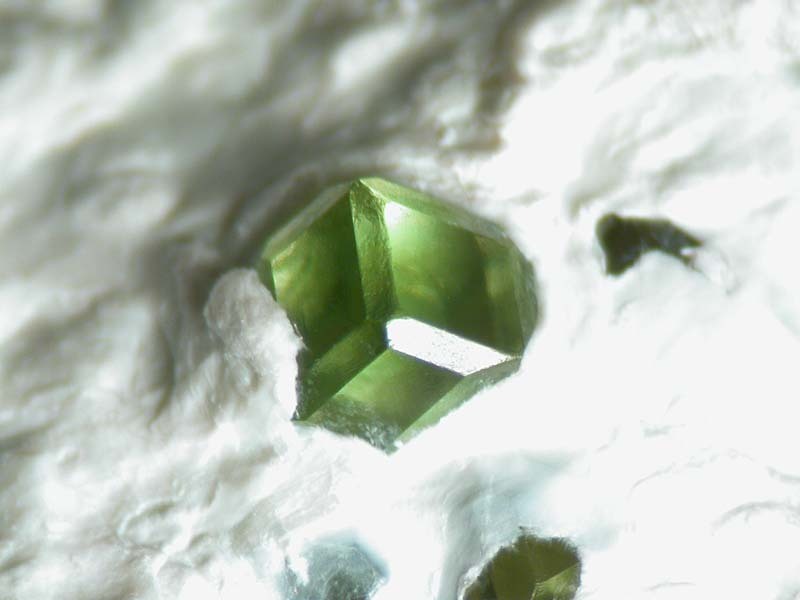 I've put some nice, new diopside, grossular and vesuvianite specimens in the main Minerals Listing. 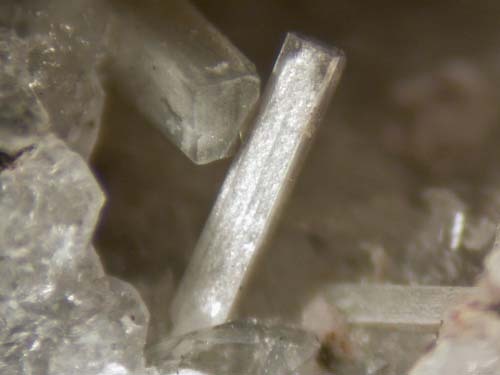 There are now some interesting new native mercury specimens from the New Idria Mine, California and some nice senarmontite crystals from the Classic Algerian locality on this website. 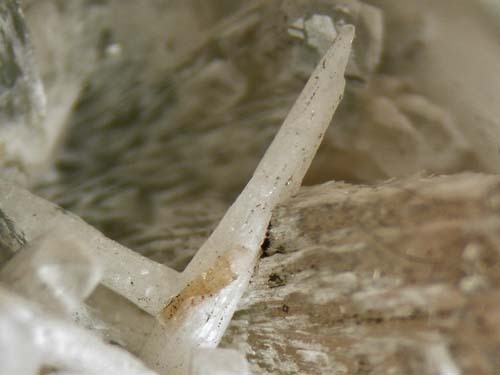 There are now some excellent specimens of Alabandite, sperrylite and skutterudite on this website. 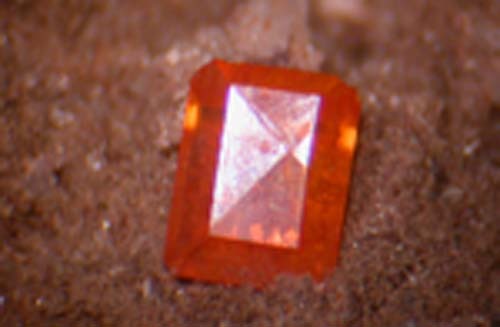 Look in the main Mineral List. 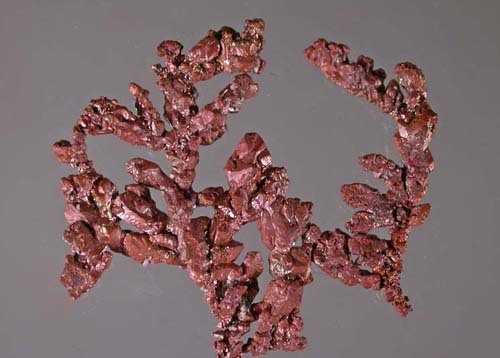 I've added four pages of native copper specimens from the Keweenaw Peninsula to this website. Classic specimens and localities! 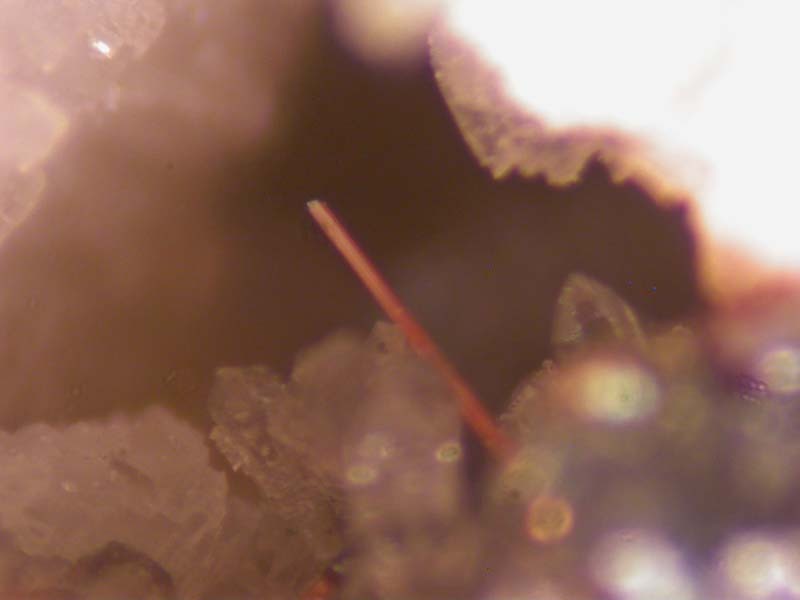 I am fortunate to have obtained some interesting magnetite crystals that occur in massive sulphides at this new Nickel-copper mine. 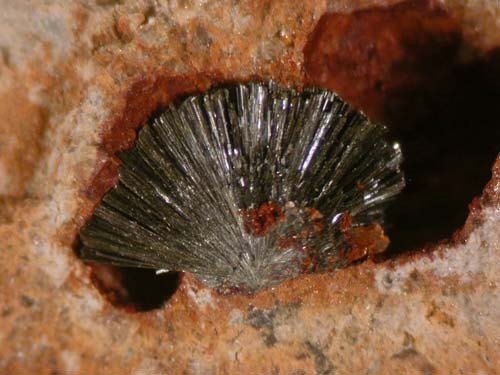 They are under "Magnetite" in the main mineral listing. 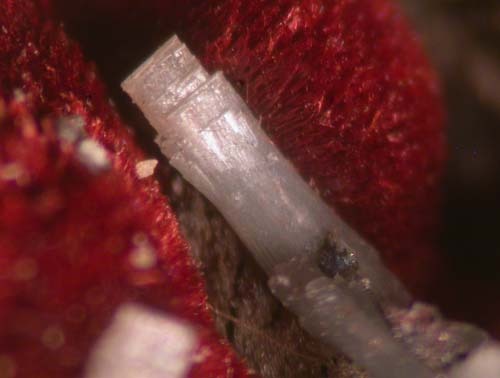 I've put some excellent specimens of sperrylite, from a new find at Sudbury, on my website. 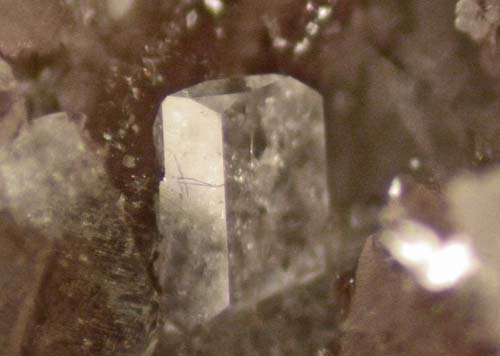 Look under "Sperrylite" in the main mineral list. Michael Bainbridge, the well-known artist and accomplished mineral specimen photographer came to visit me in Newmarket, recently. I've put a little write-up about the visit in the "Recent Activities" section of my website. 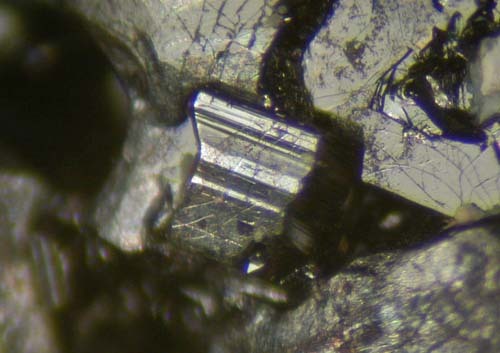 Sursassite, Suolunite, Fluorapatite and Silver Islet! I've added a number of interesting new and unusual specimens to my website. You won't find these sorts of specimens on other sites! I was fortunate to visit l'Ecole des Mines while on a trip to Europe, recently. I have put a short photo essay of the visit in the "Recent Activities" of this website. I hope that you find it interesting! 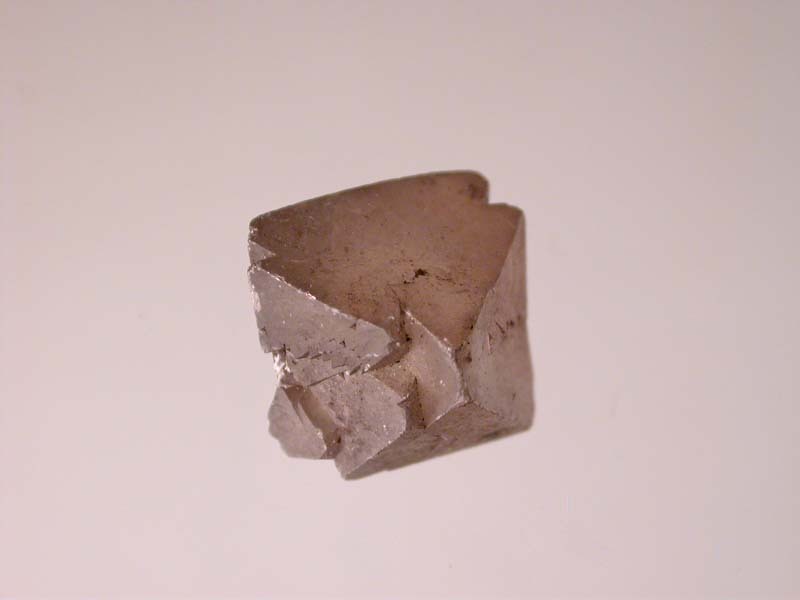 I've added many new specimens from the Cobalt Silver Mining Camp to the Website! 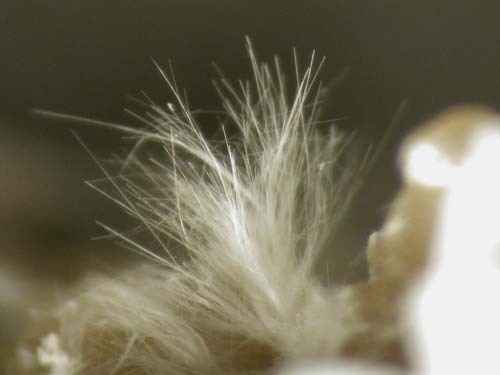 I've just put the 10,000th specimen on my website! That is a lot of specimens over the years! 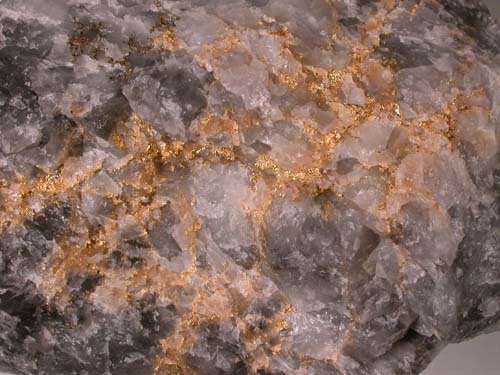 It is a very rich, good looking specimen of native gold in quartz from the Rivard Mine in Northwestern Ontario. 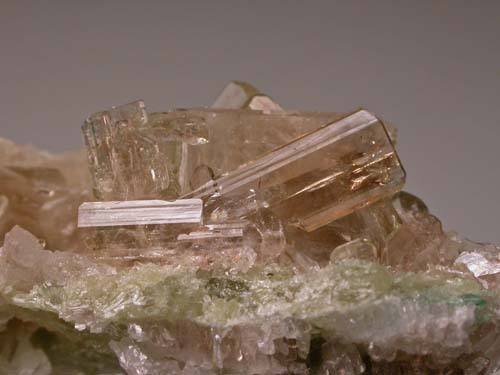 I've added quite an assortment of Canadian Minerals to the website recently. 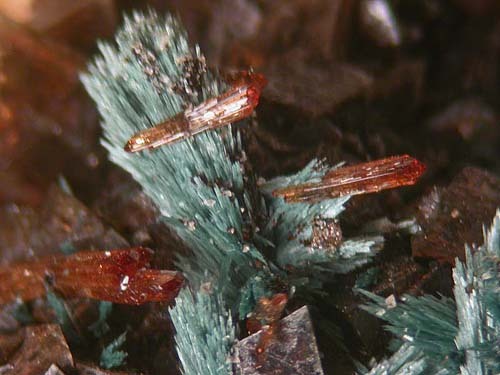 Check out the NEW flags in the main minerals list to locate the newer specimens. 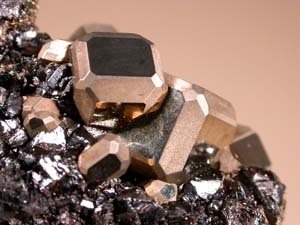 Fluoborite, hematite, titanite, orthoclase, fluorapatite, berthierite-gold, etc. 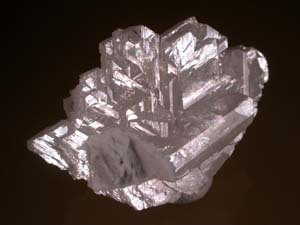 I've added some really nice silver sulphosalt specimens from the Uchucchacua Mine, Oyon Province, Peru to this website. 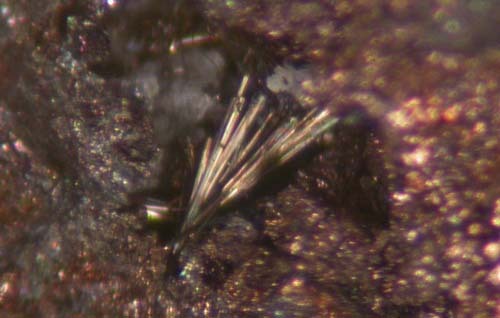 Proustite, pearceite and acanthite ps argentite. As well, there are some interesting silver leaf-encrusted with bornite pieces from the Strathcona Mine near Sudbury, Ontario. 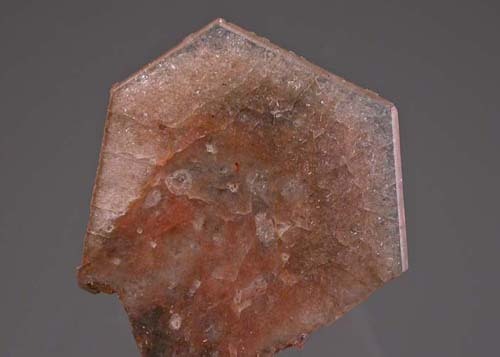 I've put some amazingly rich altaite specimens from Mattagami Lake Mine on the site as well as some unusual surassite specimens. Look under those minerals in the main Mineral Listing. As well, I've put a few more oldy-rich (from the 10's and 20's) silver specimens from Cobalt, Ontario on my website. 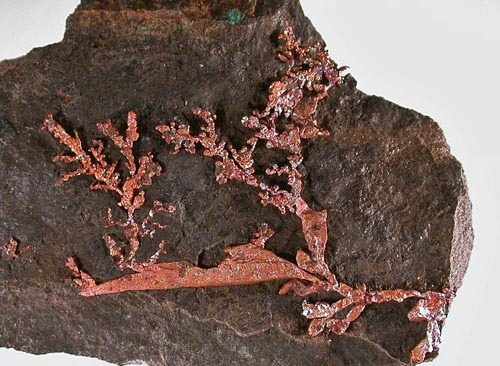 I've also added some exceptional specimens of native copper from Cape D'Or, Nova Scotia. Check out the article on this location in the "Articles" Section of this website. I have added some beautiful specimens of Fluorite, sphalerite, galena and associated minerals from the limestone quarries just west of Toronto. Look under "Southern Ontario Limestone Quarries" in the main minerals list. 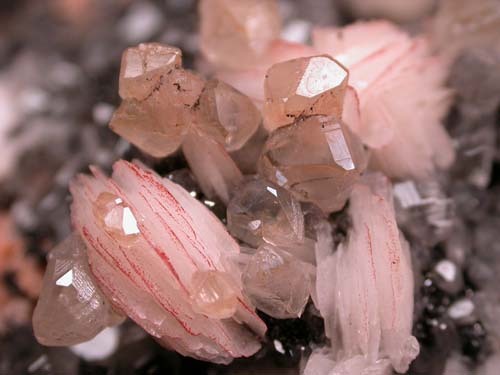 I've added even more very nice Mont Saint-Hilaire specimens to my website in the main Mineral Listings under "Mont Saint-Hilaire". Many very rare and well crystallized minerals! 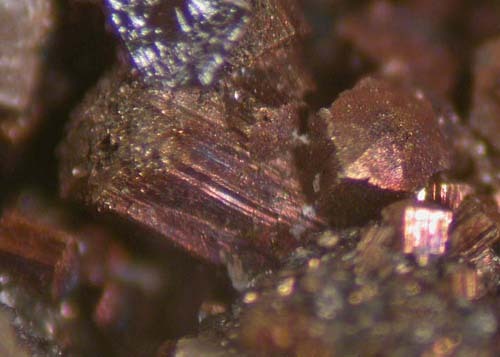 I've added a new article entitled "Collecting Copper Crystals at Cape D'Or, Nova Scotia" to my website. Look for it in the "Articles" section of the website. I have managed to locate some old silver slabs from the Cobalt Silver Mining Camp. By old, I mean that they were recvered from mining operations in the 10's, 20's, 30's, etc. Rich! 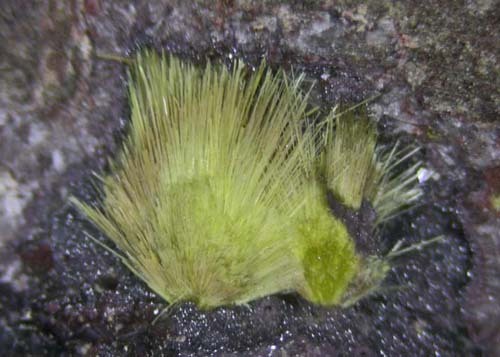 I have loaded a page of unusual and rare suolunite specimens on this website. 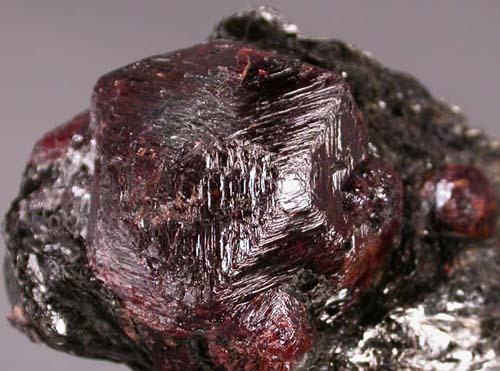 Look in the main Mineral Listing. I've added a couple of hundred new specimens from Mont Saint-Hilaire to my website. 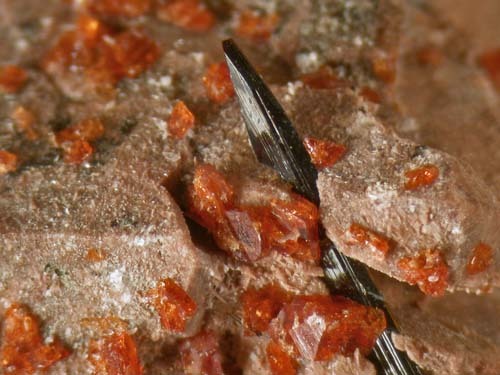 Have a look in the main Mineral list at the pages with "NEW" flags. 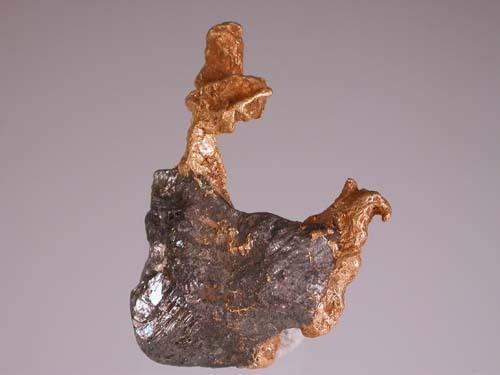 There are a number of specimens from Goldcorp Inc.'s Musselwhite mine now on my website. I am very pleased that Goldcorp Inc. management have agreed to make these specimens available to collectors and institutions. 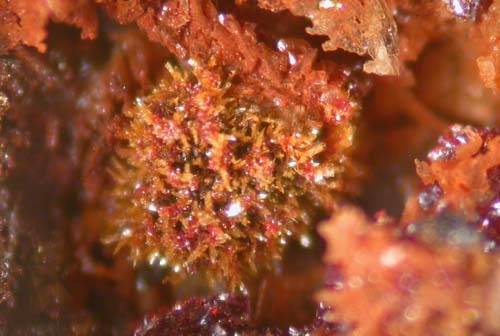 Check out the unusual association of gold and garnet! 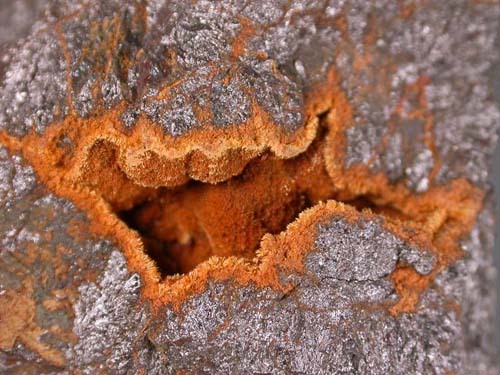 I have obtained unusual specimens of sarabauite from the type locality and they are now available on this website. 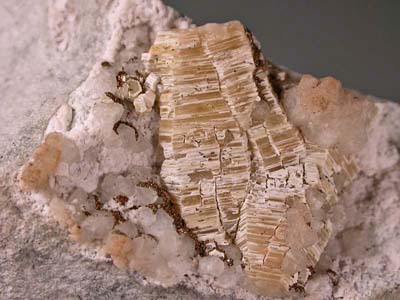 As well, there are a number of specimens of cosalite with galenobismutite and gold from the Mondoux claim. Collected in 1918 or so! Hard to come by, these days. 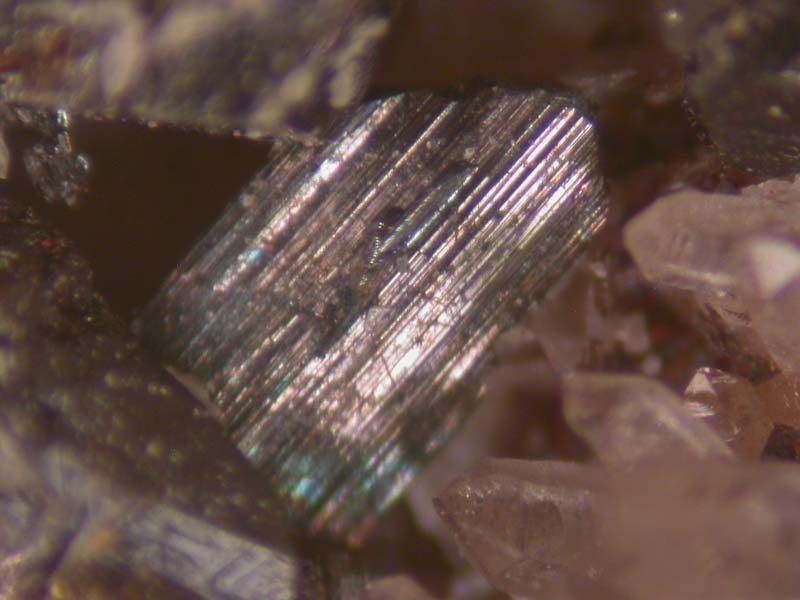 I have been fortunate to be able to obtain some really nice Imiter mine specimens, including proustite, imiterite, xanthoconite and acanthite ps argentite. Look under "Imiter" in the main Minerals listing. 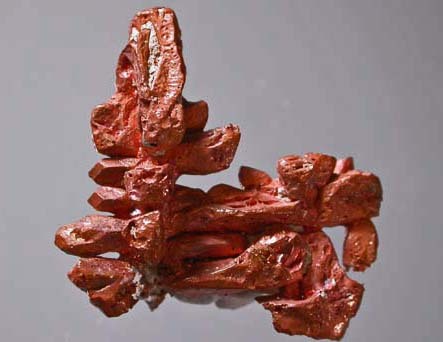 I've added some rich specimens of Siberian native iron (terrestrial) and native tellurium from Moctezuma to my website. 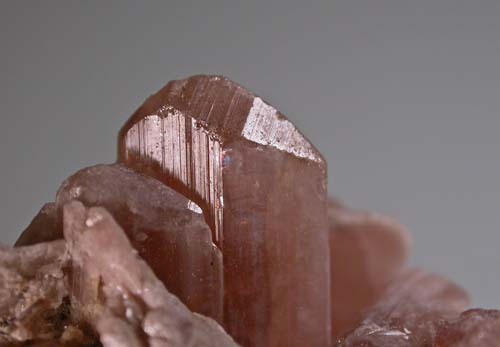 In the main Minerals listing. 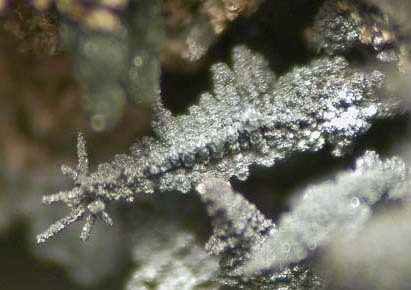 I've added a couple of pages of specimens of very beautiful and interesting crystallized gold at reasonable prices. 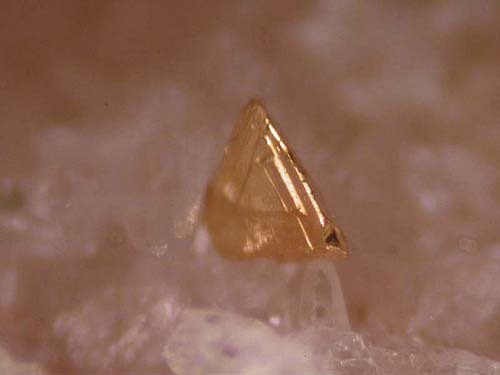 The Olinghouse Mine is a modern "classic" locality for crystallized gold. Check out the images that I've posted from a trip that I took many years ago to the museum in Kongsberg, Norway. Amazing silver specimens! Look in "Recent Activities". I've just returned from Quebec with some very nice specimens From Mont Saint-Hilaire, including serandite, carletonite, catapleiite, tuperssuatsiaite, taniolite, leifite, plus green demantoid-andradite garnets Jeffrey Mine. 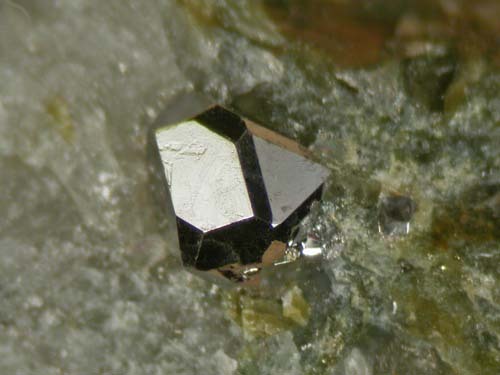 Look in the main Mineral Listing of this website for those two localities. 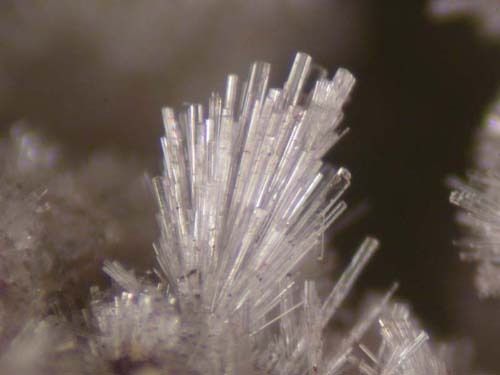 I've added excellent specimens of gormanite, kulanite and a few other phosphate minerals from the famous Rapid Creek area of the Yukon Territory. 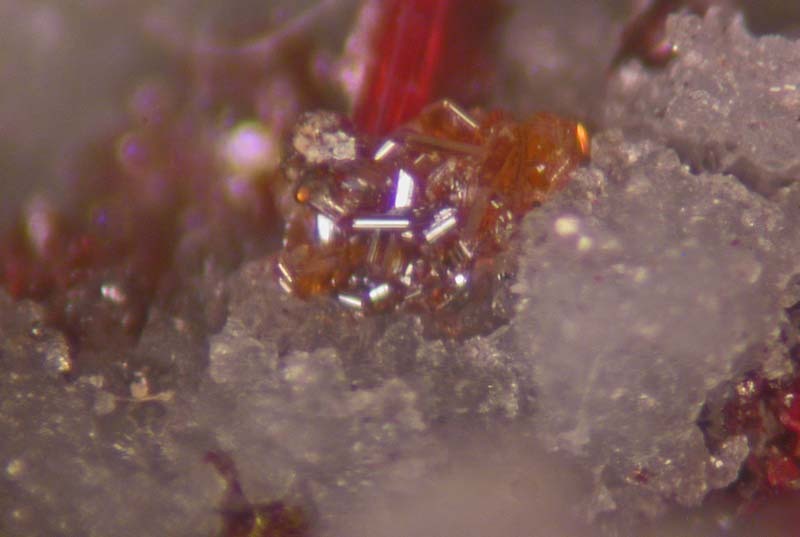 I've added very nice sulphide and associated minerals from Bulgaria, Romania and the Nanisivik Mine of northern Canada. Have a look under each of those headings! Lots of new and rare Mont Saint-Hilaire specimens have been added to my site. 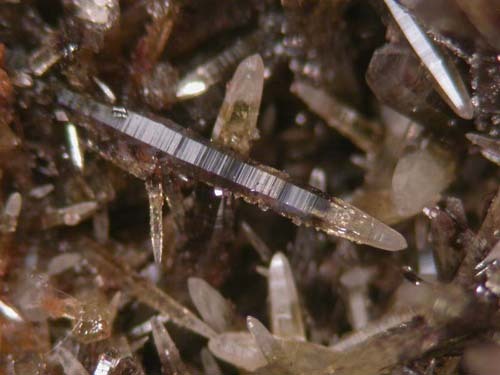 Check out the "NEW" flags in the main "Minerals" list and the "Microminerals" listings. 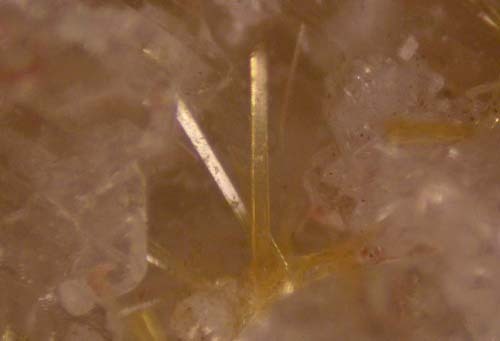 I've added a bunch more nice Rivard Property gold-in-quartz specimens to the website. Have a look! 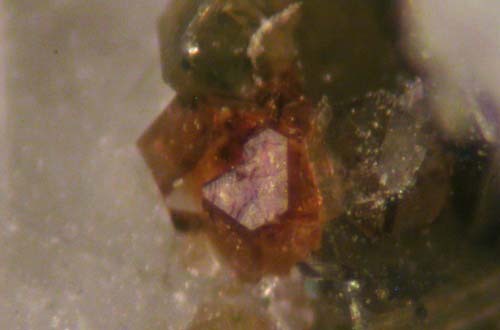 I have added a couple of pages of zircon crystal specimens from a number of Grenville Geological province localities, and notably Kuehl Lake. 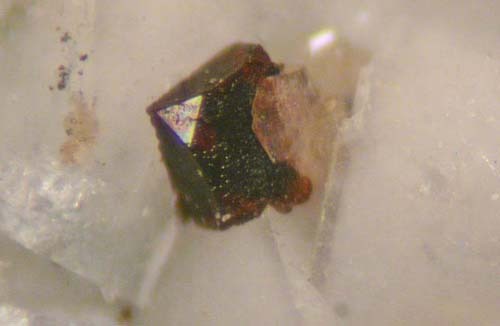 Look under "Zircon". As well, there are many other specimens added to the website. Look in the categories marked "New". 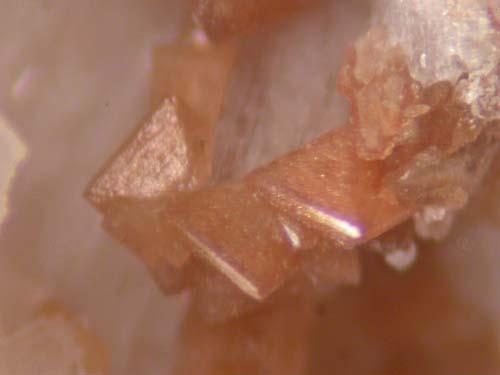 I have been fortunate to obtain some very nice looking and interesting gold in quartz specimens from a small mining operation near Red Lake, Ontario. Check out Gold from the Rivard Property. As well, I've added the last specimens that I have from my Red Lake Mine hoard. This is it! Latest Cobalt Area Silver and Minerals! 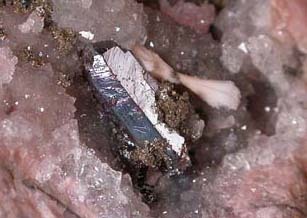 As mentioned earlier, I recently visited the Cobalt area and collected or bought many new and interesting specimens of the unique minerals from that area. 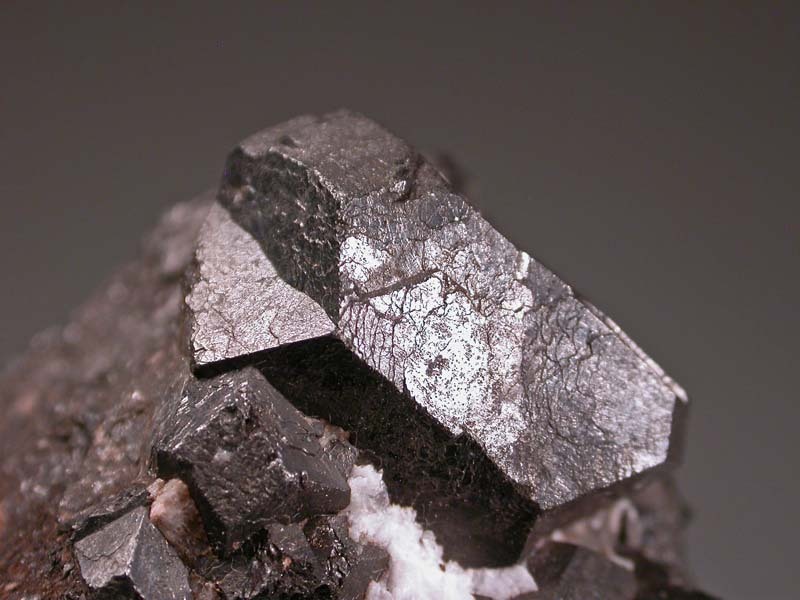 Look under Cobalt in the main mineral list. I recently paid a visit to the Cobalt area to do some collecting and buying. Check out the "Recent Activities" section of this website to see and read an account of the trip. Recently, I visited the Yukon Territory. What a beautiful place. 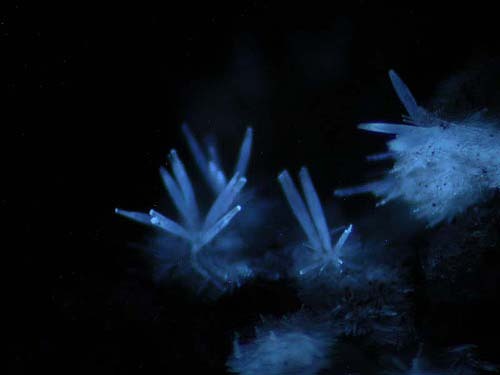 Interesting mineralogically, as well. 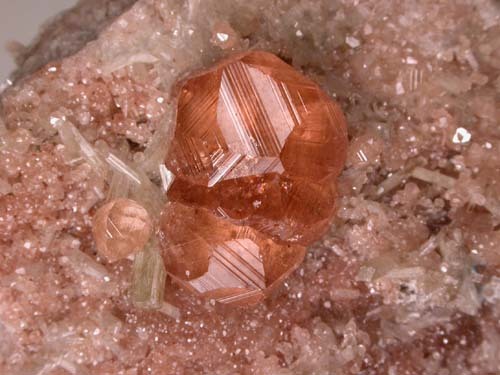 Please look in the main "Minerals" listing for yukonite, copper nuggets, scheelite nuggets (!) 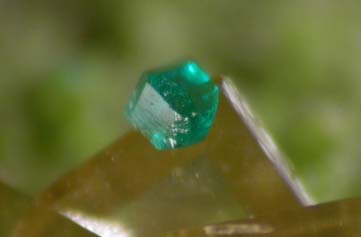 and very nice valleriite. All rare and unusual. As well, I have put a photo essay of my trip to the Whitehorse Yukon area in the "Recent Activities" section of the website. I hope that you enjoy it. 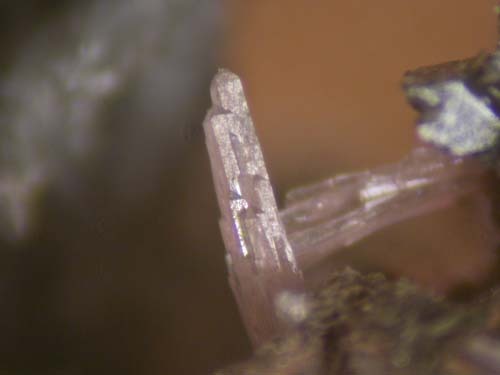 I've loaded many new rare and interesting specimens from Mont Saint-Hilaire onto the website both in the main Mineral List and the Micromineral section. Look for the "NEW" flags! 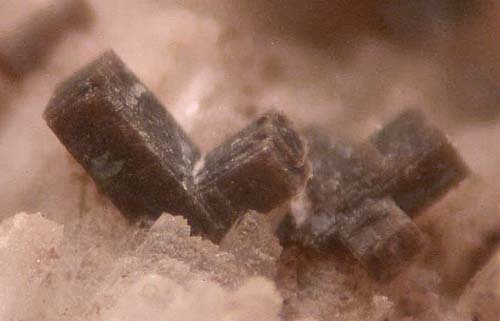 Spencerite, Dawsonite (from the type localities) and lots of unique Canadian and International specimens added. I've added a number of new specimens to this website. Have a look under the "NEW" flags! 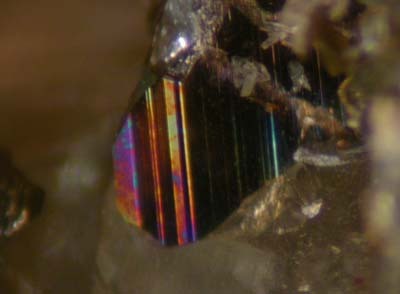 Here are a couple of minerals that you don't see available very often! 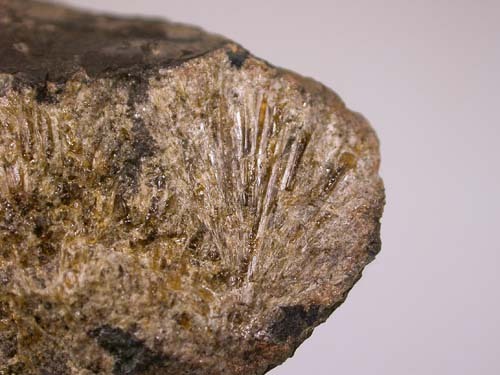 Nova Scotian Minerals -NOT Zeolites! 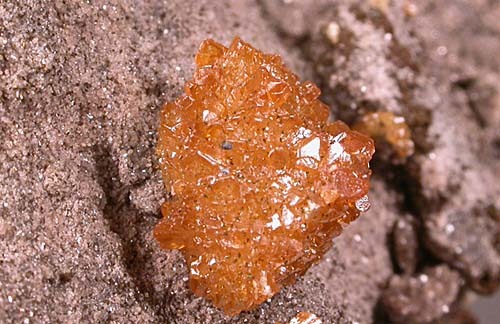 I've added some very interesting minerals from Nova Scotia to the website. 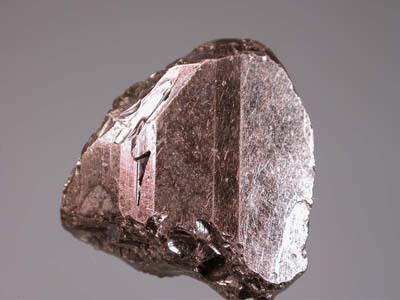 Excellent copper, manganite and hematite specimens. 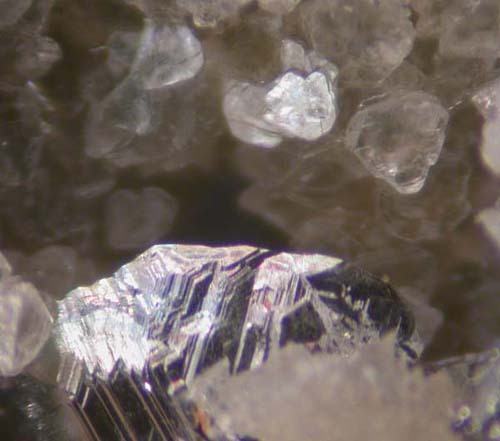 Not ALL minerals from Nova Scotia are zeolites! I've put some new specimens of high grade gold from the Croesus and McIntyre Mines on the website. 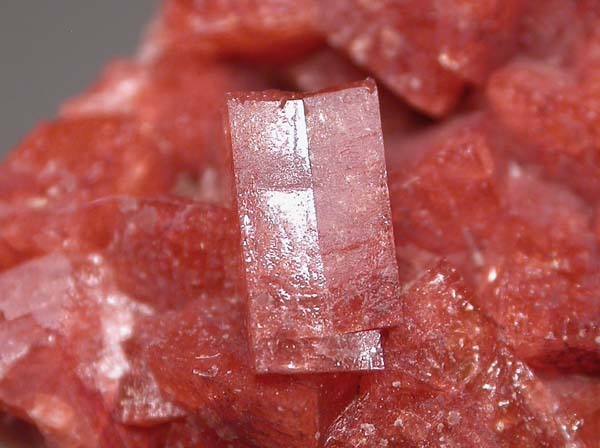 As well, there are some nice, new Jeffrey Mine vesuvianite specimens, as well. 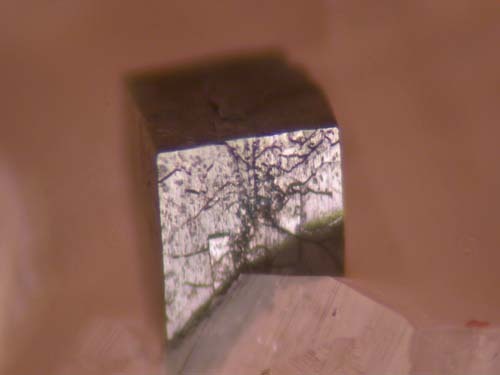 There are lots of new sulphides, sulphosalts, tellurides, arsenides, etc. Look for the "NEW" flags! 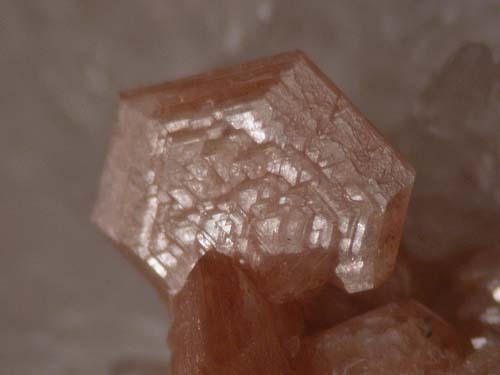 I've added some very nice specimens of some fairly rare minerals to my website, some from type localities. 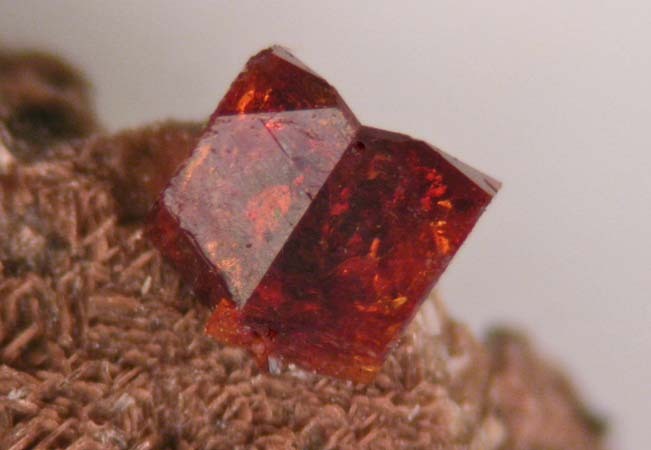 Check them out in the main mineral listing! 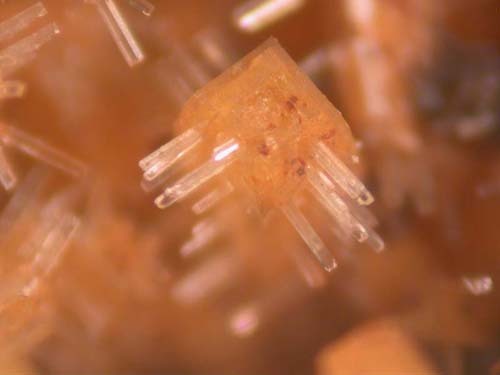 I've added loads of new zeolites from Nova Scotia to my website, especially stilbite, chabazite, gmelinite heulandite and a few others. 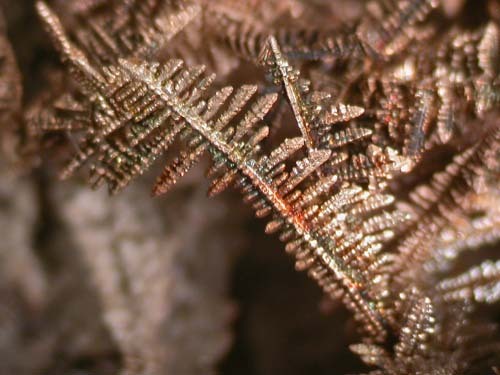 Crystallized copper, too! 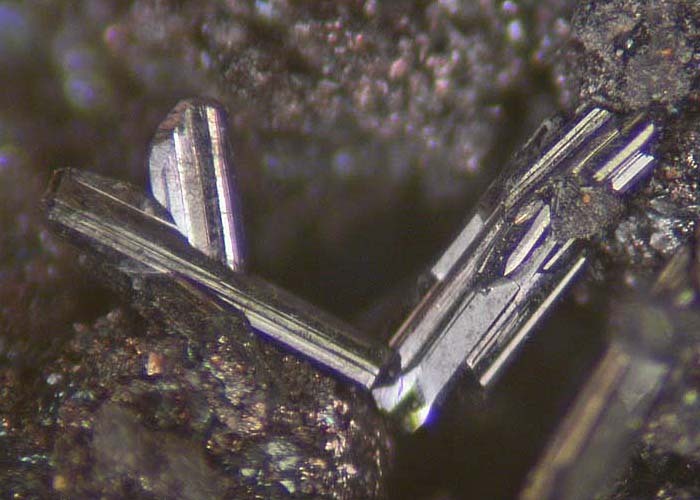 As well, I've prepared some excellent new titanowodginite specimens from the type locality. Look in the "Tanco Mine" section of the website. 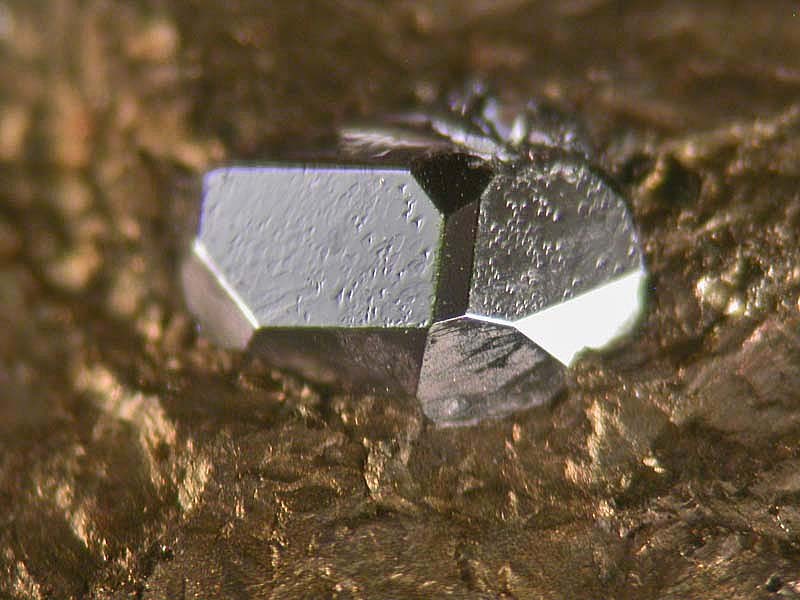 I've added some excellent new minerals and high-grade silver from the Cobalt area to my website. 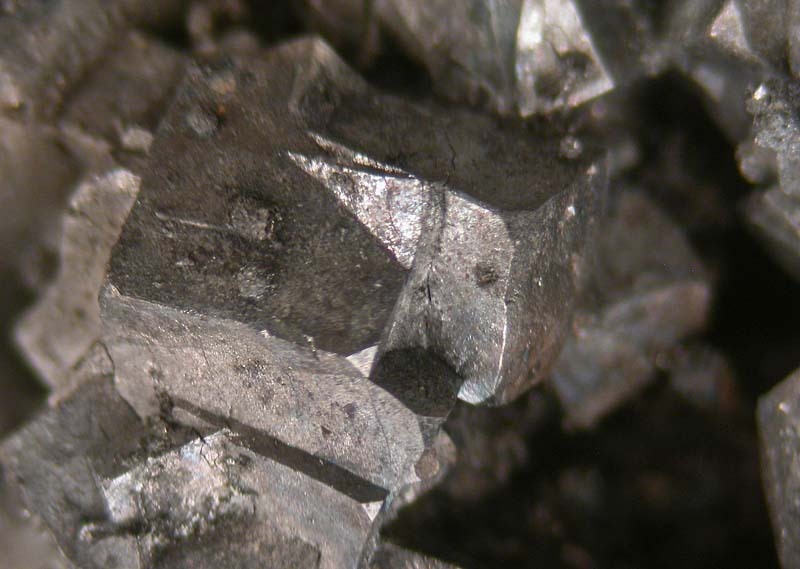 Not just silver but rammelsbergite, breithauptite, nickeline, loellingite, pyrargyrite, etc. Look in the main Mineral List for the new flags under "Cobalt". 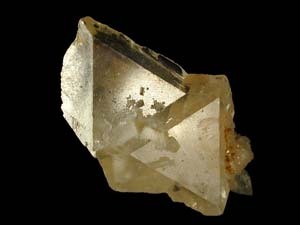 I've added some odd ones to the website: brewsterite, Yellow Lake, BC, fluorite, Montrose Road Rock Dump and calcite, goethite and manganite rom Atikokan. Look for the "NEW" flags. There is also a write-up on a nice collecting trip I did to Waterloo Mine and Yellow Lake, in British Columbia, last summer(2009). Look under "Recent Activities" for it. 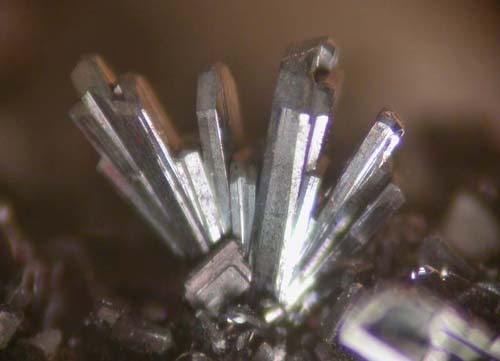 I've added some pretty unusual items to the website in both the "Rocks and Ores" section and the main "Mineral List": Stibarsen, Engineer Mine; Ores from Keno Hill; Ores from Venus Mine; lots of other unusual items. Browse a little! Look for the "NEW" flags on each section. I know that beauty is in the eye of the beholder but it is just NOT like me to offer such a colourful assortment! 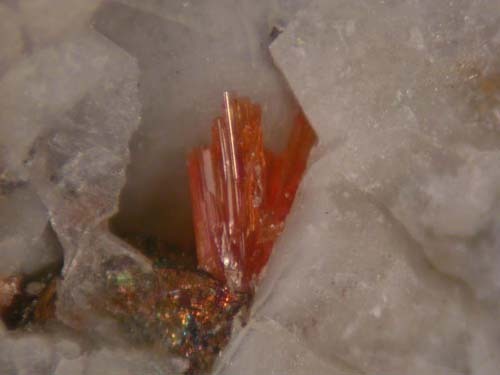 Colourful vanadinite, vesuvianite, cinnabar have been added to the website along with some less-colourful danburite and large spinel crystals. I've added some very good specimens of Brazilian montebrasite, Itauz Mine copper, Siberian native iron and Moroccan nepheline and schorlomite. Look for the "NEW" signs in the main Mineral List. I've added some maucherite/nickeline specimens to the website. These are old specimens collected back in 1913! 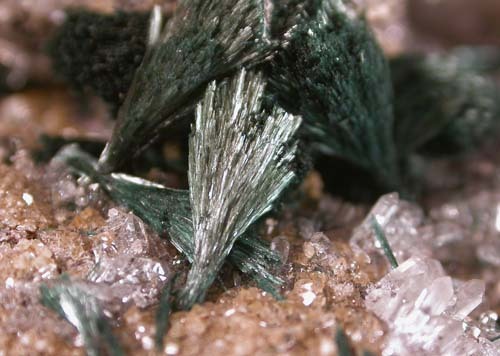 As well, some nice specimens of the chrysotile variety of serpentine have been added under the "Rocks and Ores" section of my website. I attended a field trip fo the Walker Mineralogical Club last summer at the Logan Cuts, an old, overgrown corundum mine. Look under "Recent Activities" for a little slide show on this trip. 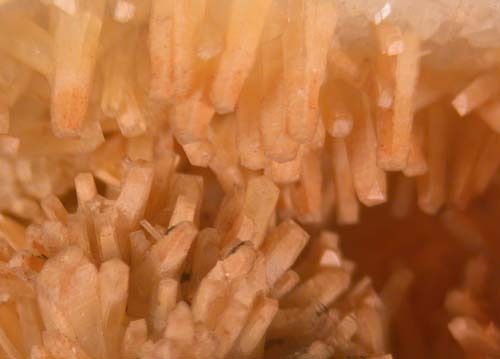 There are some nice, new sperrylite specimens on the website under Sperrylite in the main mineral list. 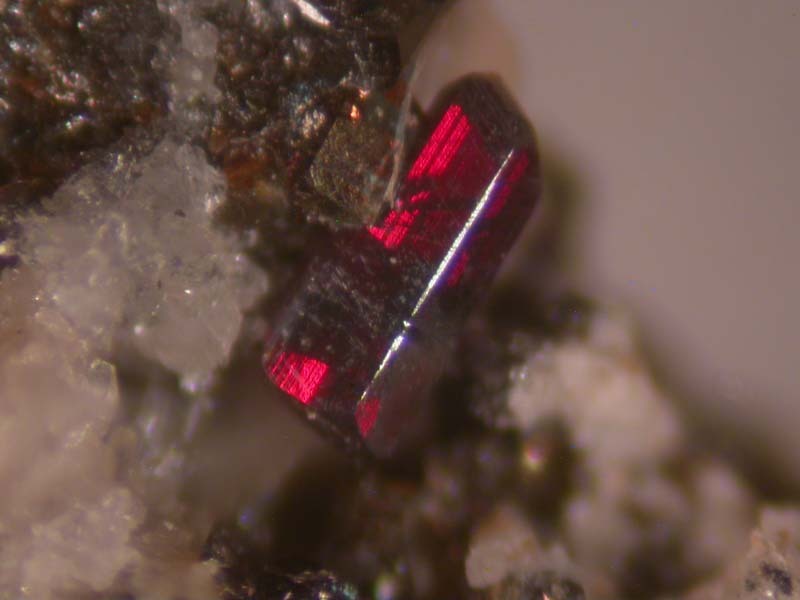 There were also some nice arsenohauchecornite specimens and kimberlite specimens but they have all been sold. I was fortunate to come across an old cache of native arsenic from the locality at Port Alberni, British Columbia. Much of it is botryoidal and some massive. Look under the "Arsenic" pages. 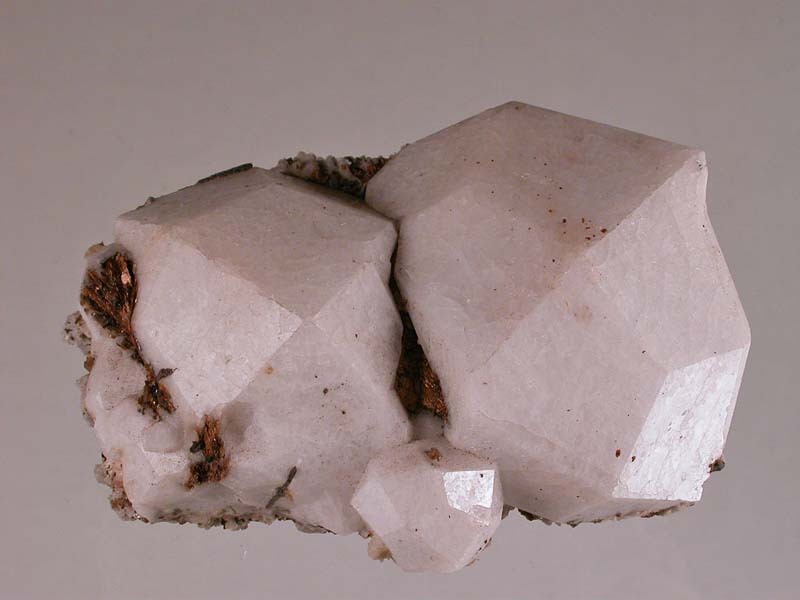 I've added many new mineral specimens from the Grenville Geological Province to my website. 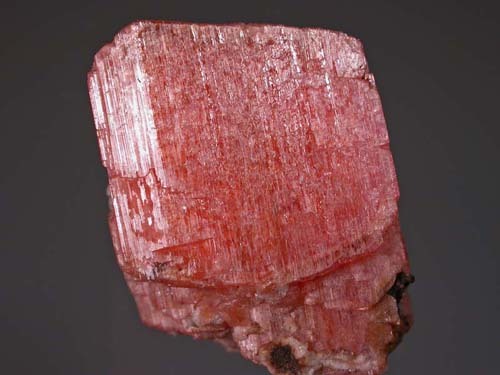 Some of the minerals include uranophane, tourmaline, betafite, titanite, corundum, apatite, orthoclase, etc. Check the "Grenville" pages. 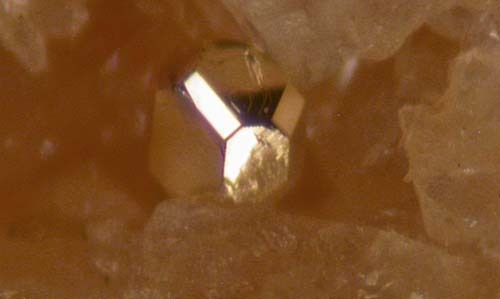 I've posted some exceptional crystallized gold nuggets from the Gold Run Mine, Atlin, British Columbia on my website. Beautiful! 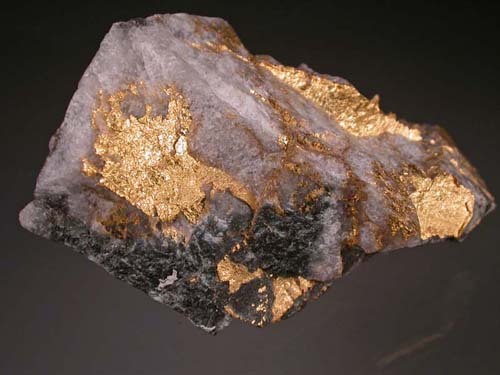 As well, there are some unusual gold specimens from Red Lake Mine, Cariboo Gold Quartz Mine, Sigma Mine and others. 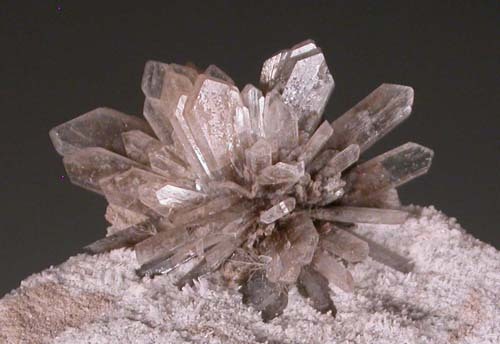 I've placed many new MSH specimens on my website including rarities such as tsepinite, cancrisilite, ussingite, mckelveyite, lintisite, leifite, epididymite, eudidymite, etc. 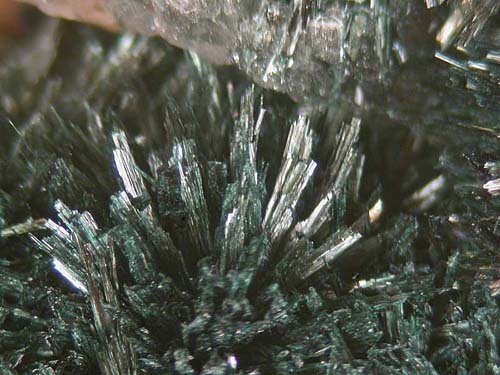 Look under the main Mineral Listings as well as the Micromineral Listings for the "new" flags. 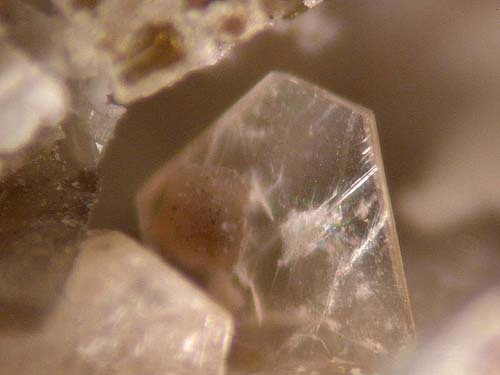 I've added some very nice zeolite minerals from the Bay of Fundy area of Nova Scotia to my website. 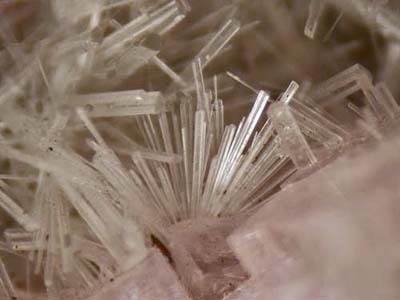 There are some very nice specimens of analcime, heulandite, thomsonite, chabazite, stilbite, etc. 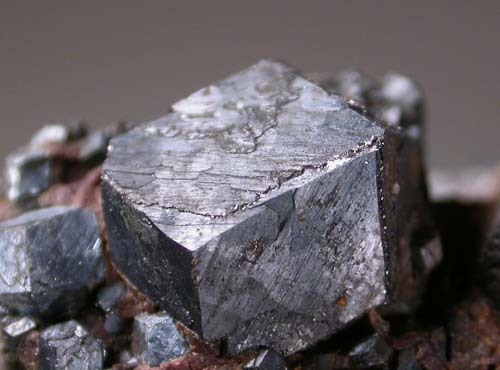 I have been able to acquire some excellent new minerals from the Cobalt Mining Camp, including both silver and some of the more unusual minerals. Under "Cobalt". Some very nice specimens of vesuvianite and grossular added to my website. As well, some excellent specimens of fluorite and sphalerite from the Flamboro and Lafarge Quarries in southern Ontario. Lots of new specimens on my website: Gold specimens from the Olinghouse and Red Lake Mines, Native Iron from Greenland, other elements, unusual specimens from the Newfoundland Zinc Mine. 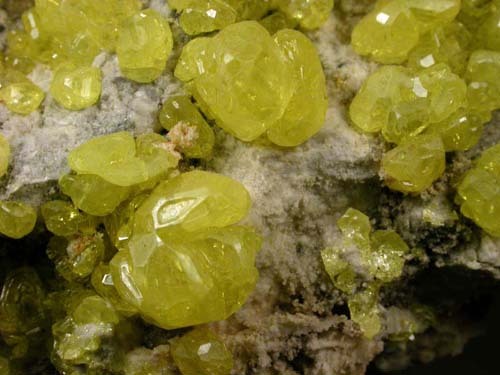 I am fortunate to have accessed an old cache of prehnite and pectolite from the famous Jeffrey Mine. As well, I have re-activated the "Rocks and Ores" section of my website. Lots of unusual items from mines and locations around the world. 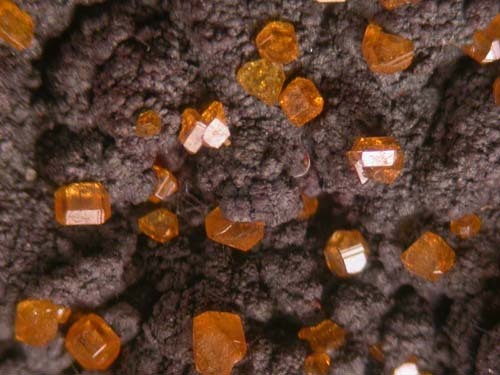 I have acquired some of the very nice wulfenite/mimetite specimens from the Ojuela Mine, Mapimi, Mexico. Gorgeous specimens! 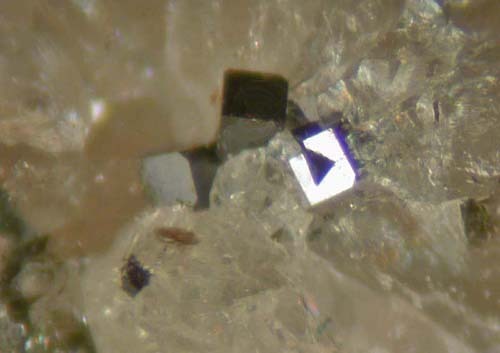 As well, There are also some new, museum quality carrollite specimens from the Kamoya Mine. Kazakhstan coppers, as well! These are all in the main Mineral List of this website. 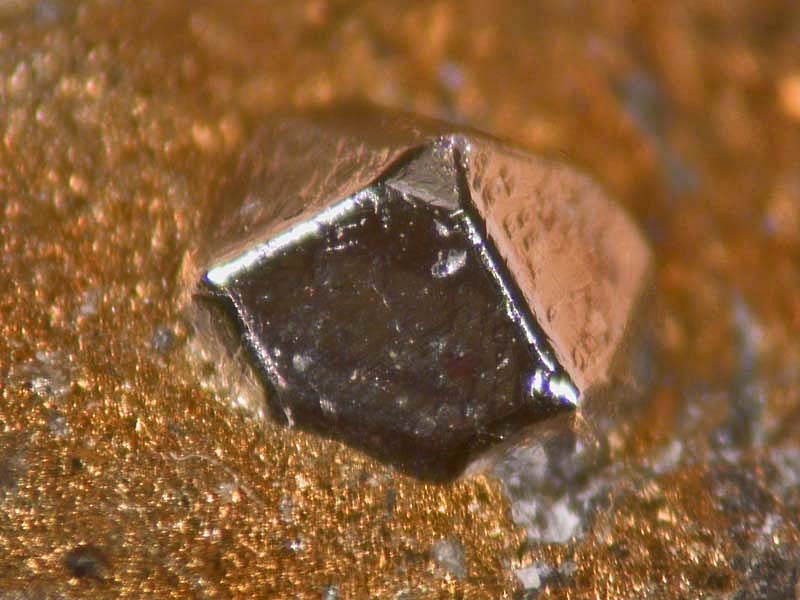 I've added some nice new silver, including wire, and associated mineral specimens from the famous Cobalt Camp. Look under "Cobalt" for all. Hopefully, you find this website relatively easy to navigate. To assist you even more in finding exactly the mineral or the locality that you are interested in quickly, I have added a simple seach engine to the website. Simply enter the mineral OR locality that you want to seach for and all entries concerning the words that you entered will show up in the results. I hope that this helps you! 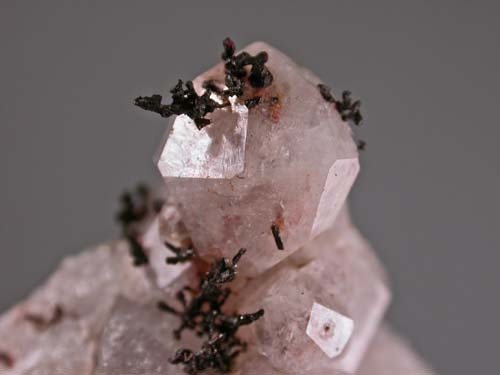 I am privileged to be able to offer you specimens from the Paul Lortie collection, rich in sulphides, sulphosalts, elements and rare minerals. Look under the "new" flags for those specimens. 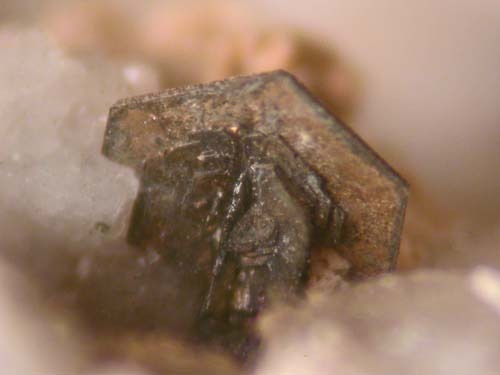 I have, recently, added a number of nice specimens from the Grenville Geological Province including titanite, apatite, zircon, etc. The Lost Mine has been found! 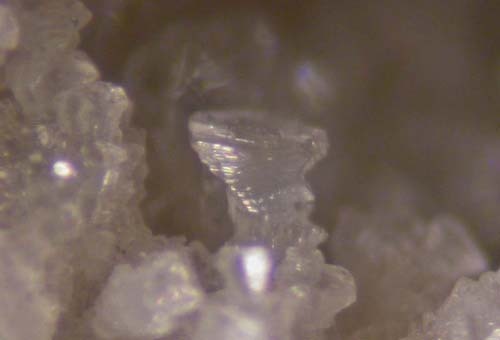 Have a look in my "Recent Activities" section to see in-situ mineralization and calcite vein-dyke collecting pictures. 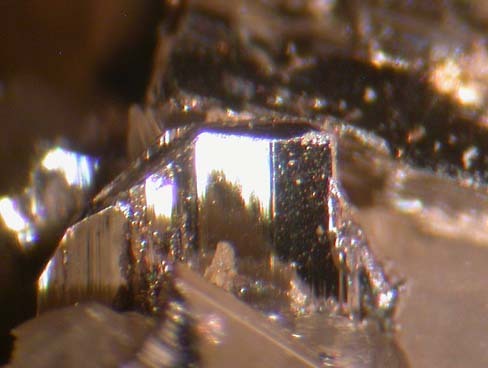 The Platinum Crystal page of my website is now populated with some excellent crystals of Russian platinum, some gold-coated. 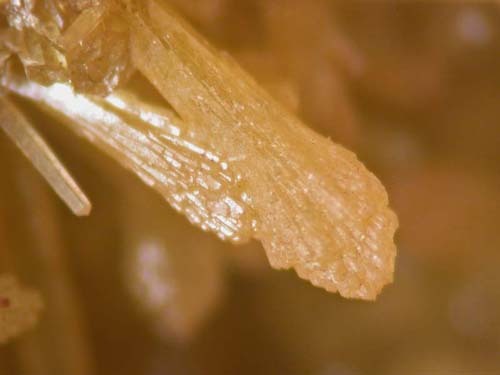 Look under the "Treasures, Odds and Sods" page for other assorted well-crystallized specimens and check out the other "NEW" flags on my website. 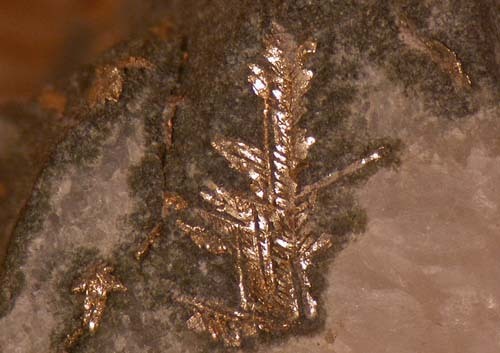 Lots of new gold specimens in the main Mineral List of the website! 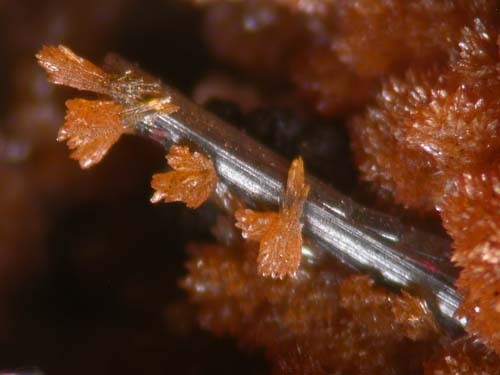 I've put a new article about collecting copper crystals on the Canadian side of Lake Superior. 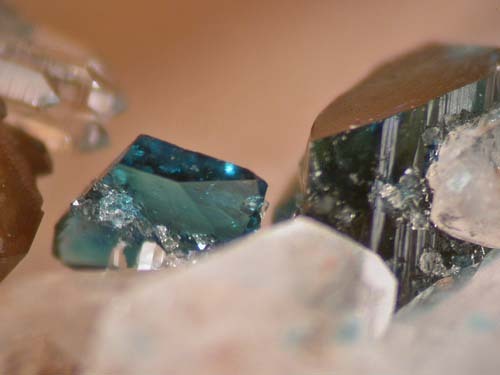 It is in the "Mineralogical Pot Pourri" section of my website. I hope that you enjoy it. 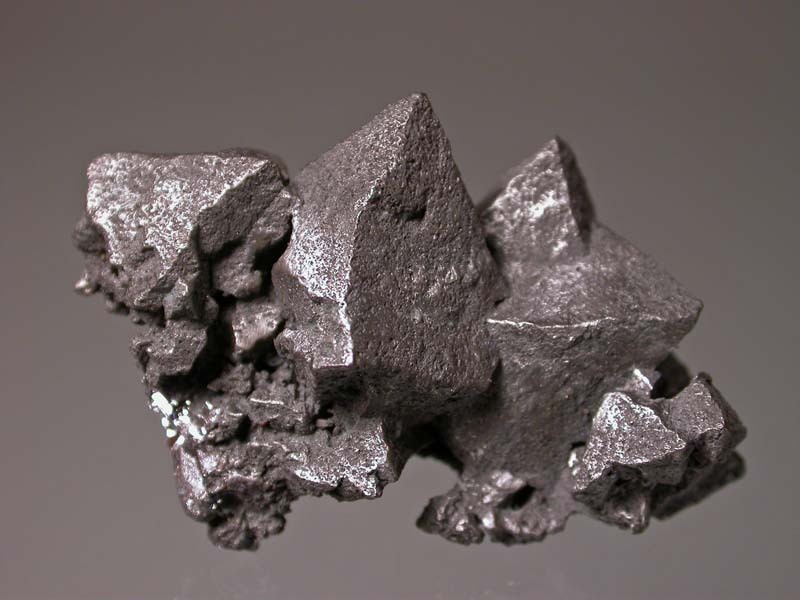 There are some great new silver specimens from the Cobalt Mining Camp, manganite crystal specimens from Atikokan and various sulphides and sulphosalts from many famous localities of the world on my website. Look for the "NEW" flags! 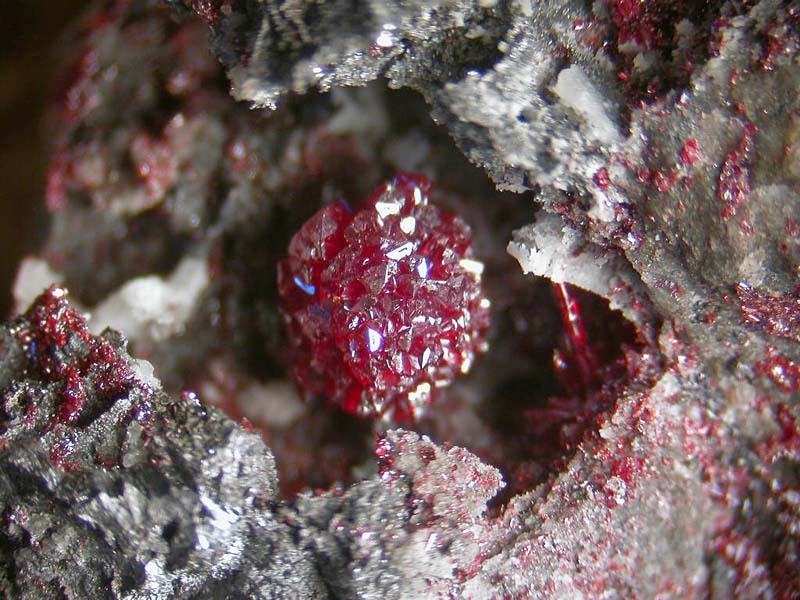 I've put a number of unique and rare minerals from Mont Saint-Hilaire on the website. 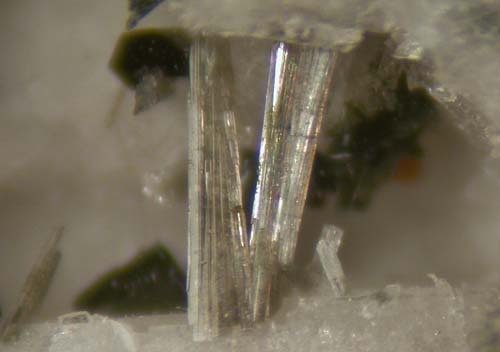 As well, I've added some excellent molybdenite specimens from Riviere Heva, Quebec. Check them out! Cubanite? We have lots in Canada! 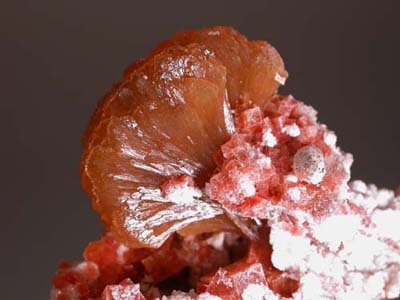 Have a look at the new article in the "Mineralogical Pot Pourri" section of my website. 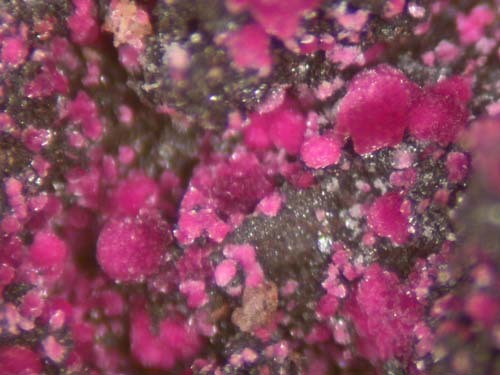 I have added a lot of specimens from the Famous Rapid Creek phospate area, Yukon Territory, to my website. 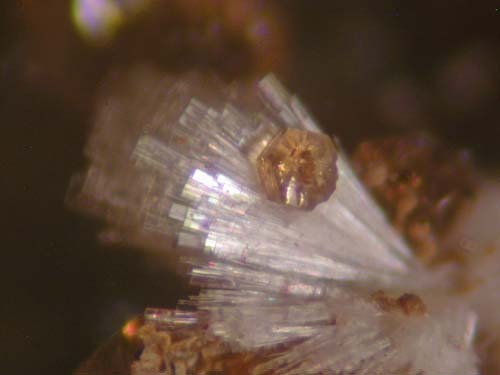 Check out satterlyite, rapidcreekite, wicksite, collinsite and more under "Yukon Phosphates" in the main Mineral List. Rapid Creek Whitlockite is actually Bobdownsite ! 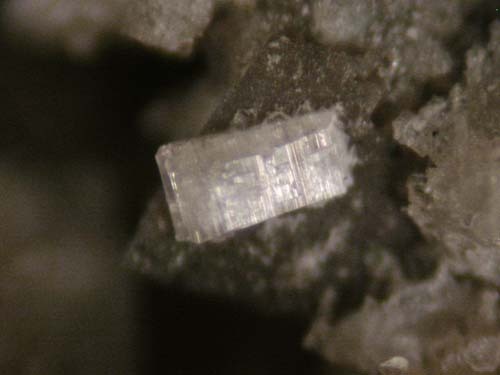 I have learned that the "whitlockite" that comes from the Rapid Creek Phosphate locality is actually bobdownsite, a new minerals that is a similar but different phosphate. Bobdownsite has no fluorine but in its molecule, an OH ion substitutes for the fluorine. 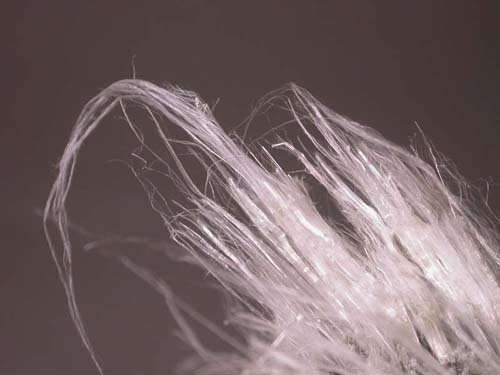 Have a look under Yukon Phosphates in the website. 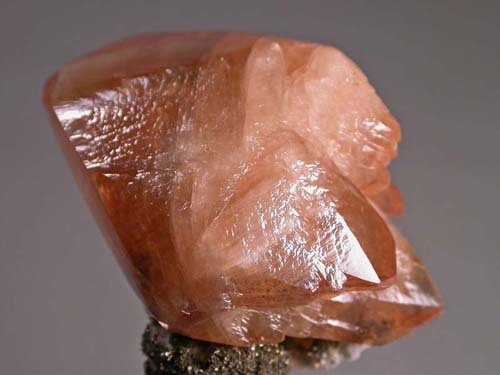 There are some great new minerals on my website including svanvergite from Mount Brusiloff Mine, beautiful orange chabazite from Nova Scotia, calcite ps after ikaite from the Arctic, lustrous pyrite from Inuvik and very nice calcite specimens from the Pine Point Mine. New Minerals from the Grenville ! I have added some great minerals from the Grenville Geological Province. 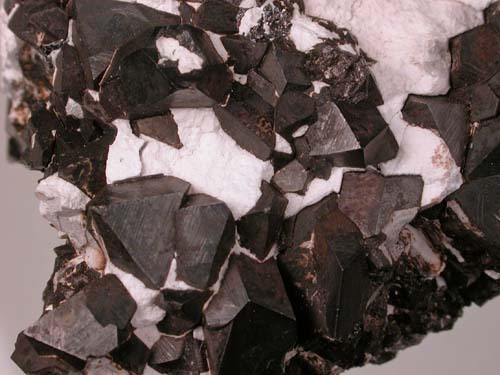 Large crystals of Fergusonite, Euxenite, Barite/Fluorite from Madoc, Titanite, etc. Many classic minerals and locations!